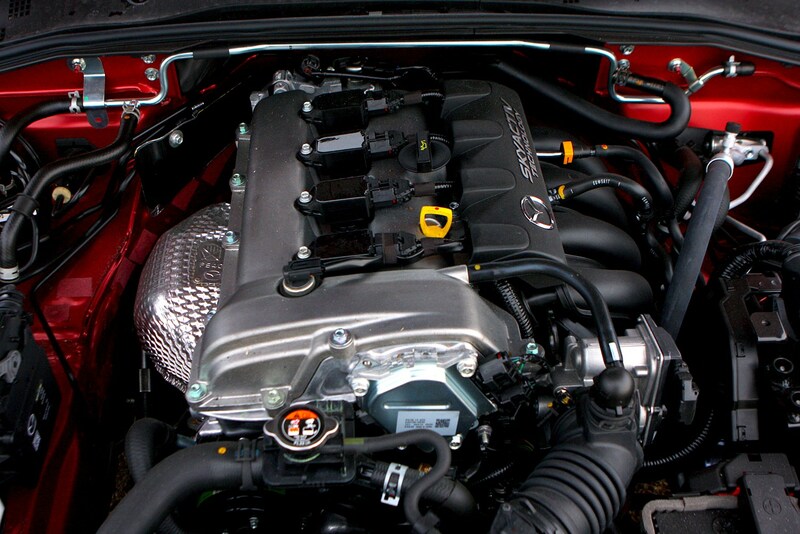 Insurance group: 25 - 32 How much is it to insure? 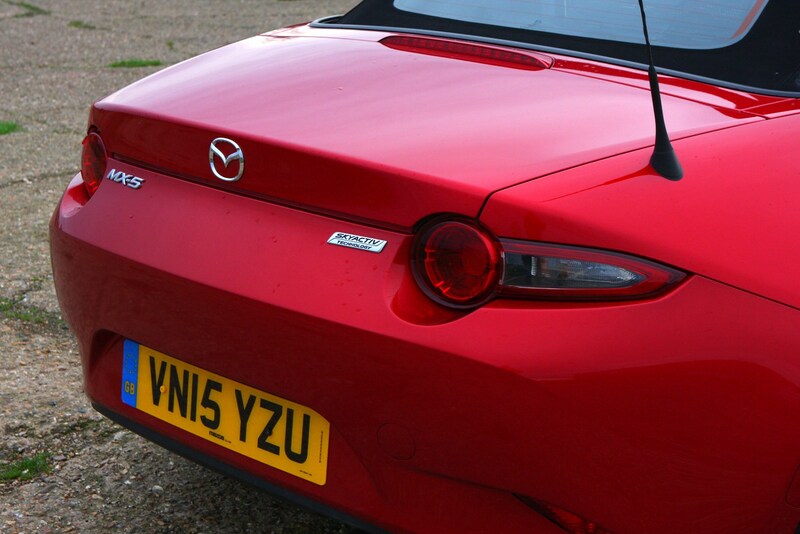 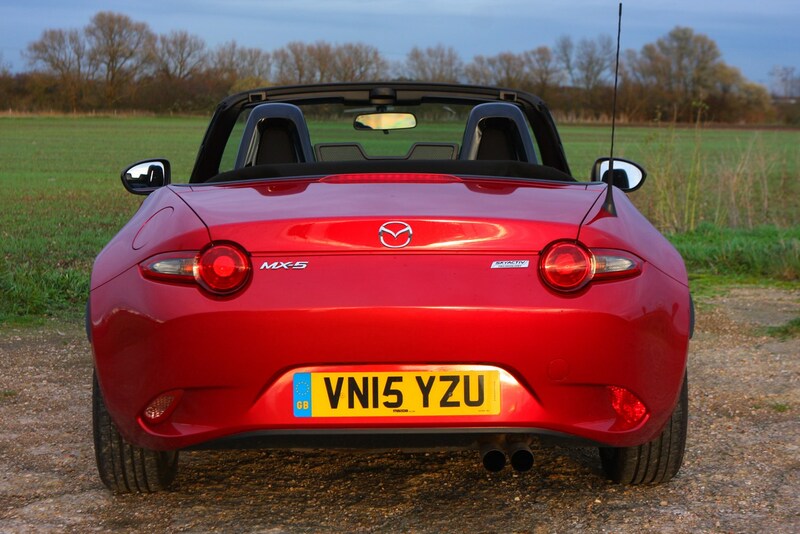 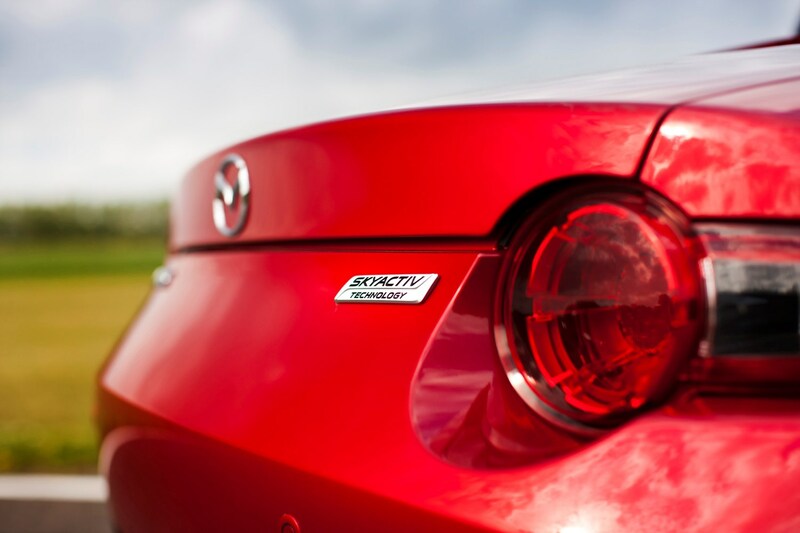 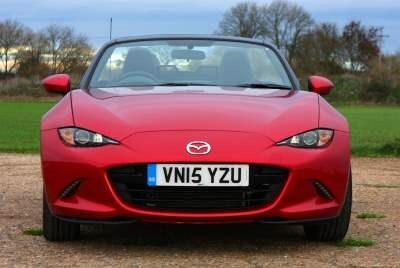 The Mazda MX-5 has been on sale since March 1990 in the UK but hit roads in Japan in 1989. 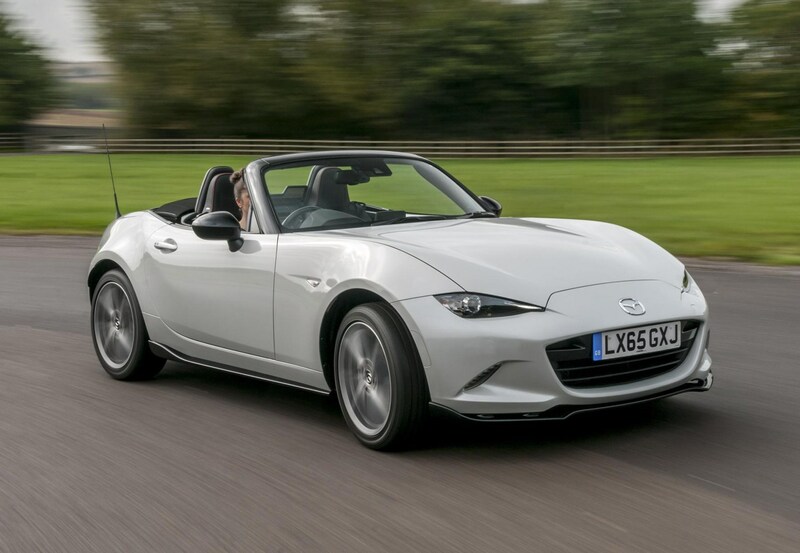 Since then, over a million examples have been sold - making it the world's most popular two-seater sportscar, known as the Mazda Miata in some markets too. 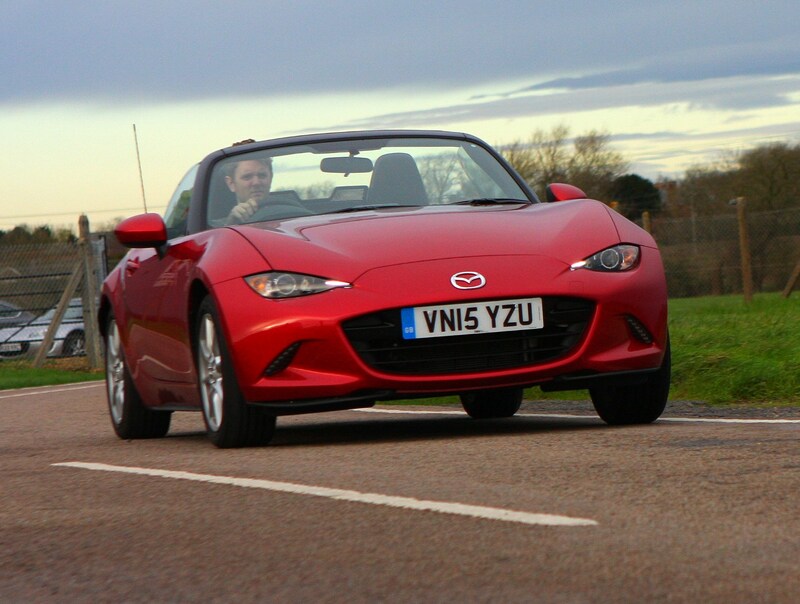 This review is all about the fourth-generation model, also known as the MX-5 Mk4 or MX-5 ND, which first went on sale in 2015. 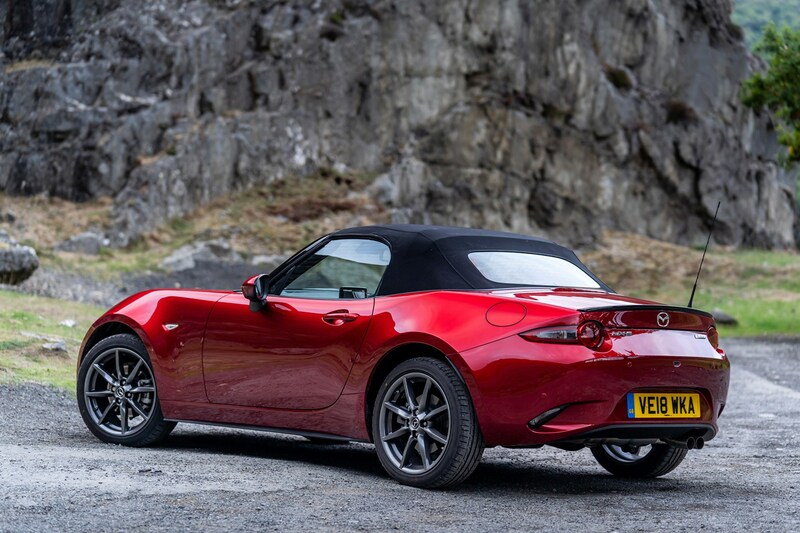 For 2018, Mazda gave the MX-5 some minor tweaks to the trim levels, and uprated the 2.0-litre SkyActiv petrol engine with more power, while the 1.5-litre unit received very minor tweaks too. 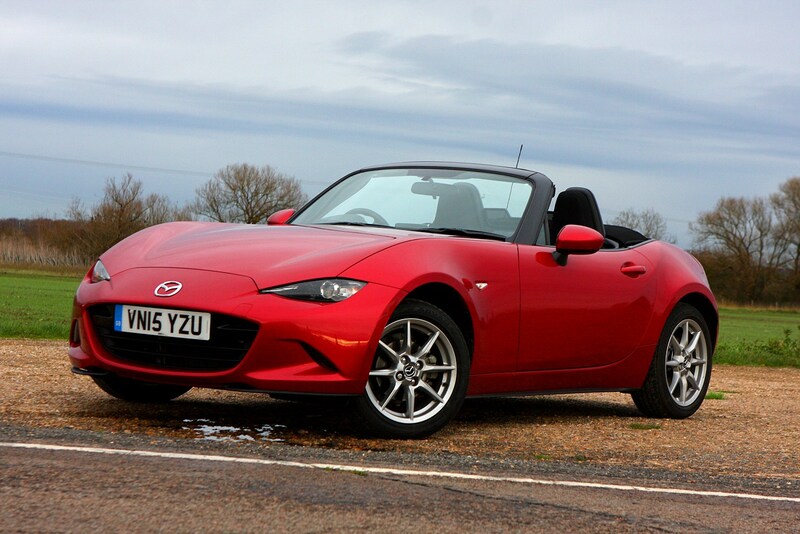 Before the update, the 1.5 was our favourite in the range, but since the changes the 2.0-litre is now our pick of the range. 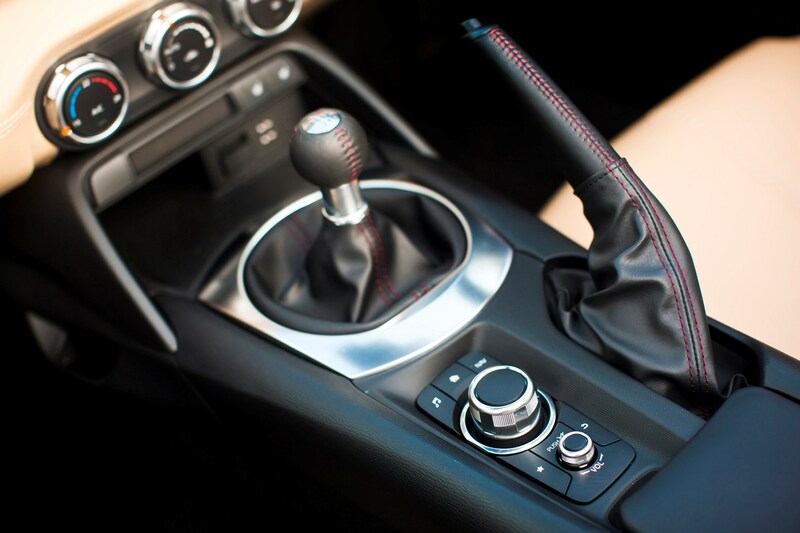 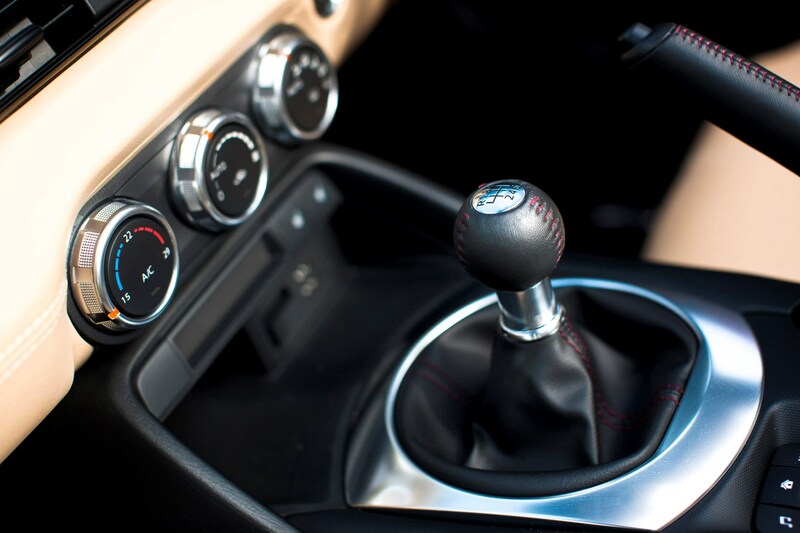 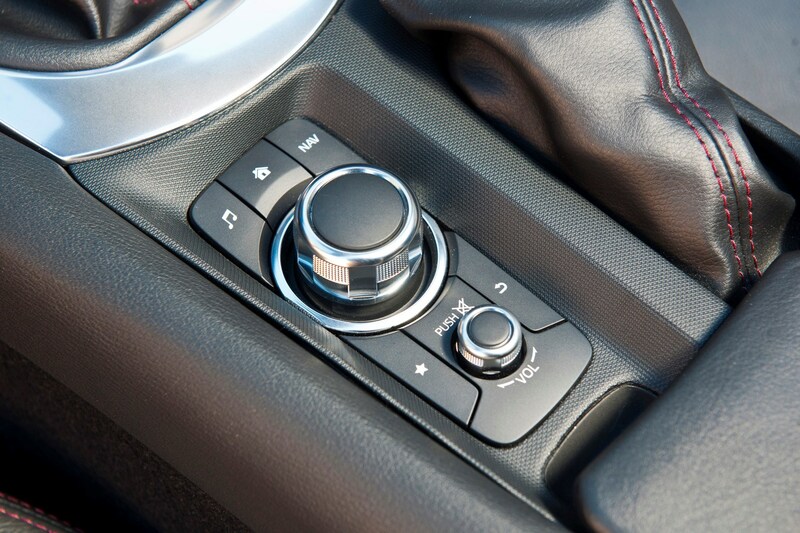 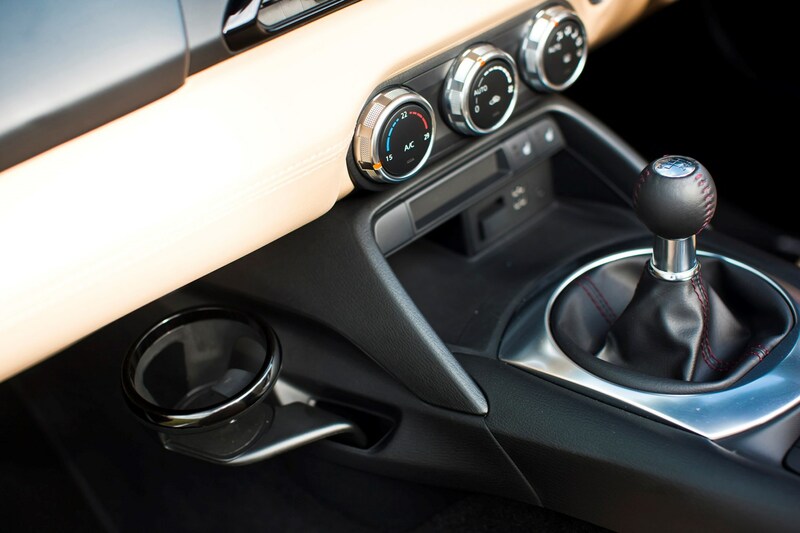 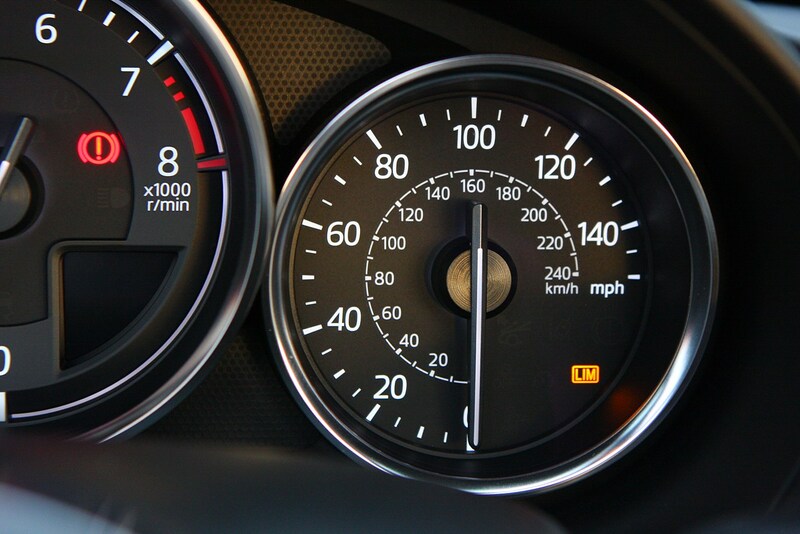 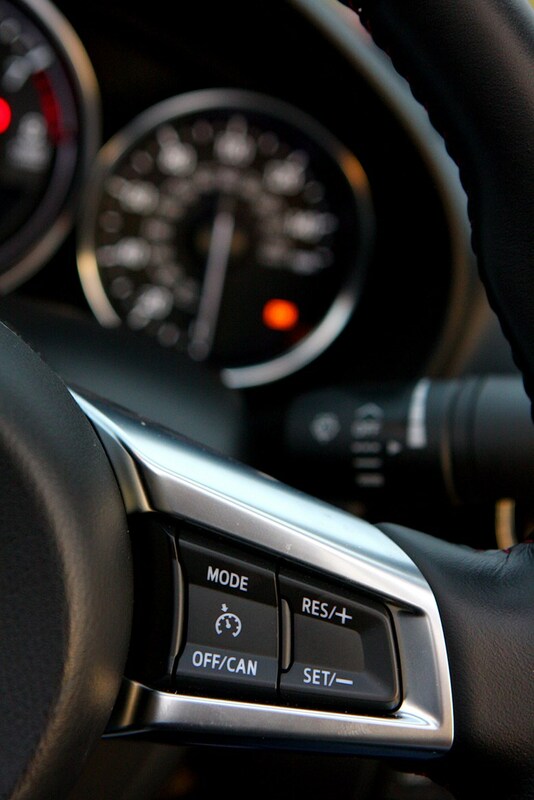 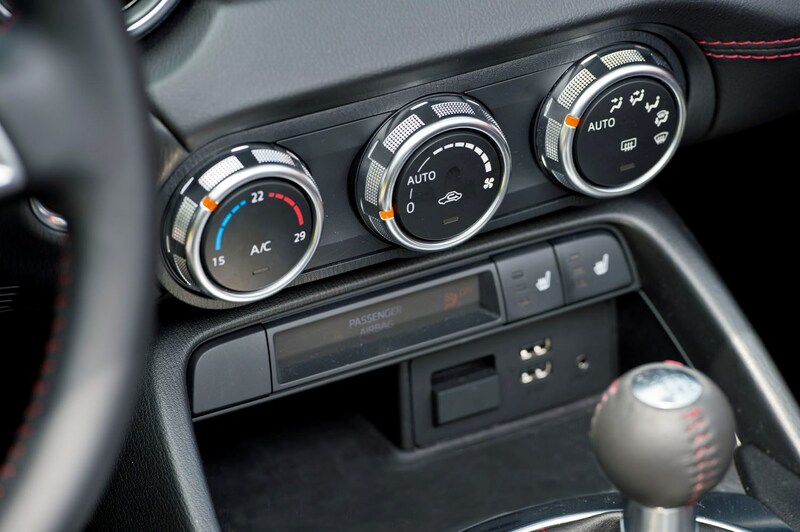 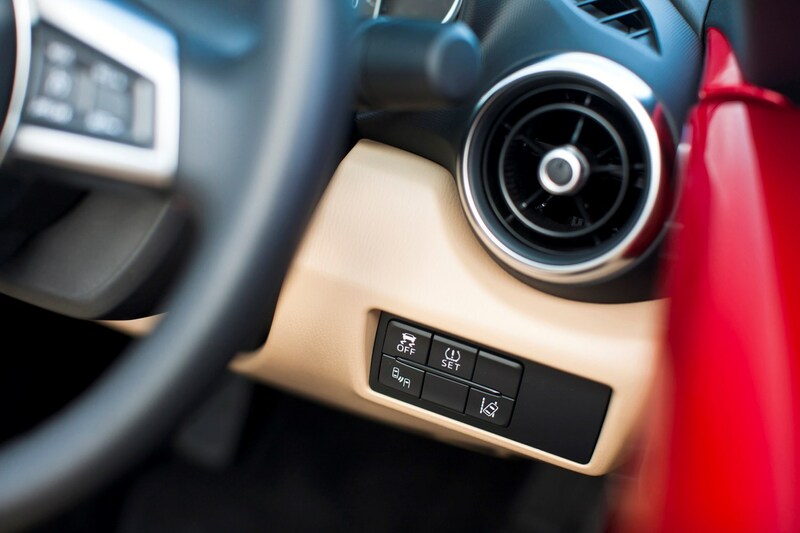 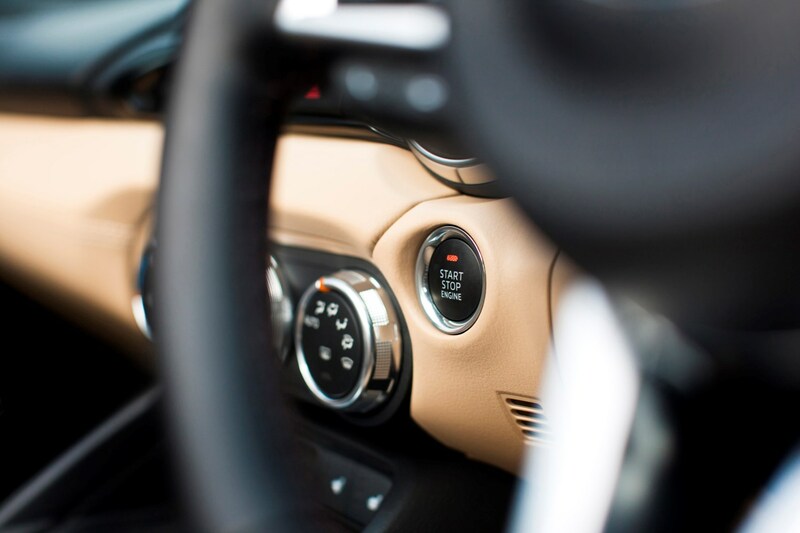 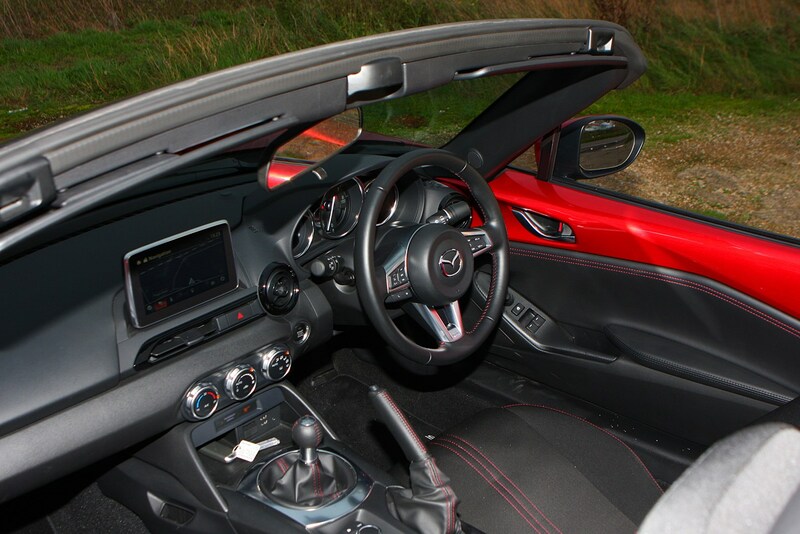 This also brought improvements to comfort, convenience and safety equipment, too - chief among these being the introduction of a reach-adjustable steering wheel for the first time, which makes finding a decent driving position so much easier than before - tall drivers struggled before this. 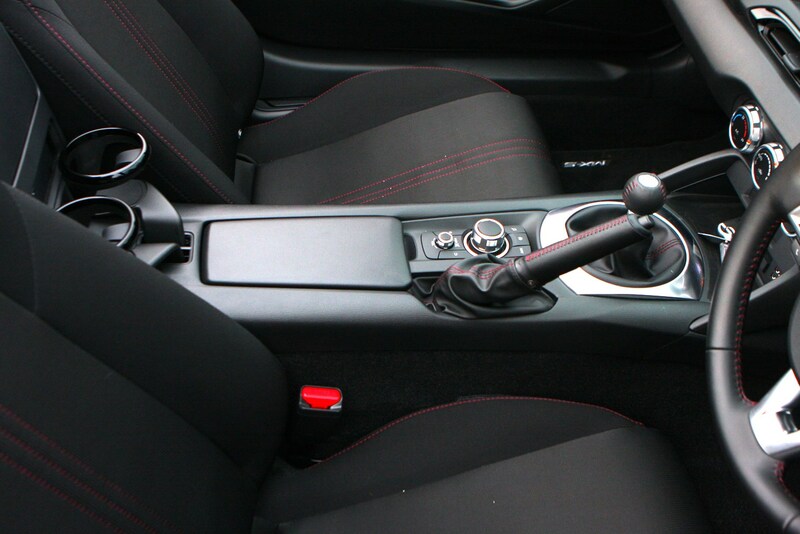 Now it's much more accessible to more drivers. 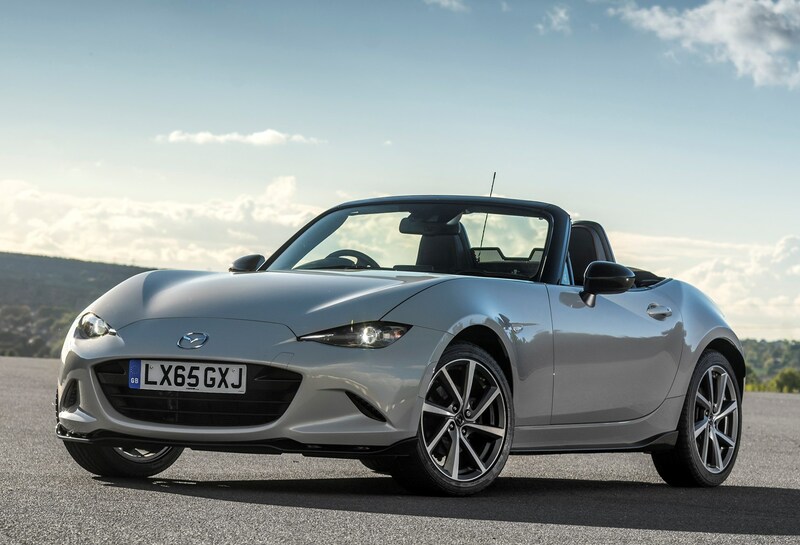 Regardless of model year, the MX-5 has always been a compact, highly affordable, rear-wheel drive machine that puts driver enjoyment right at the centre of its appeal, and one that you don't have to be driving quickly to truly enjoy. 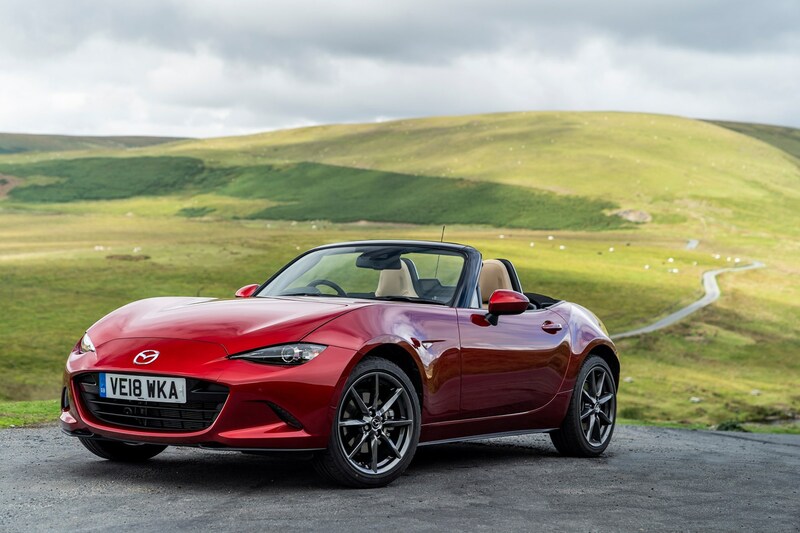 For Mazda to have sold over a million MX-5s is quite some achievement, given that two-seater sports cars are hardly a mainstream choice. 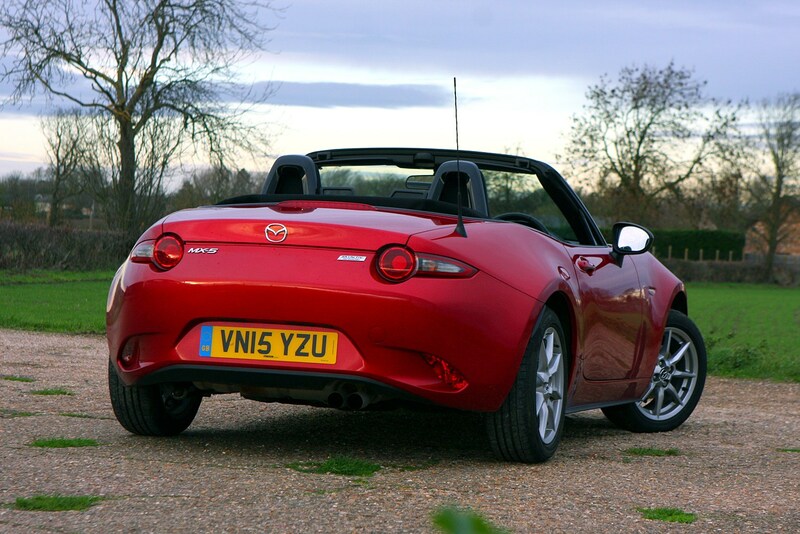 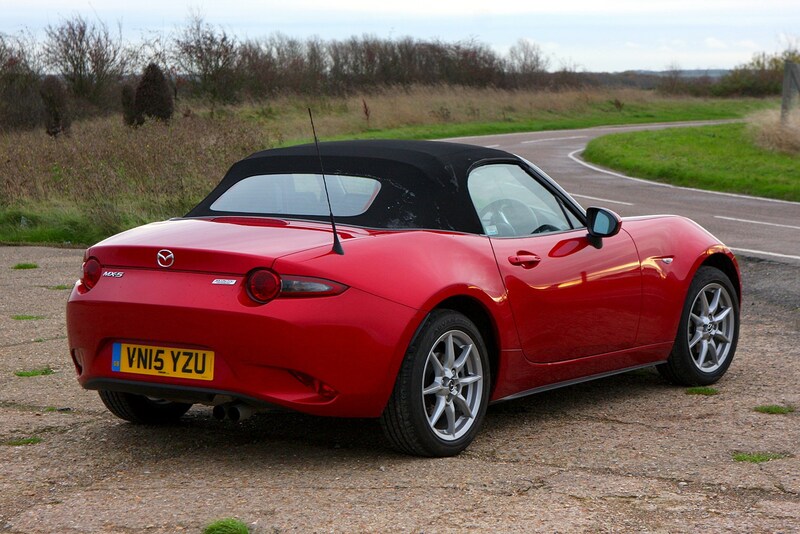 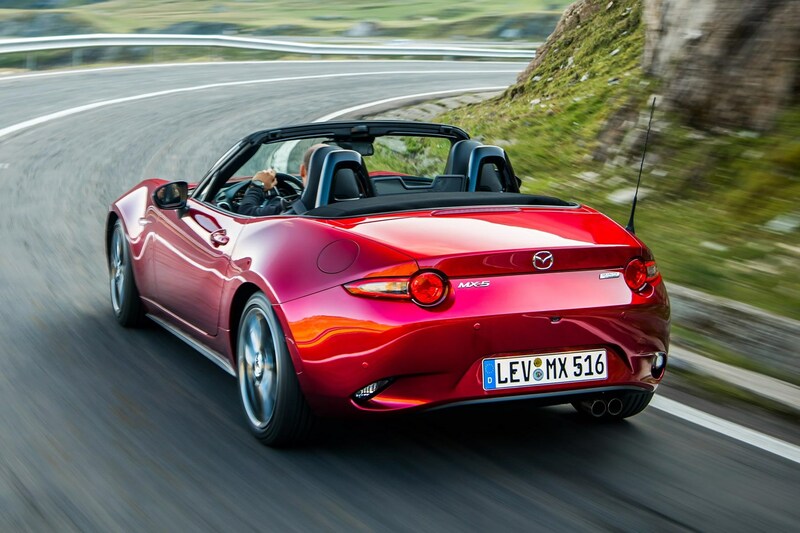 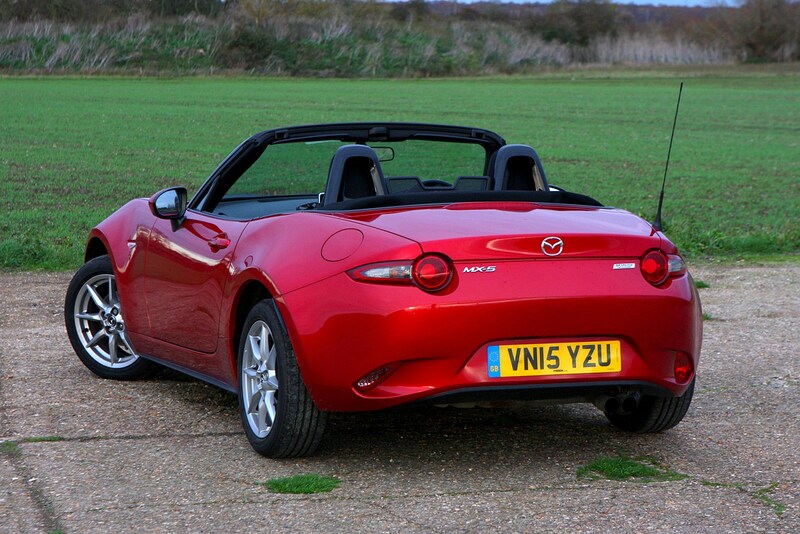 In fact, roadsters are so uncommon these days that the MX-5 has few direct rivals. 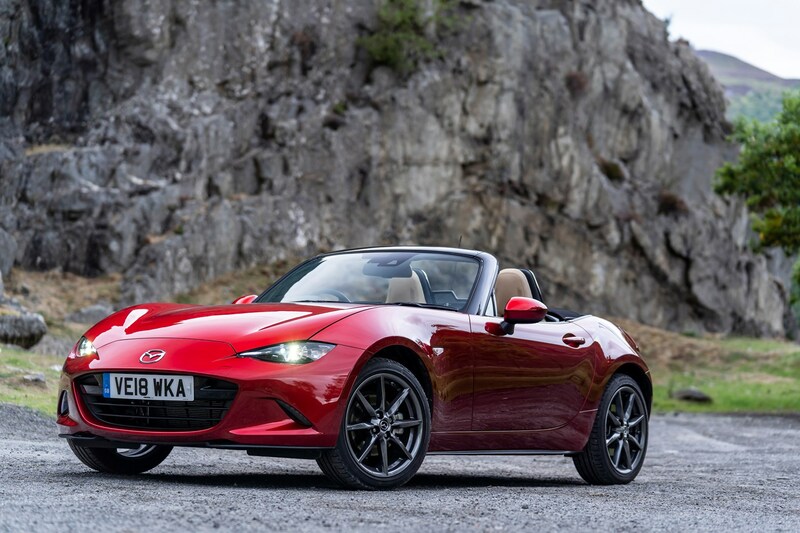 Most obvious are the Fiat 124 Spider and its high-performance Abarth 124 Spider cousin, both of which were developed in conjunction with the MX-5 and are based on similar underpinnings - you'll certainly find the interior familiar in the Fiat, as it's exactly the same as the Mazda's. 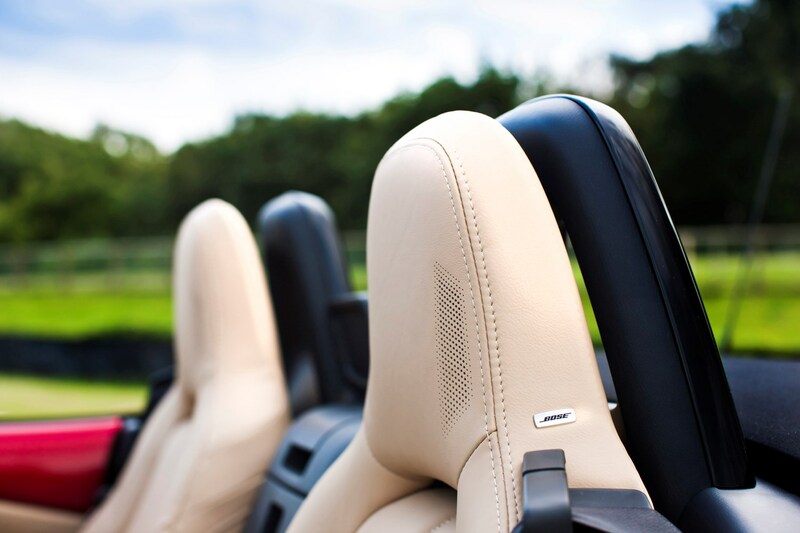 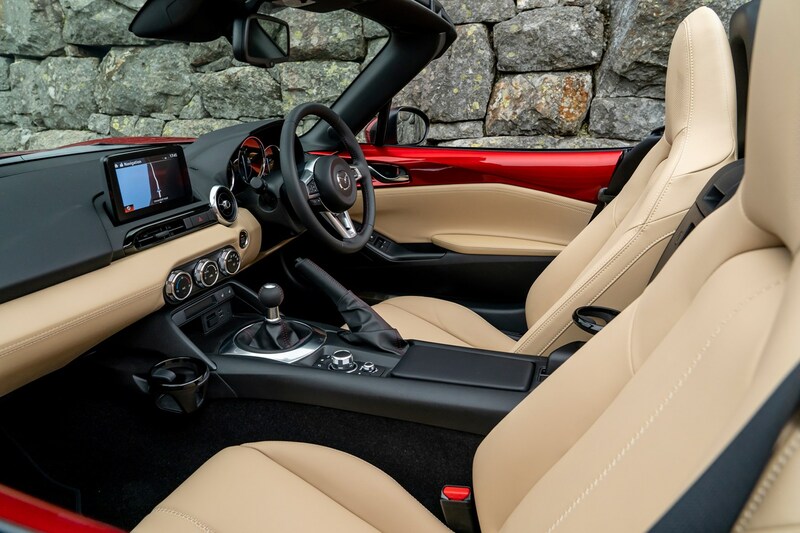 If you're looking for a more premium experience, the Audi TT Roadster, BMW Z4 Roadster and Mercedes-Benz SLC are also small, two-seater convertibles. 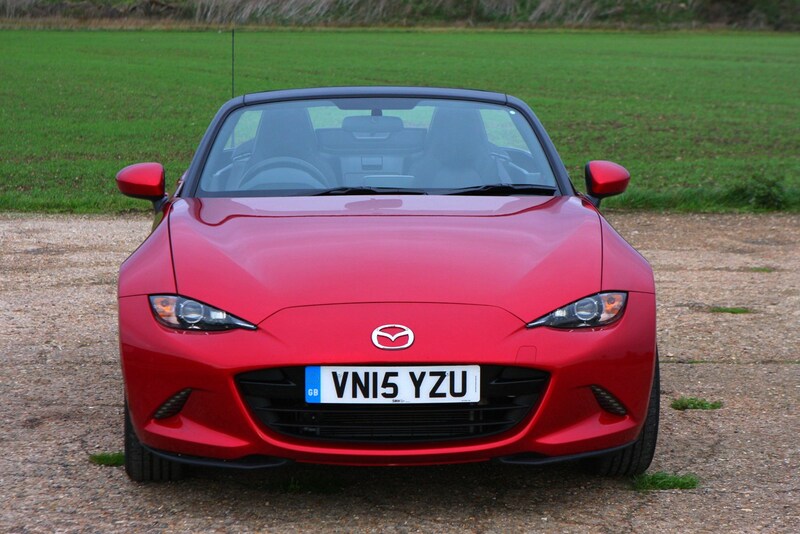 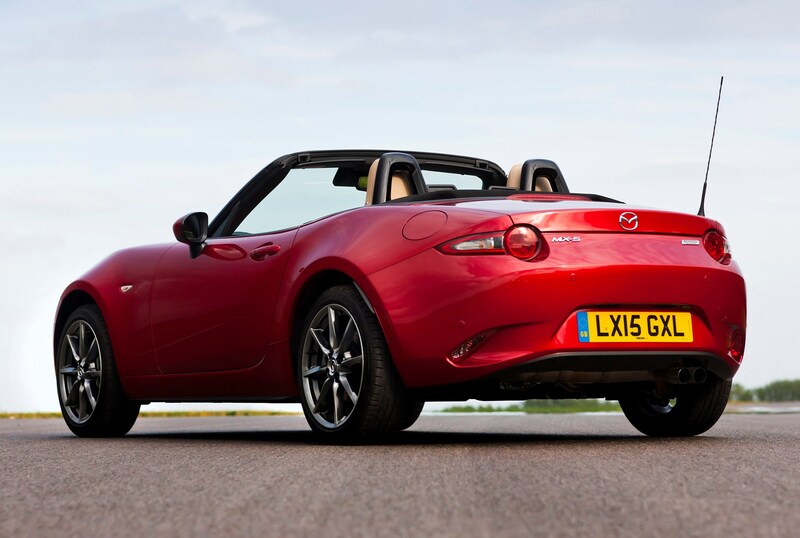 But compared to the diminutive MX-5, all of these are larger, more powerful and significantly more expensive. 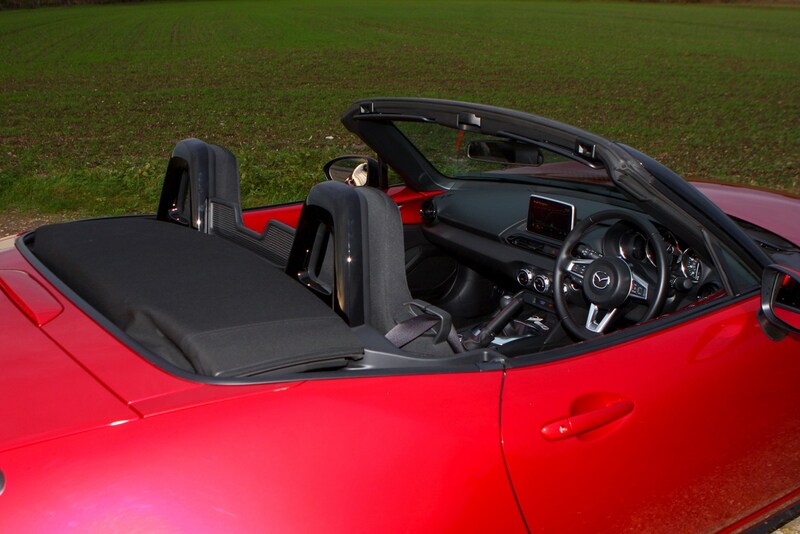 Not so concerned about the open roof element but still want a compact, fun to drive car? 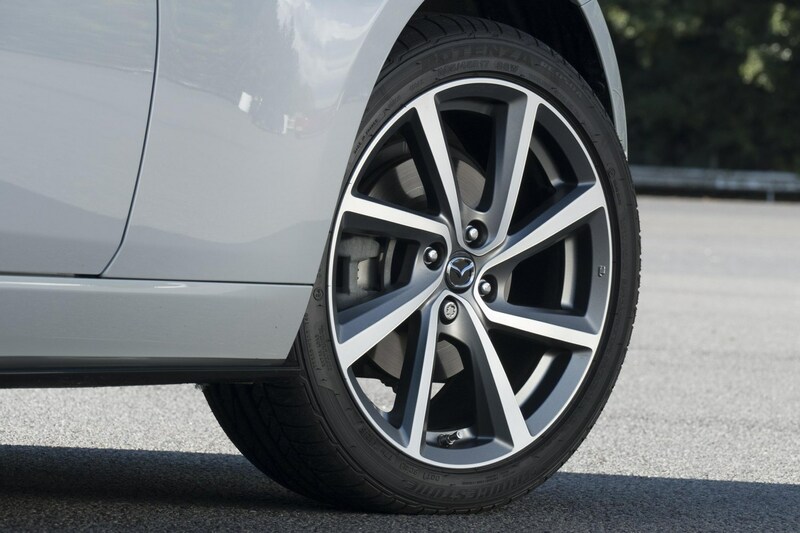 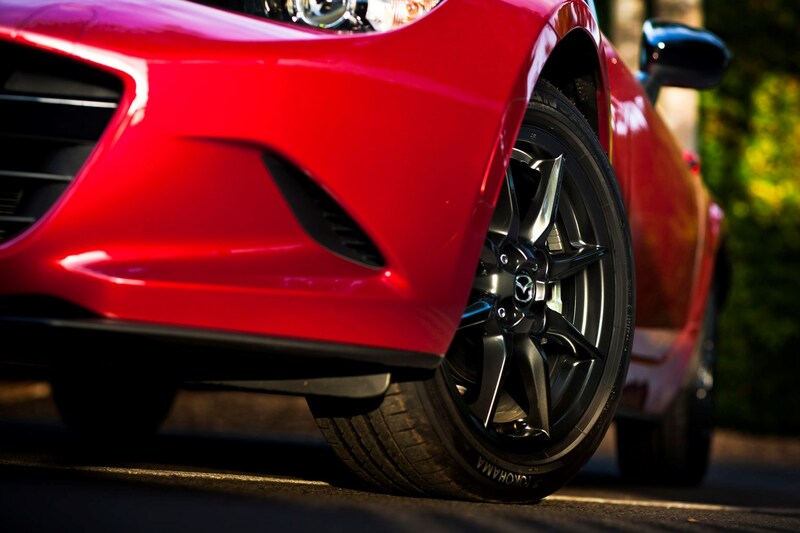 Then the Toyota GT86 coupe and its closely related Subaru BRZ cousin are an excellent rear-wheel drive alternatives. 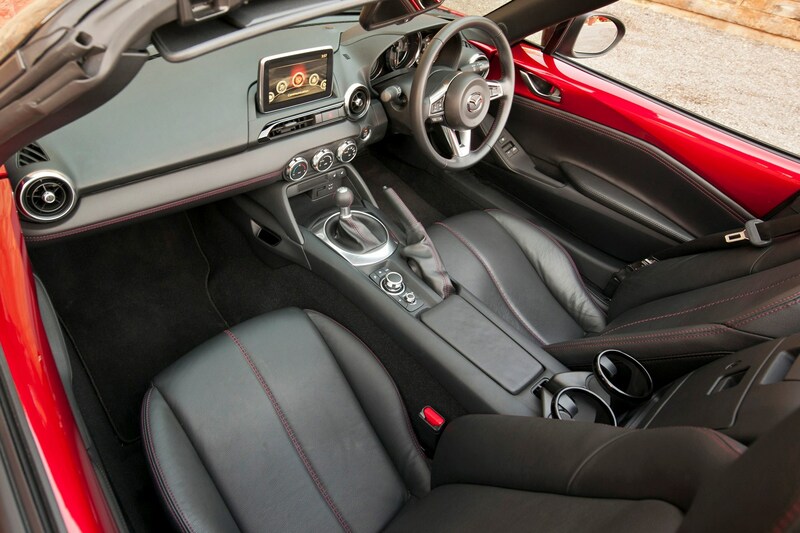 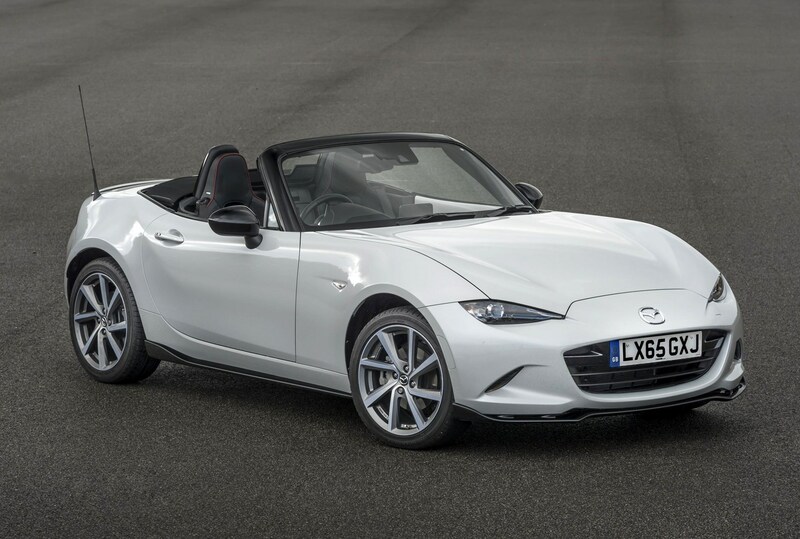 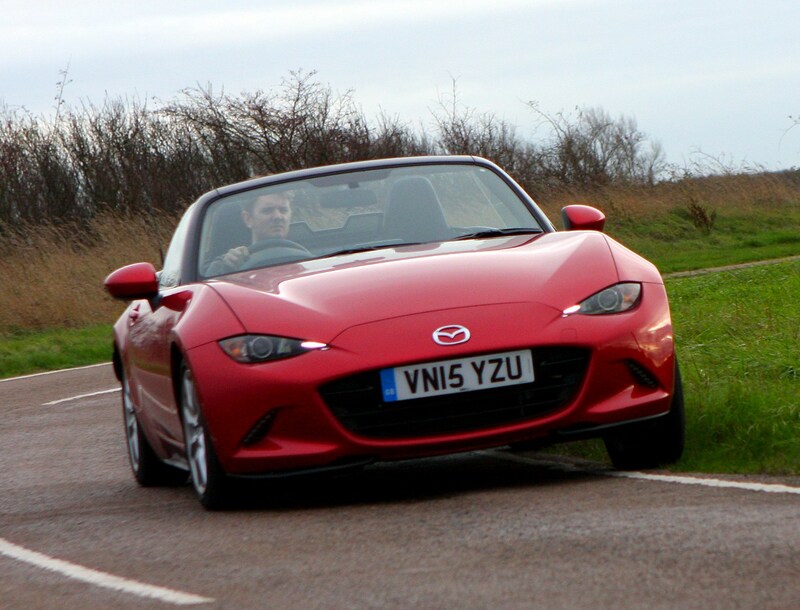 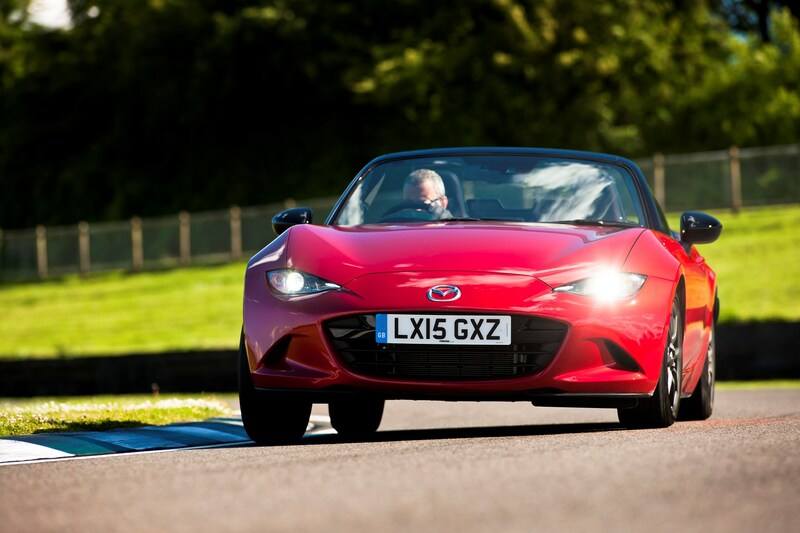 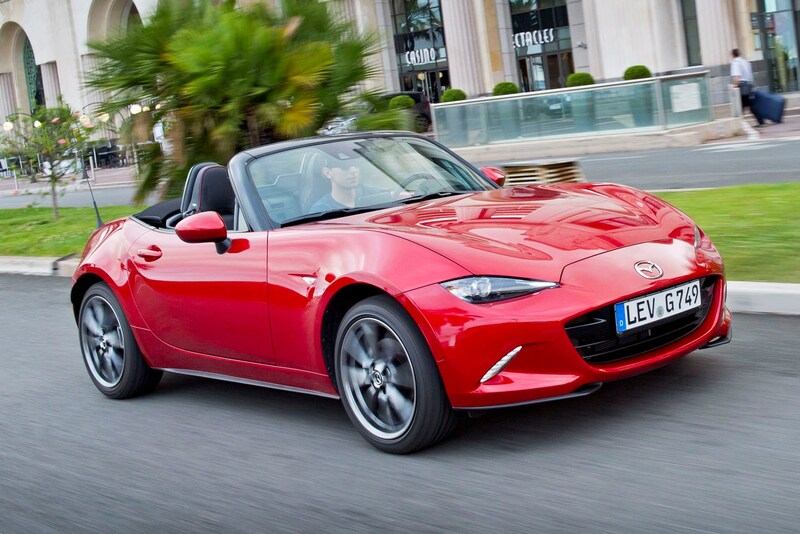 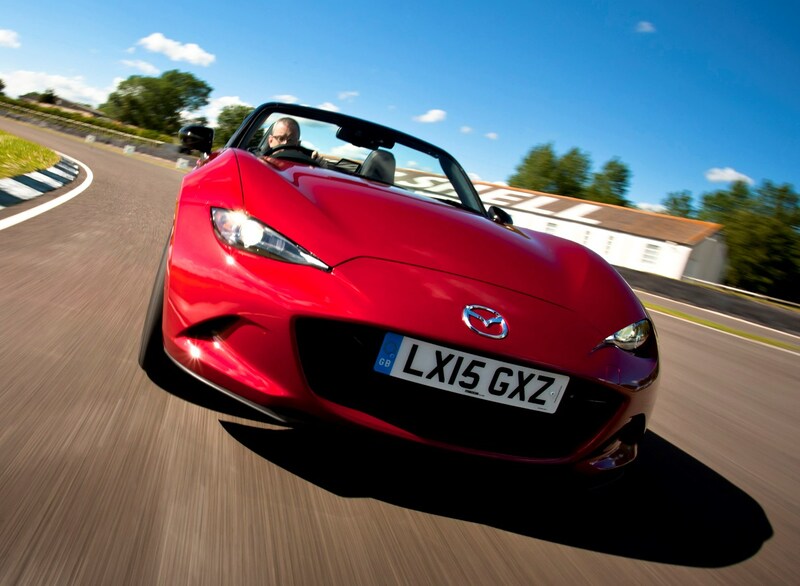 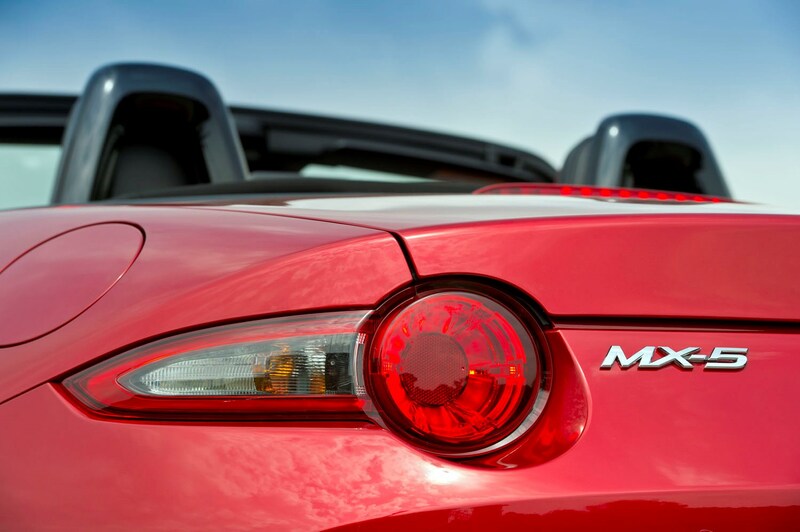 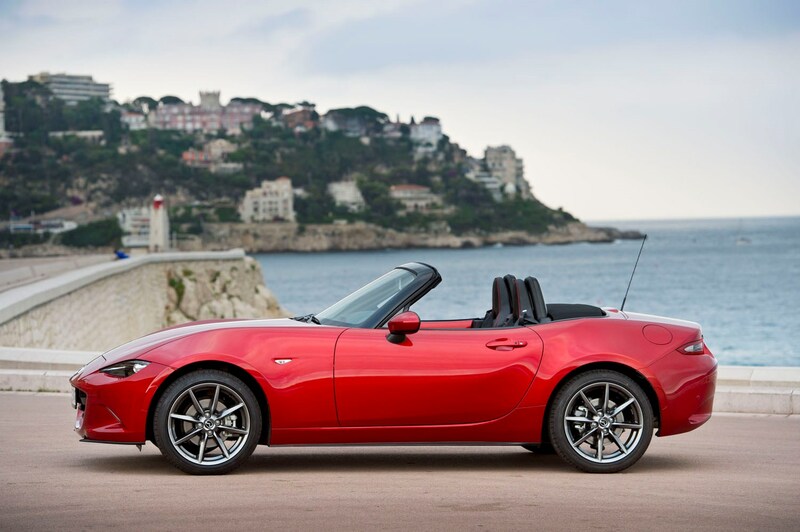 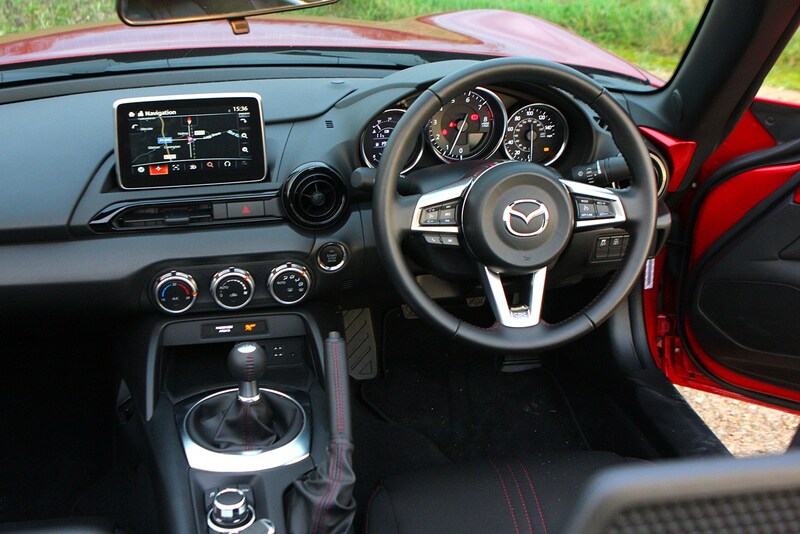 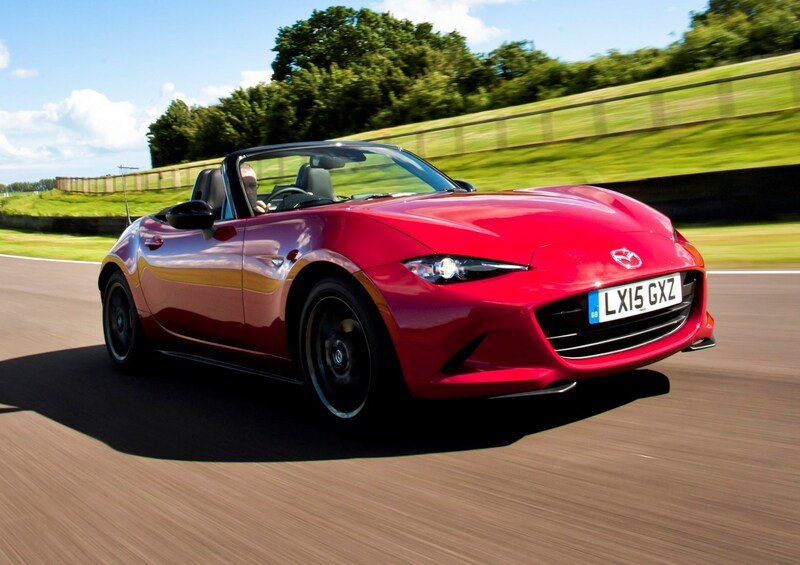 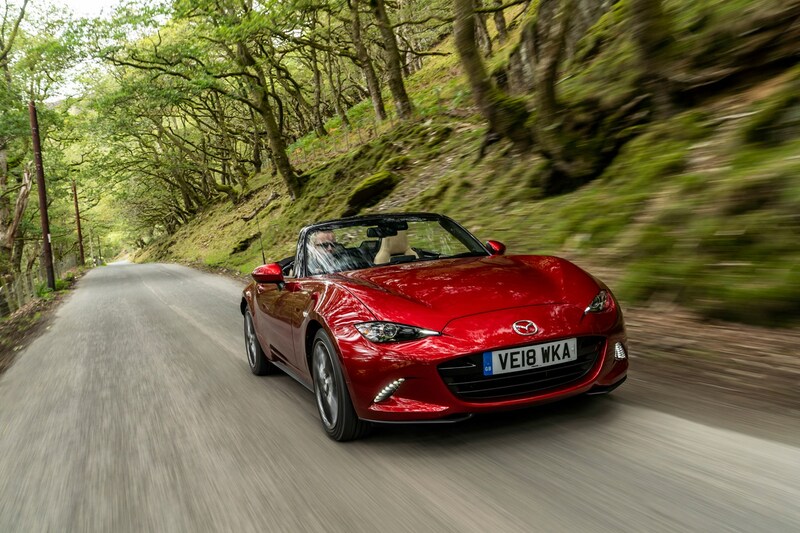 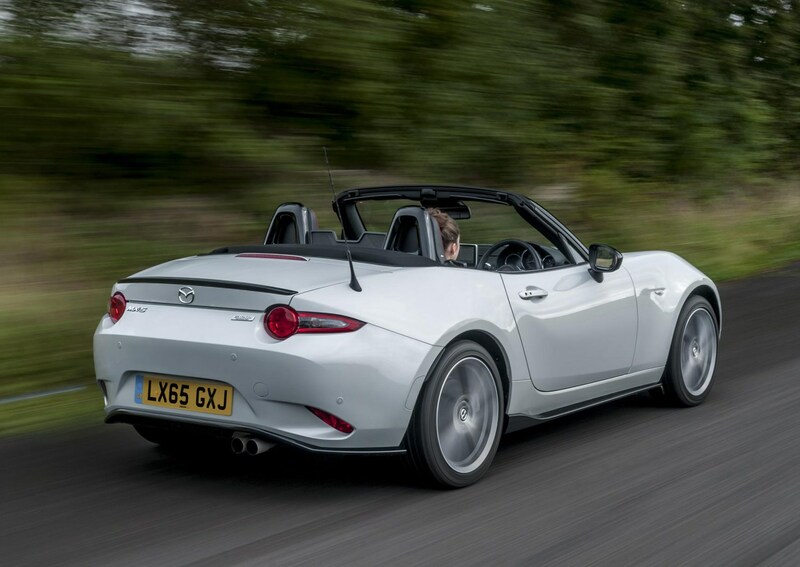 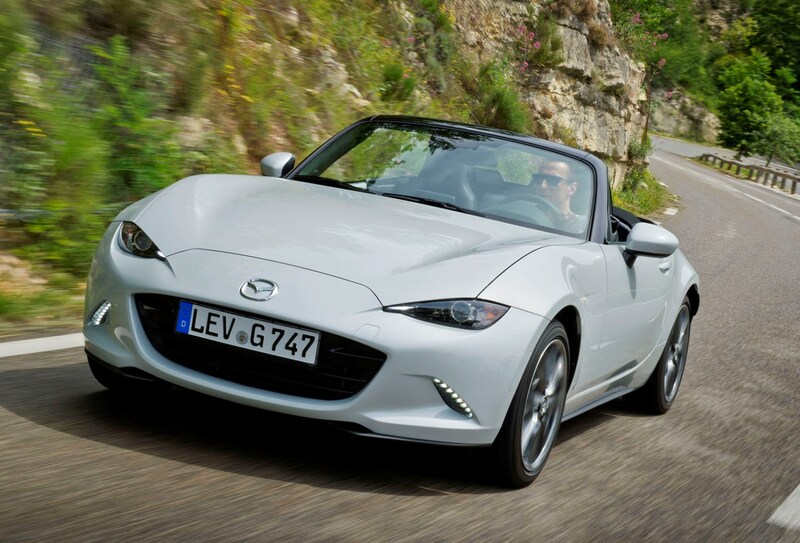 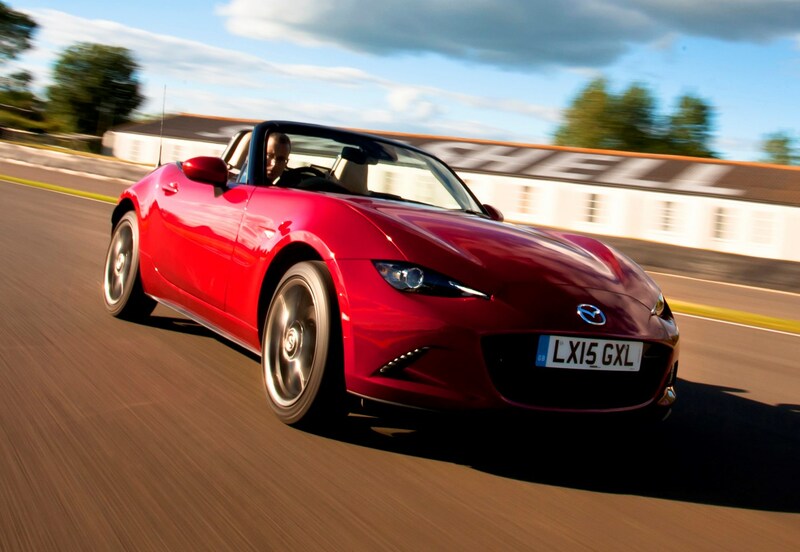 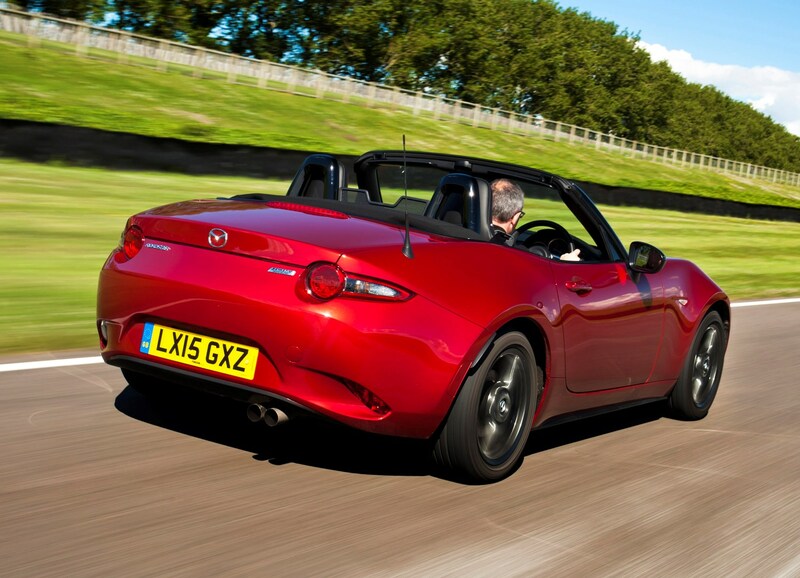 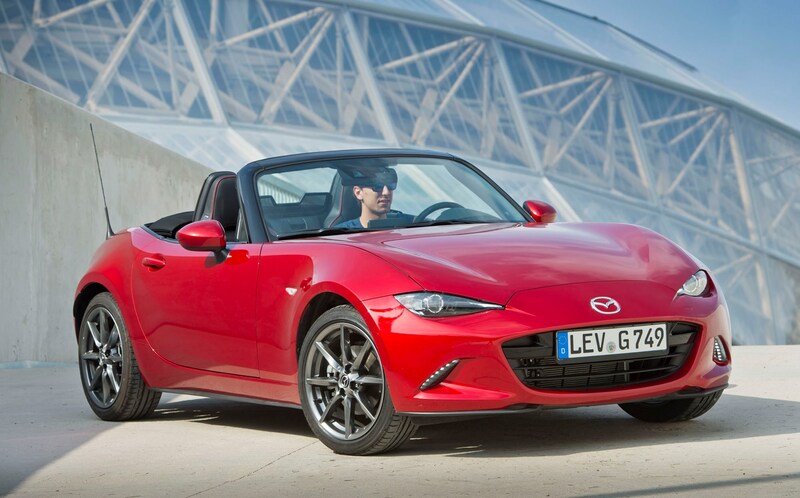 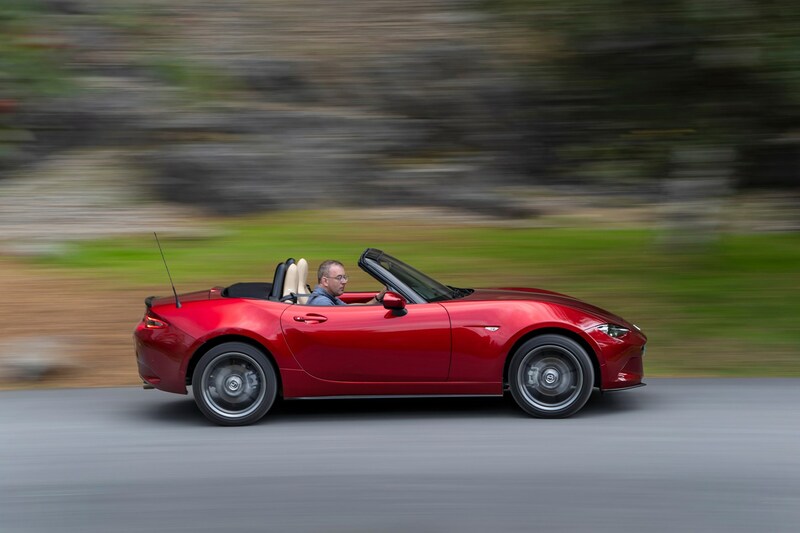 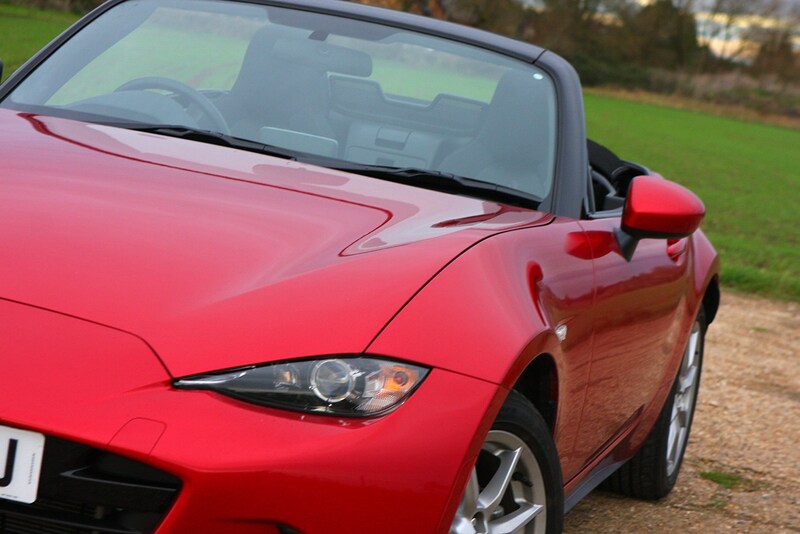 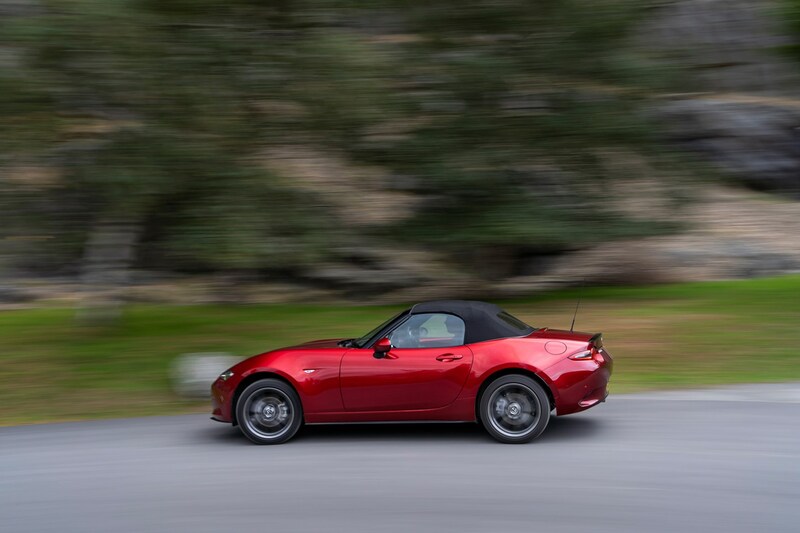 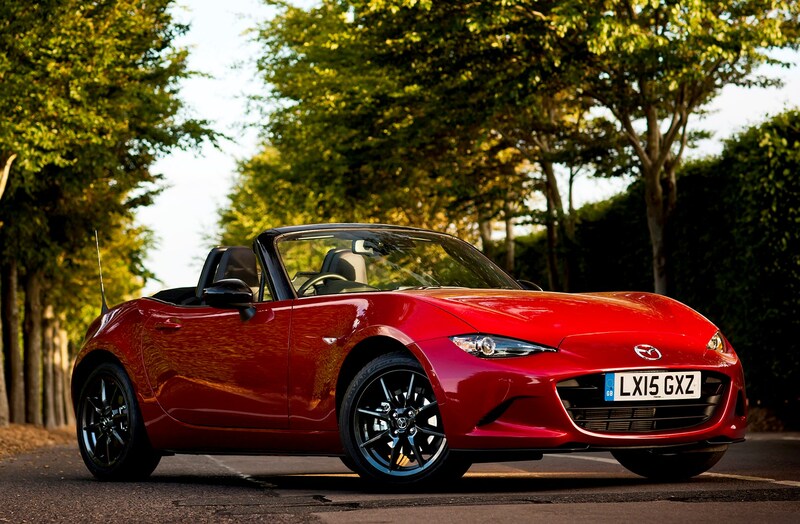 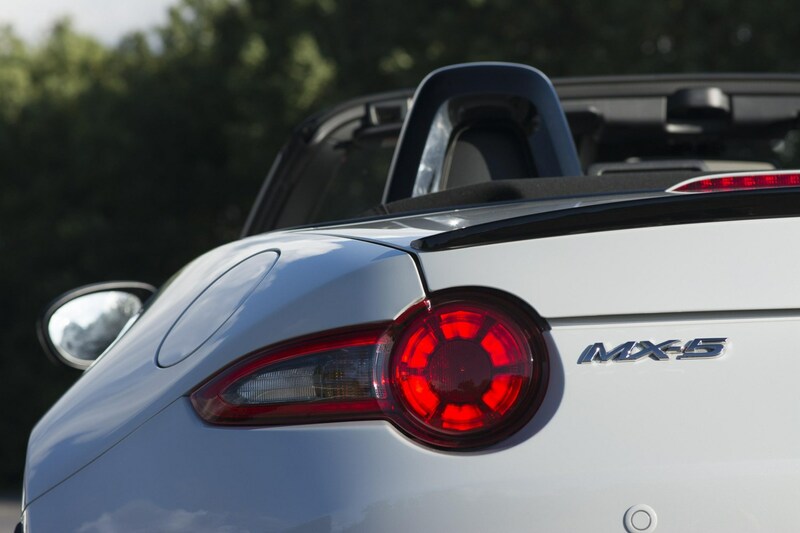 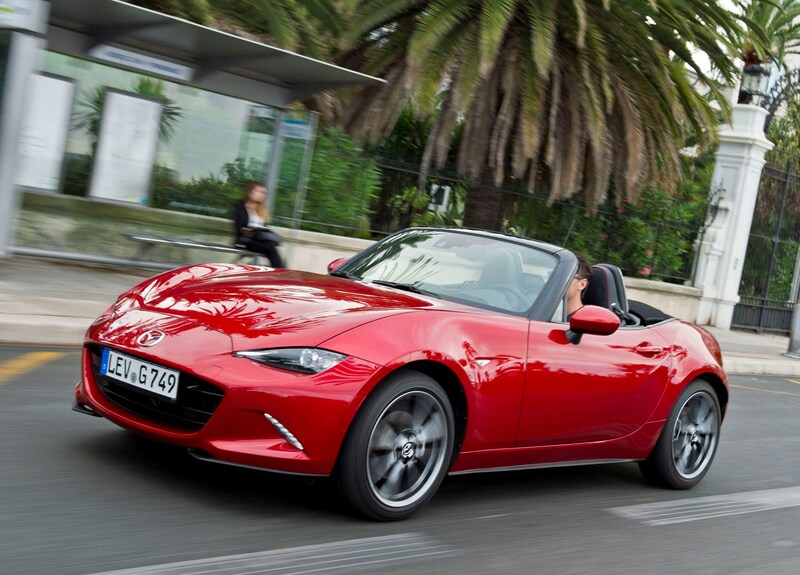 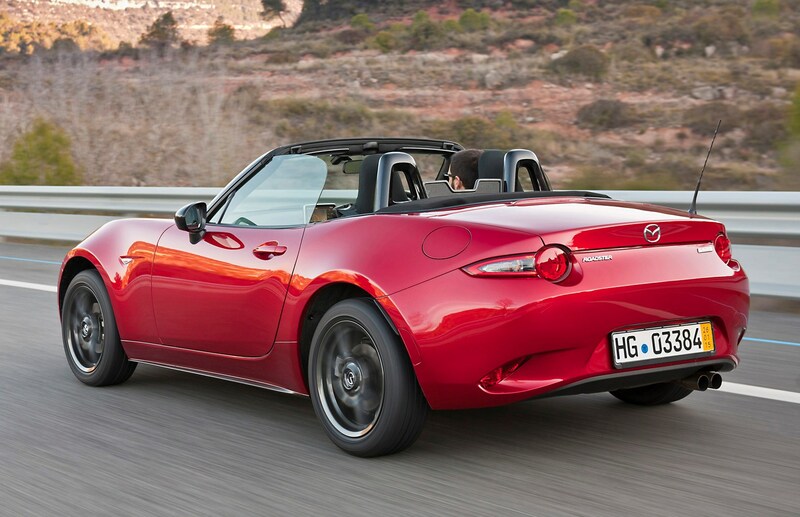 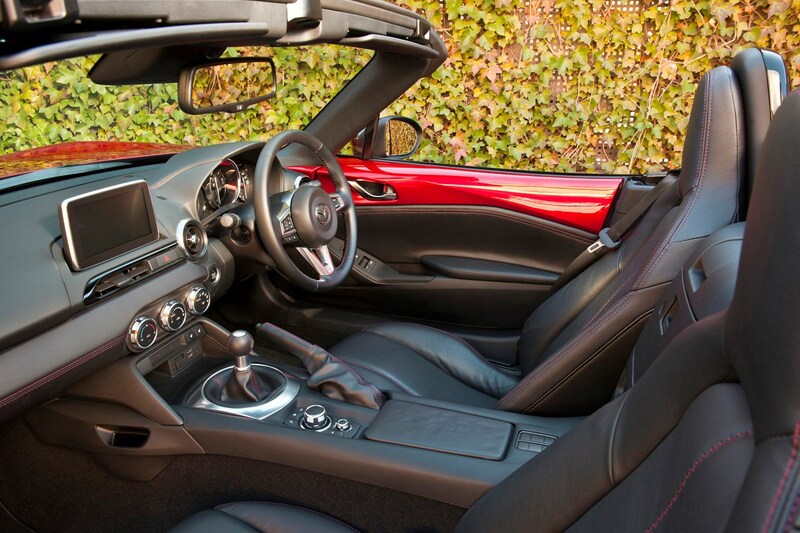 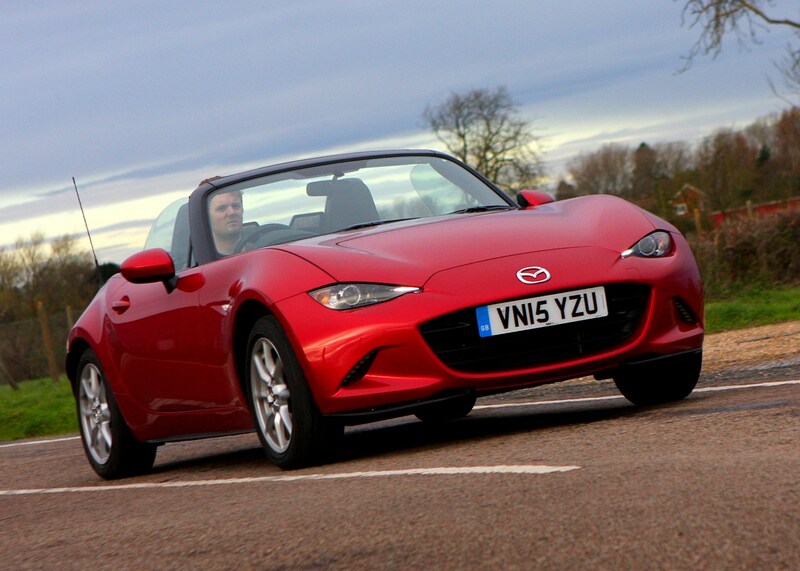 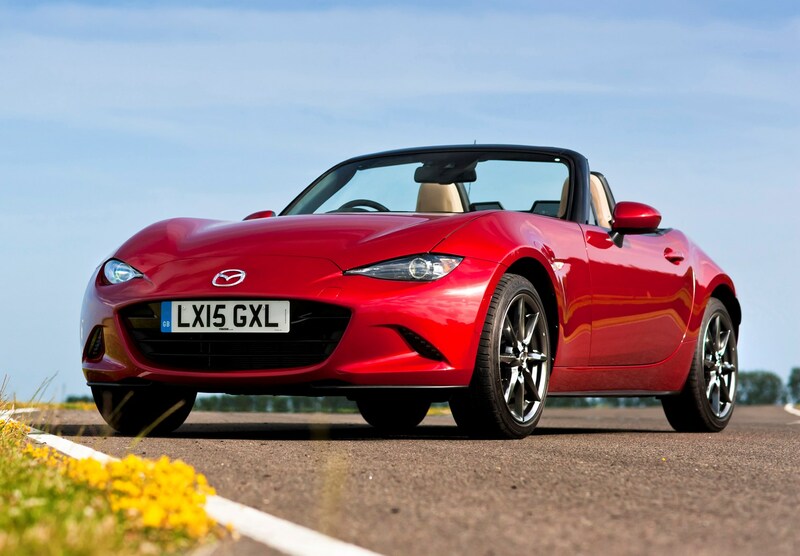 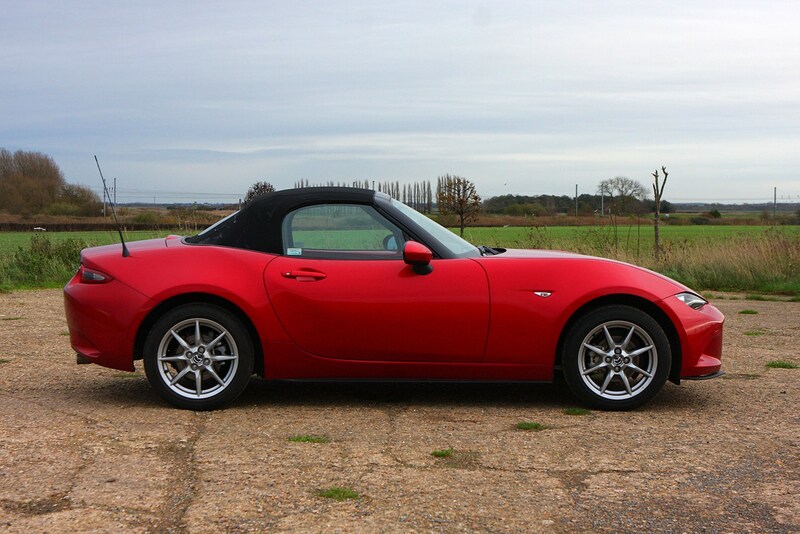 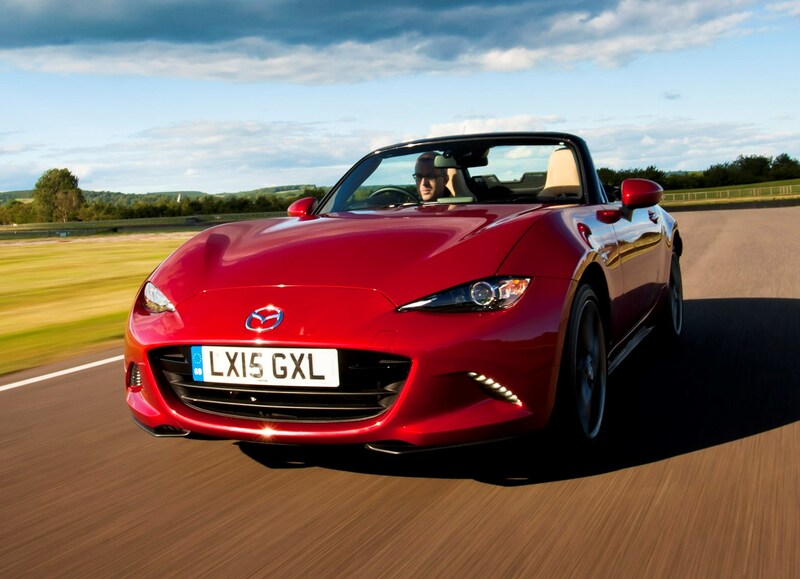 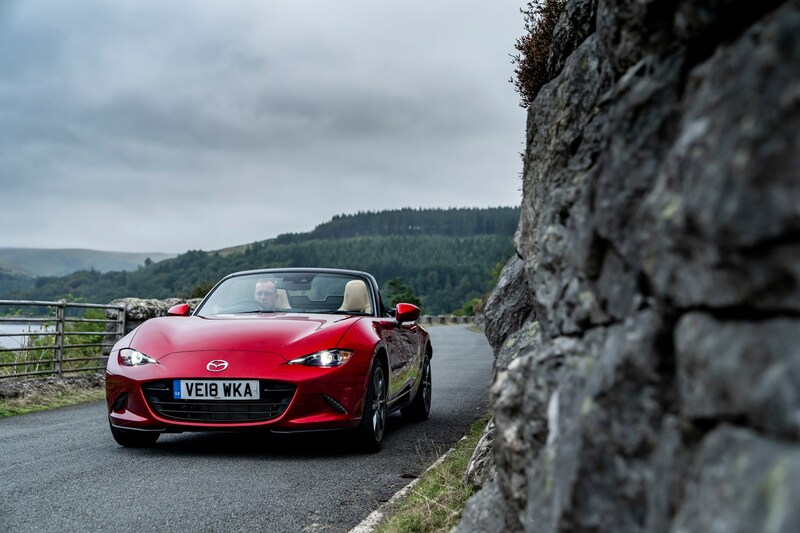 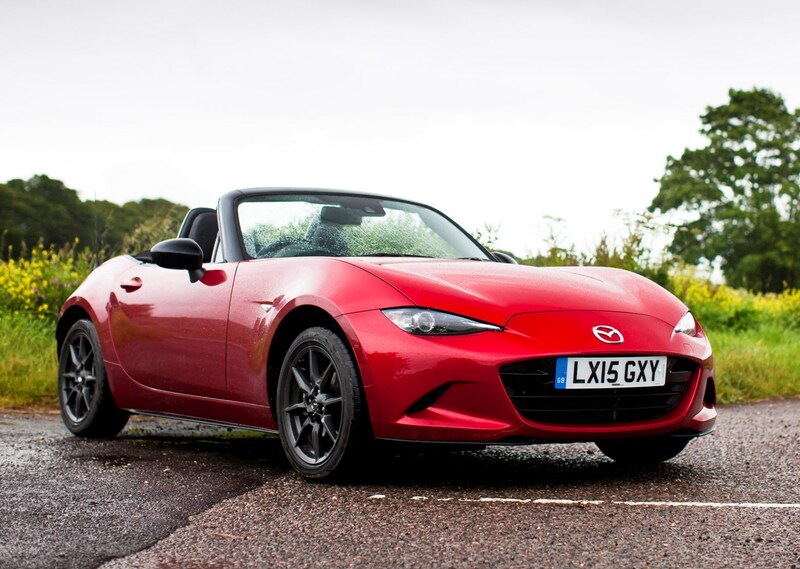 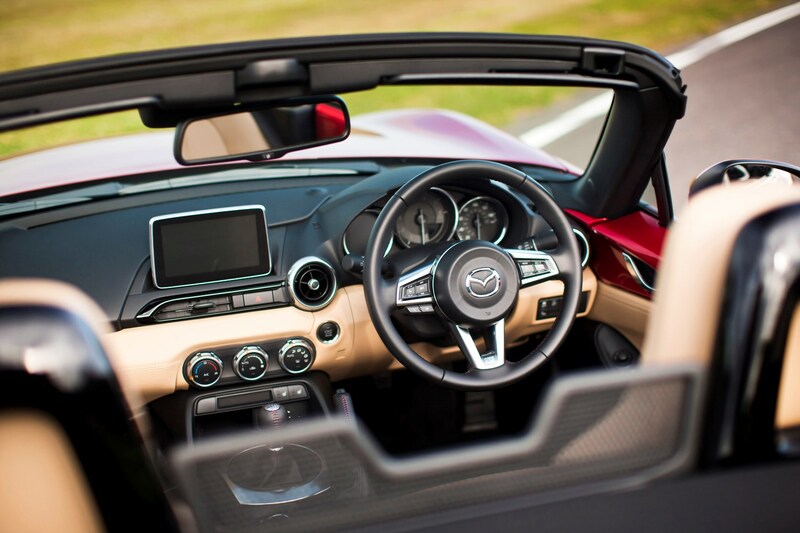 Or you could stay in-house and opt for the MX-5 RF, which features a folding hard-top. 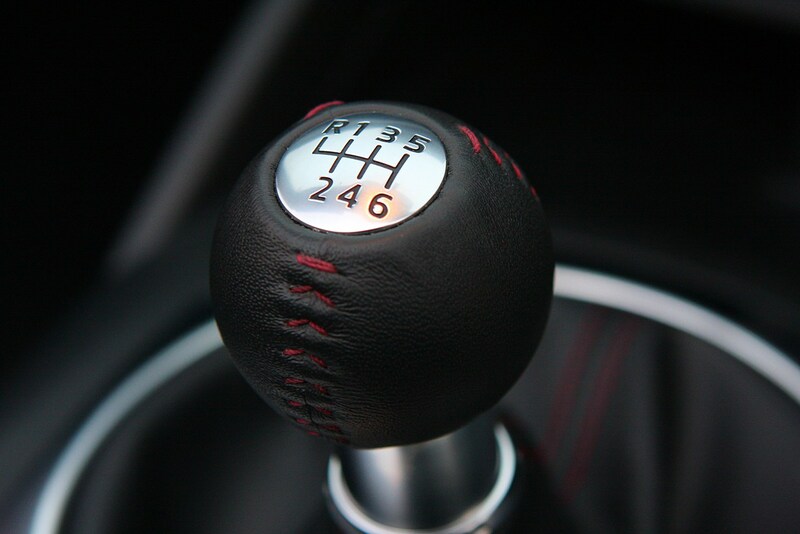 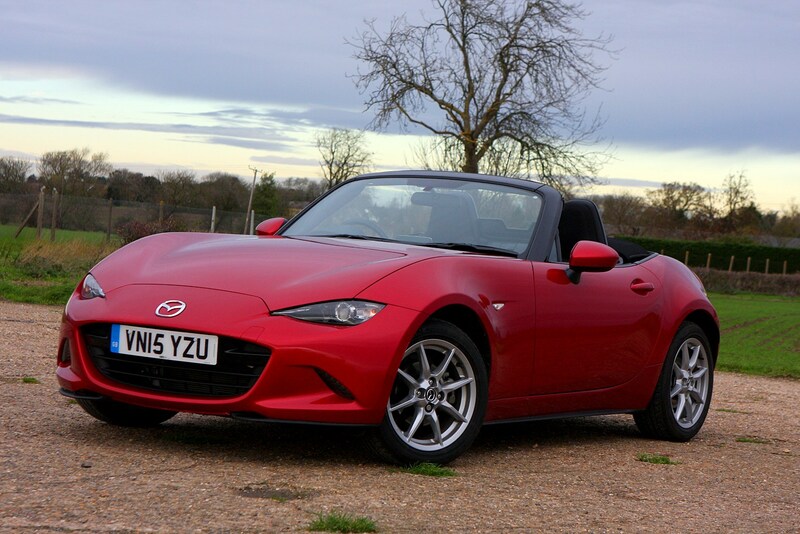 Simply looking for a small, fun to drive car? 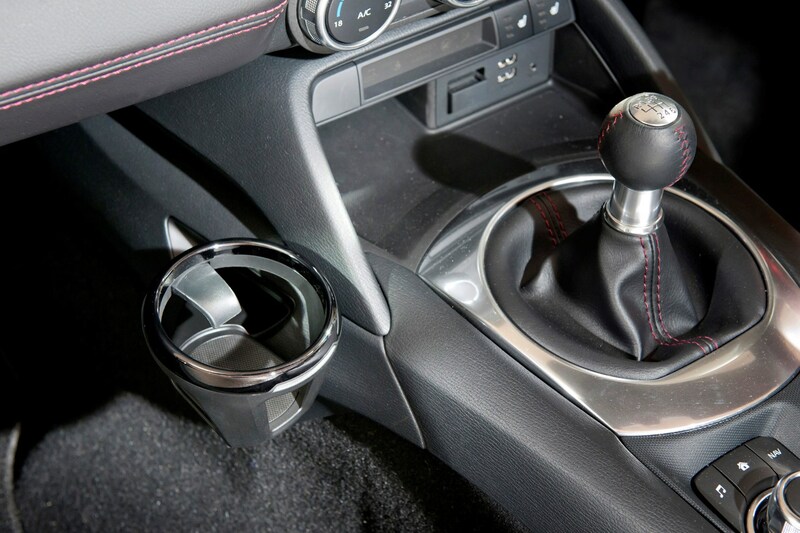 Then you might also wish to consider the excceptionally entertaining Ford Fiesta ST, which is the pick of the current crop of supermini-sized hot hatches. 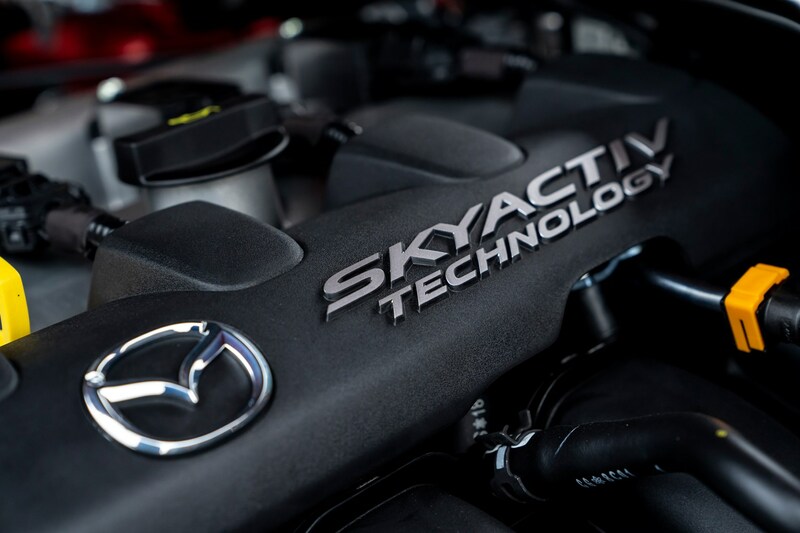 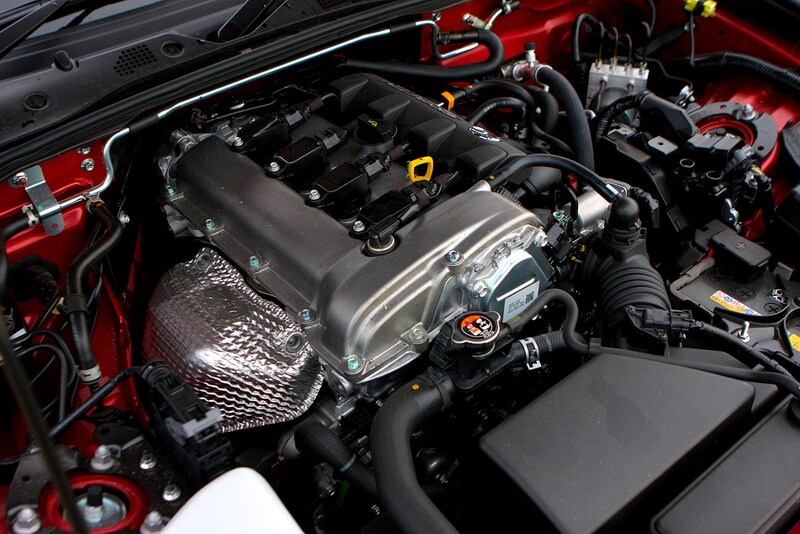 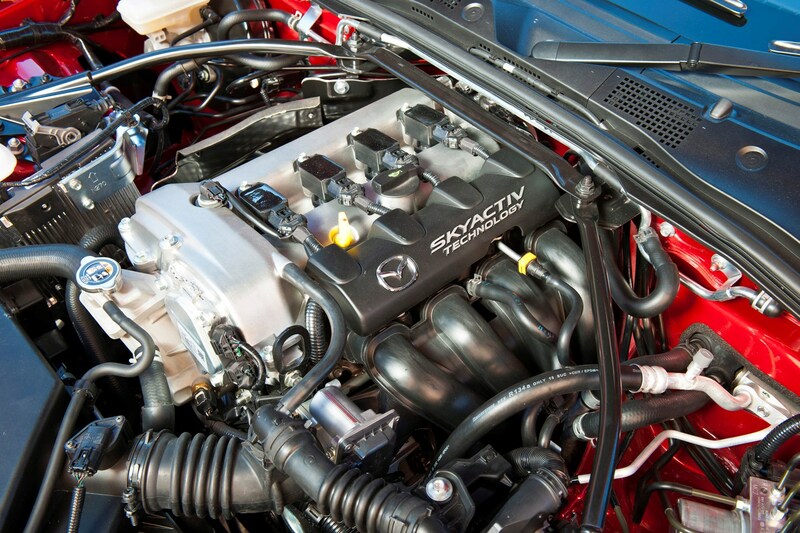 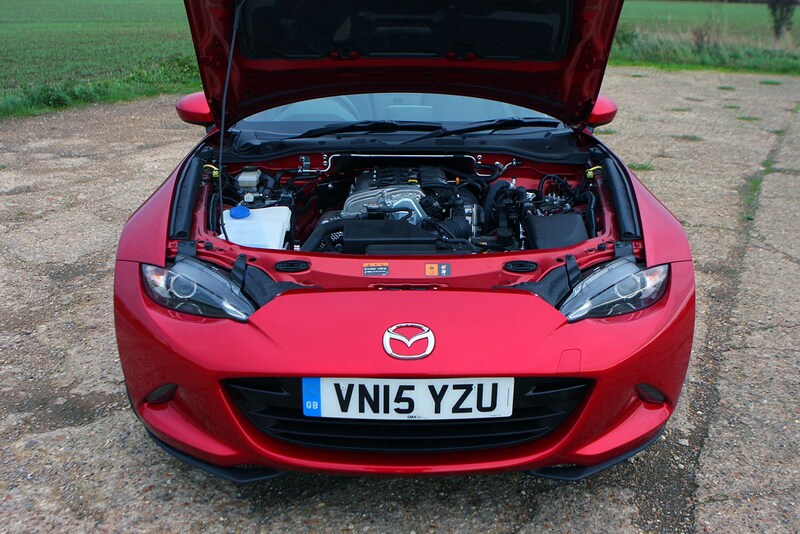 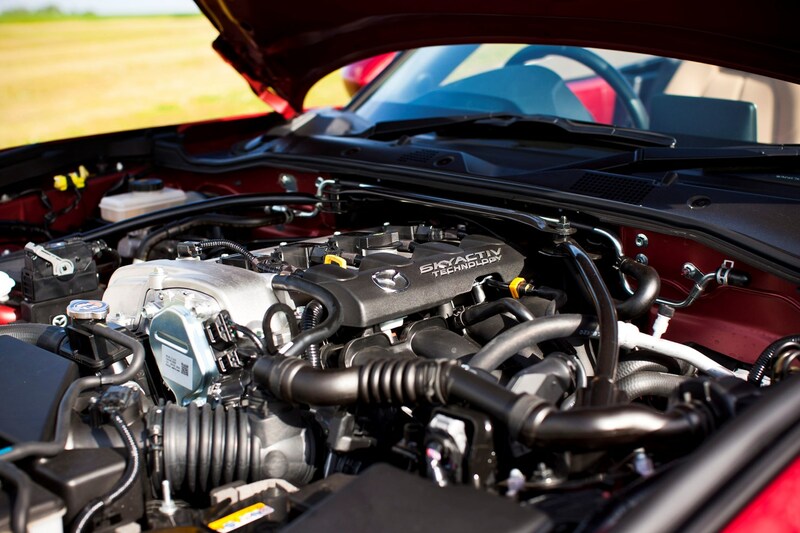 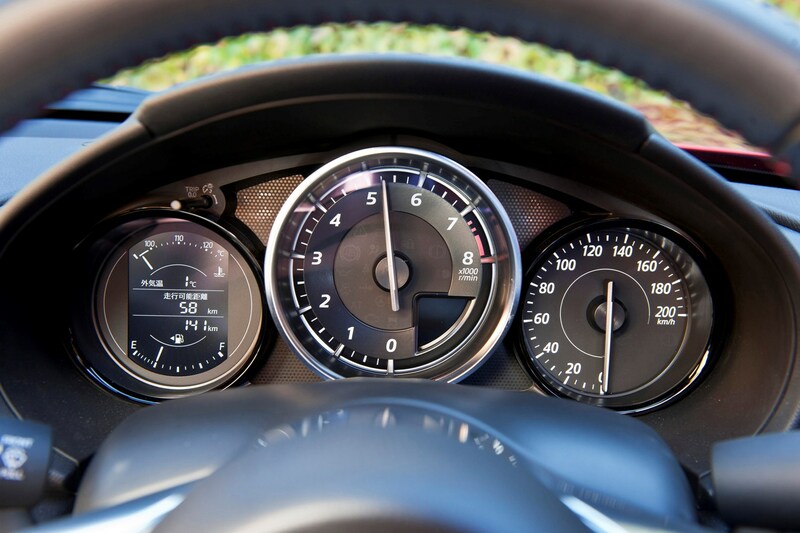 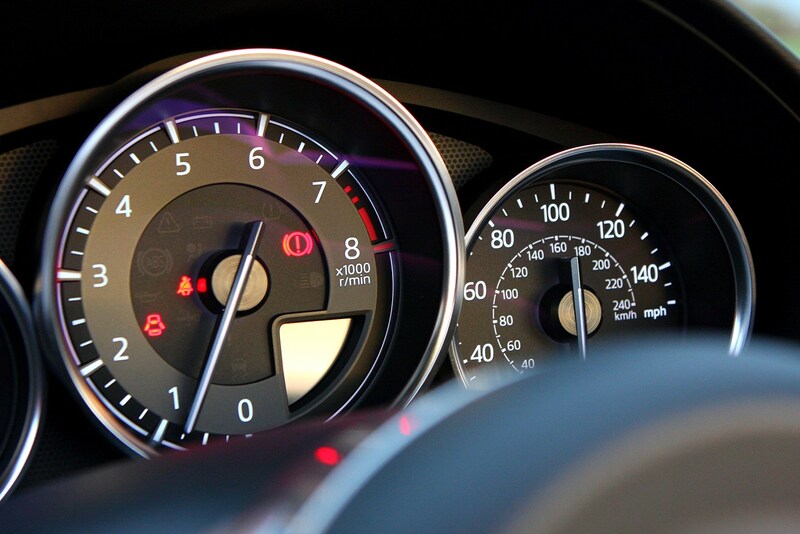 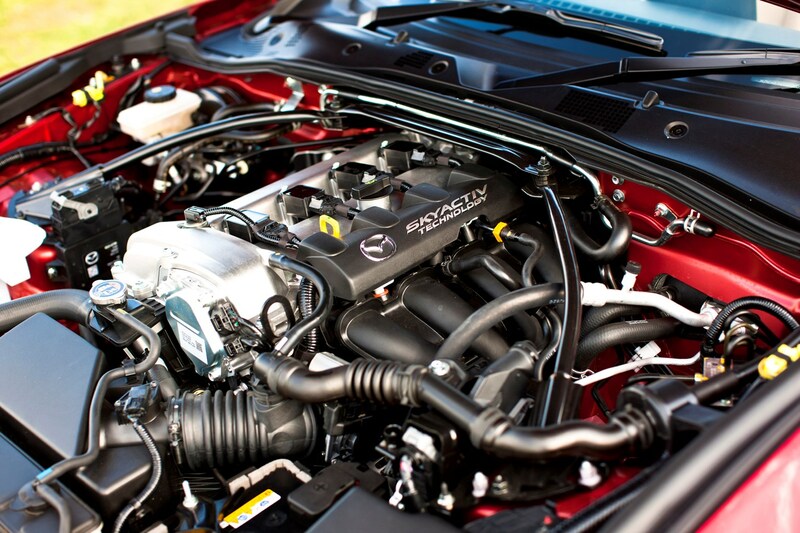 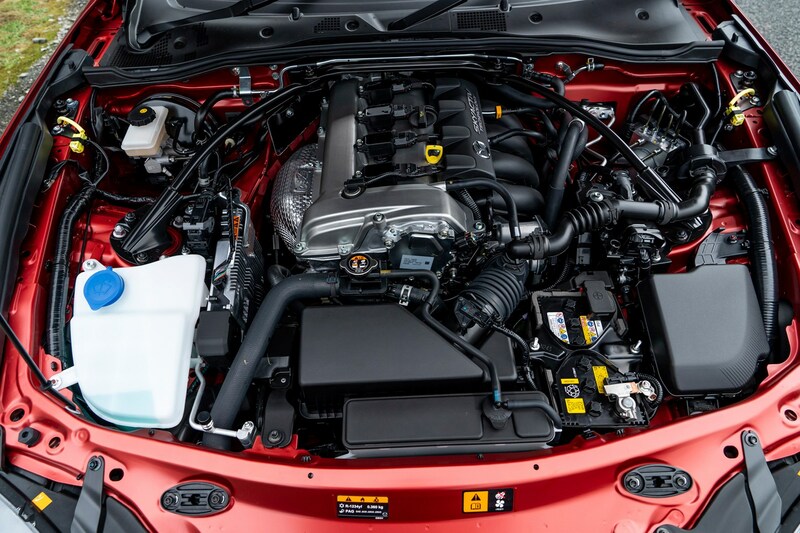 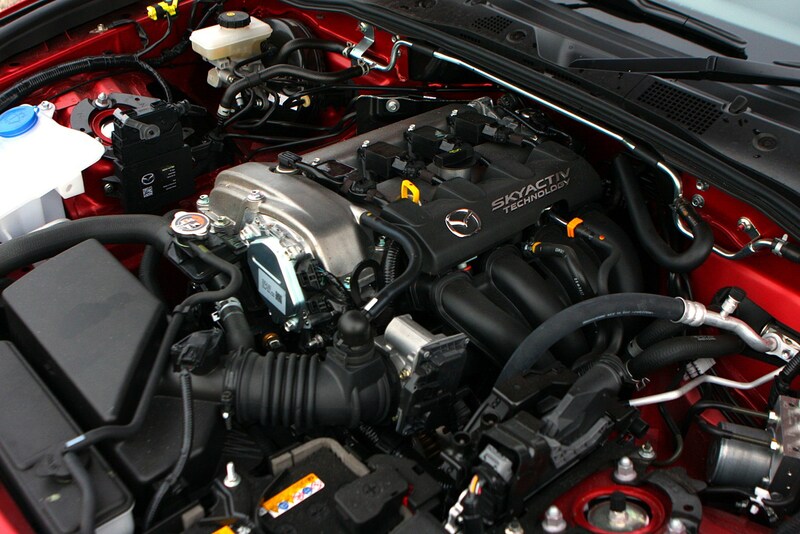 In the UK, the MX-5 is sold with a choice of two engines: 1.5-litre and 2.0-litre petrols from Mazda's highly efficient SkyActiv-G range that have been specially developed for this car. 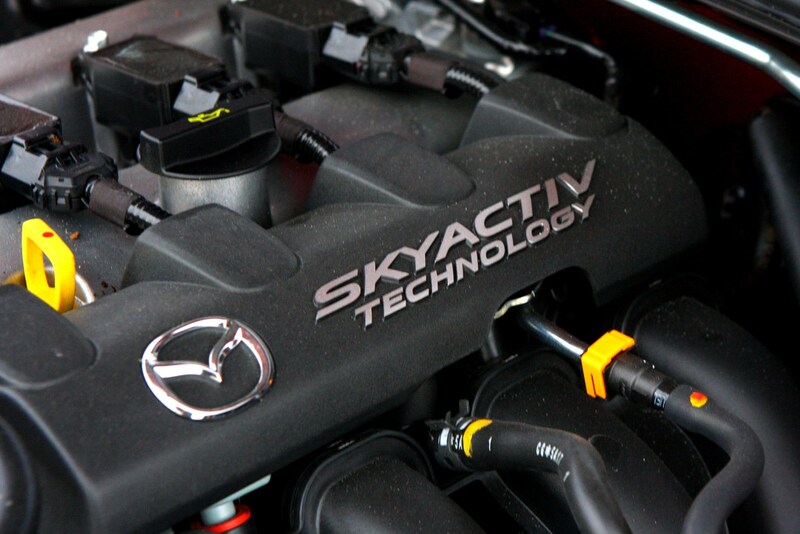 Exact power output varies with year. 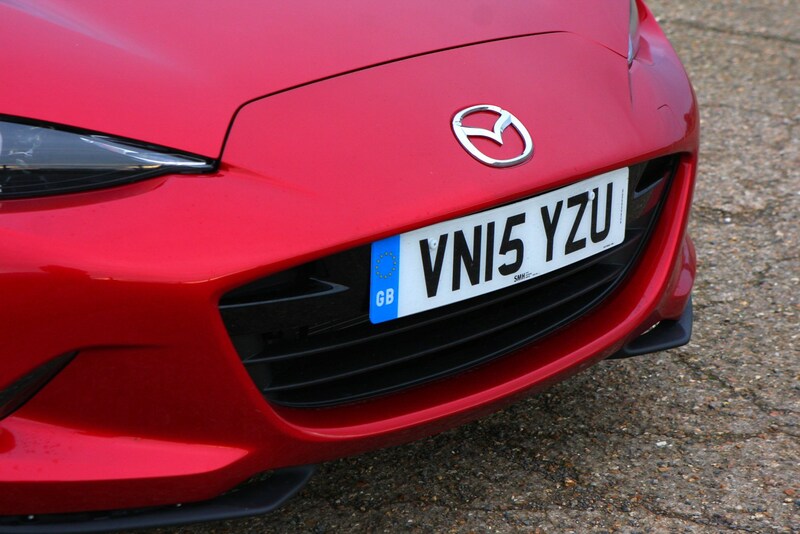 Mazda engineers are said to be particularly keen on the 1.5-litre engine, as it's in closest keeping with the MX-5's simple, lightweight design philosophy. 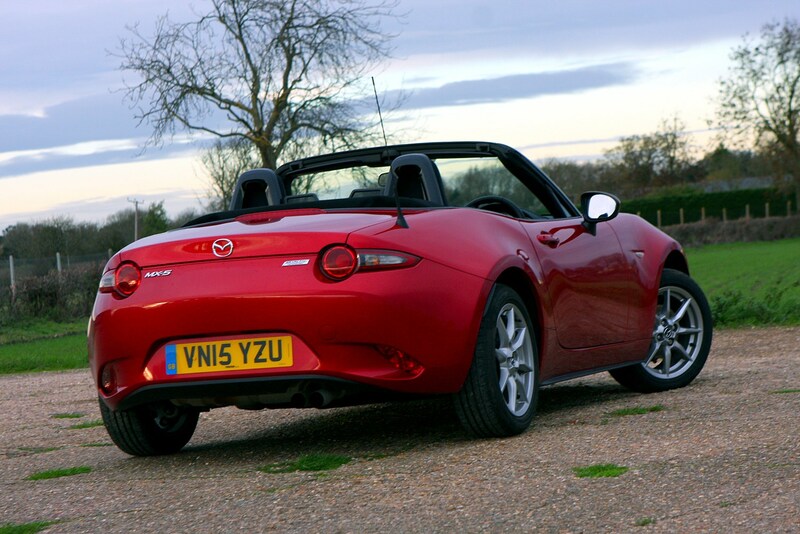 This comparatively small engine revs incredibly freely (up to 7,500rpm), and sounds fantastically enthusiastic. 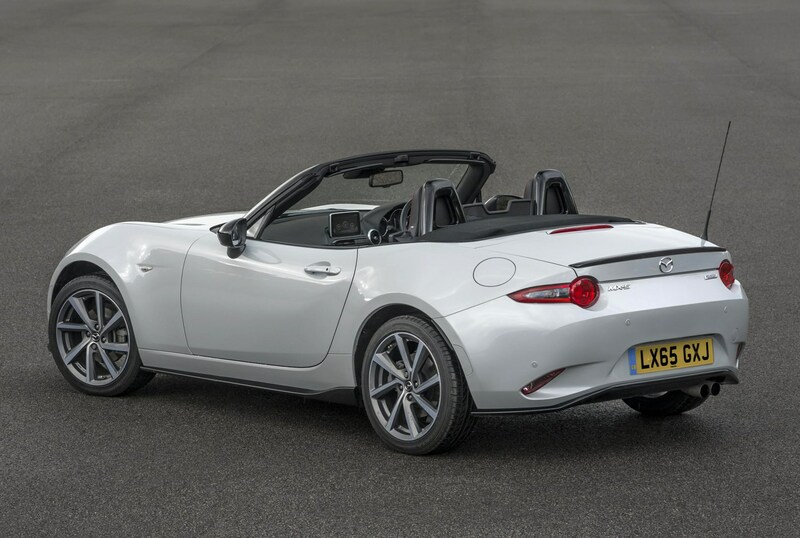 But with a mere 131hp at launch (upgraded to - wait for it - 132hp in late 2018), it may leave you longing for extra performance. 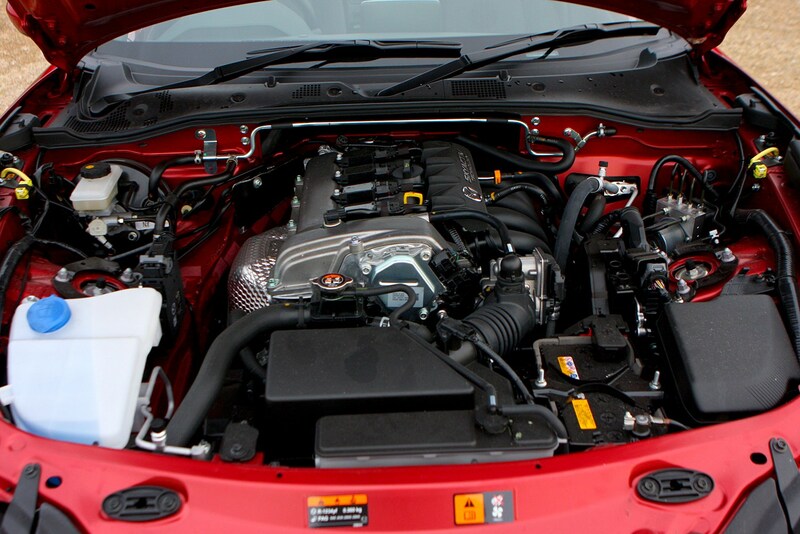 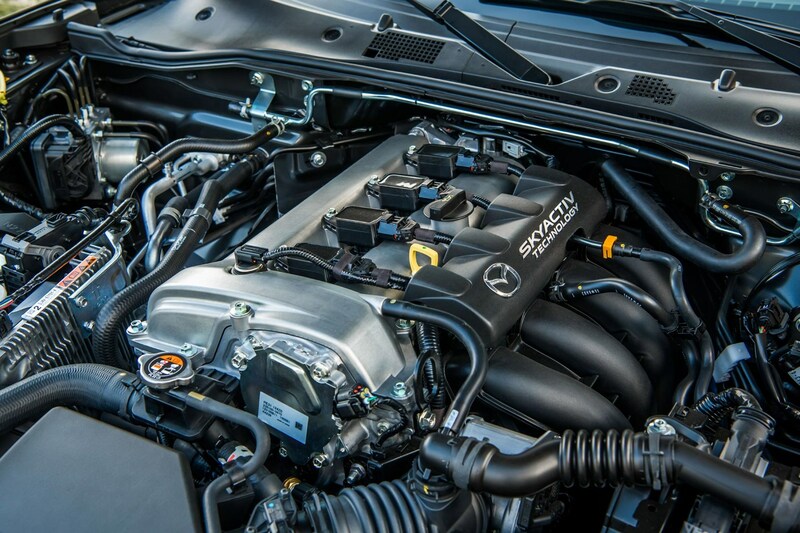 This is where the 2.0-litre comes in. 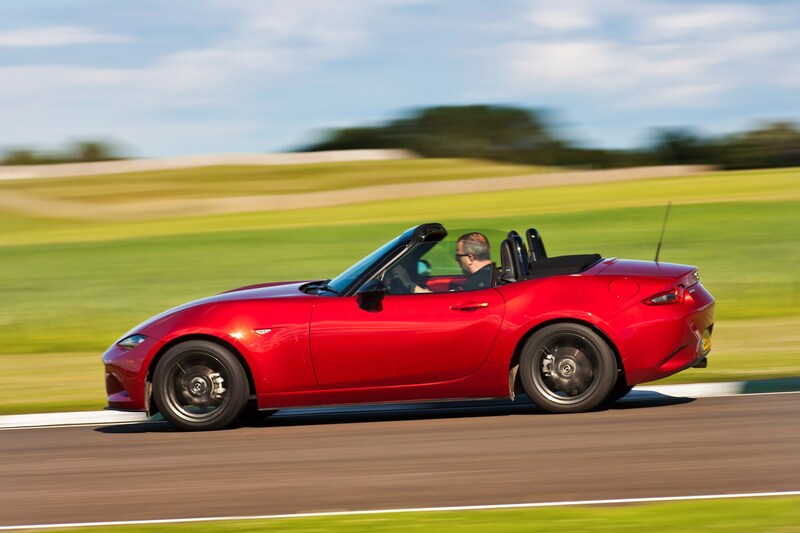 While compartively flat-feeling and with a lower rev-limit at launch in 2015, there's no arguing that its additional low-down grunt (or torque) combined with peak power of at least 160hp make it a much faster machine - being over 1.0-second faster on the 0-62mph sprint. 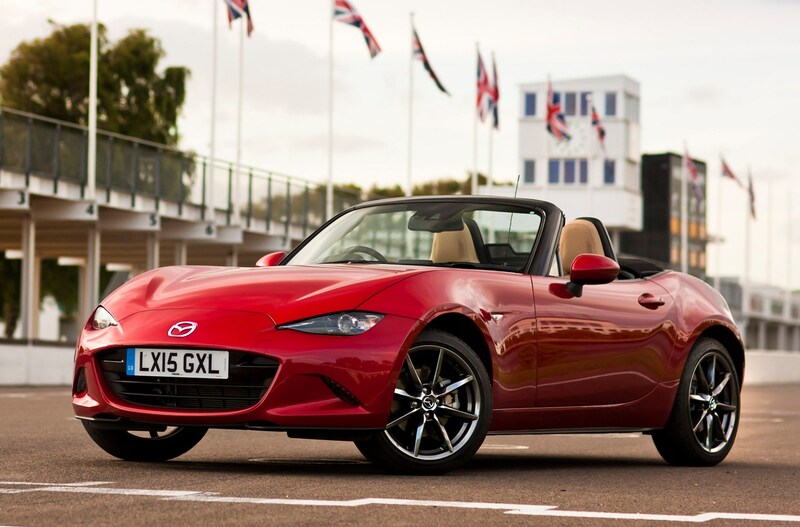 Up until the introduction of the 2019MY MX-5 cars, we would still have said we preferred the 1.5-litre engine for its sweetness. 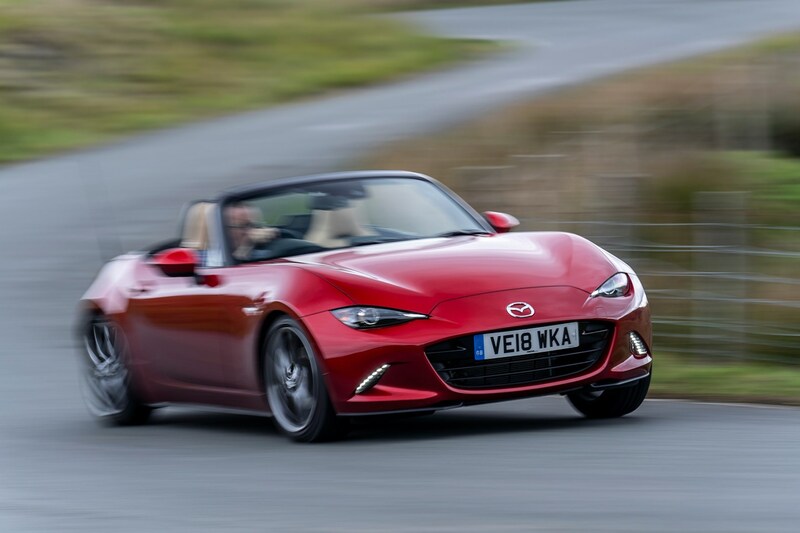 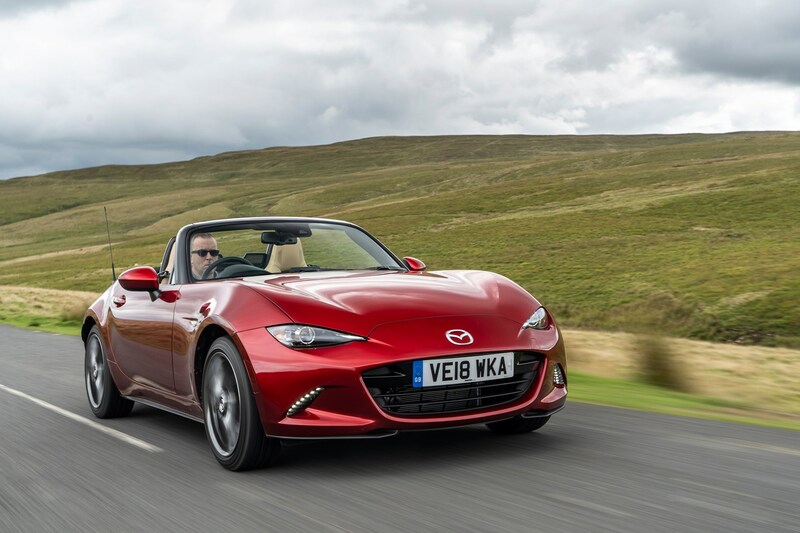 But the big change for MX-5s sold from September 2018 onwards is the 2.0-litre engine upgrade, which not only boosts power to 184hp but also allows this engine to rev much more keenly. 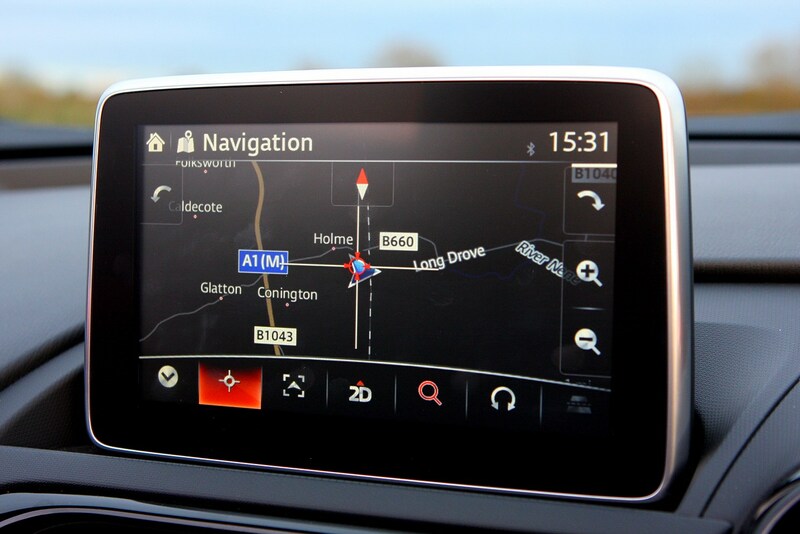 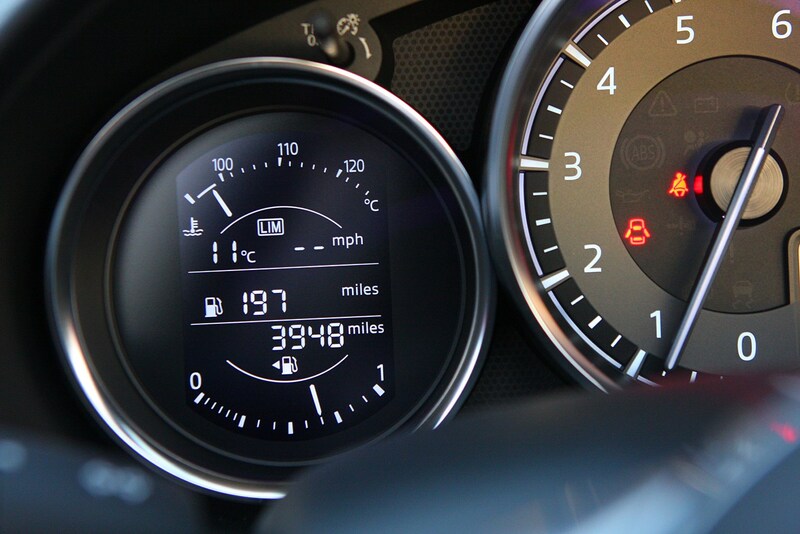 From this point on the 2.0-litre is the clear pick of the range. 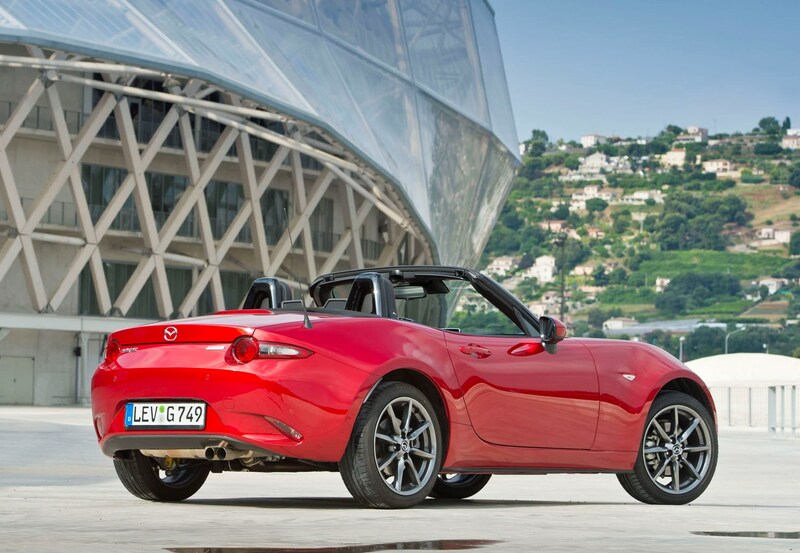 The MX-5 is a sophisticated car, but one without added complexity. 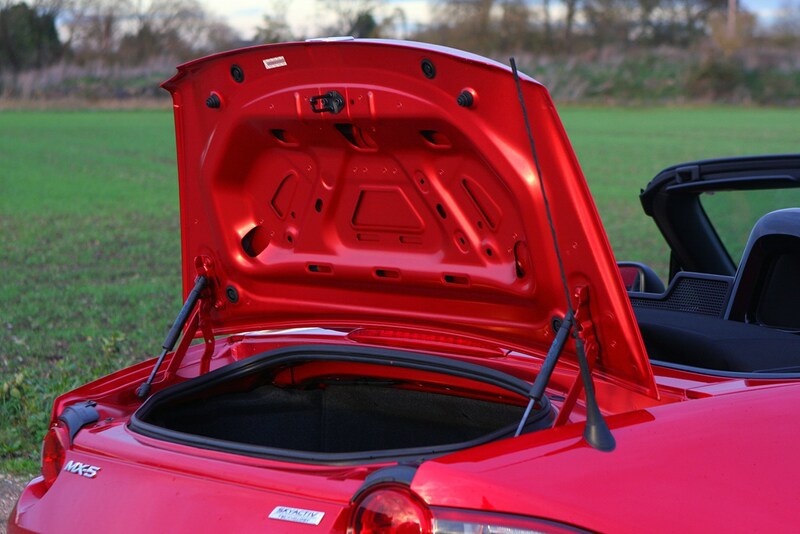 Which is why you need to manually operate the folding fabric roof; the only electrical intervention comes from the windows, which lower halfway for clearance as you unlatch the roof from the top of the windscreen rail. 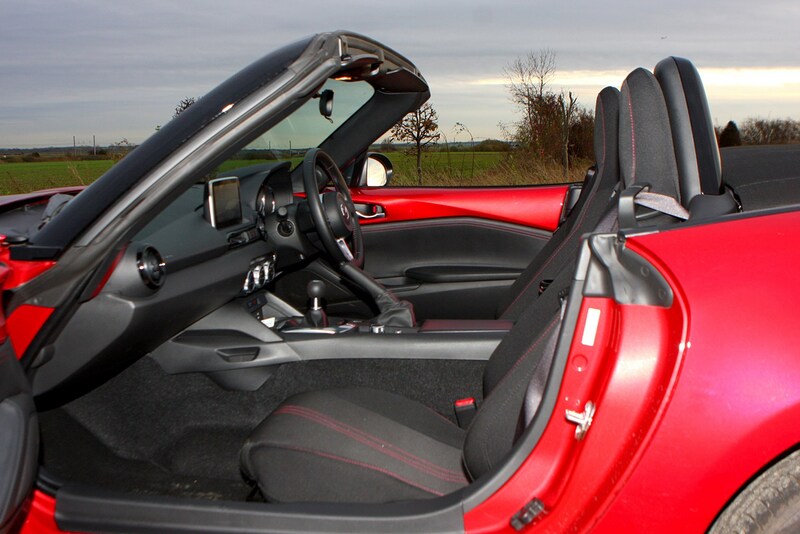 Don't let this put you off - for while the roof may be manual, it's not a labour. 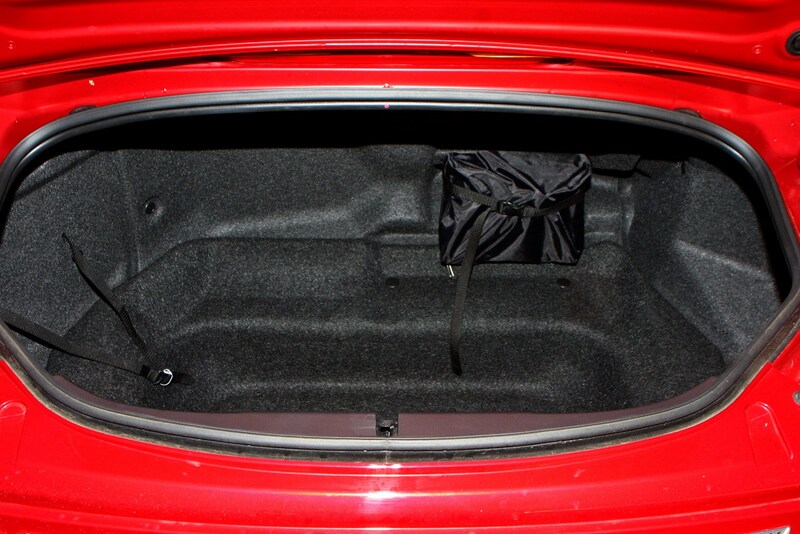 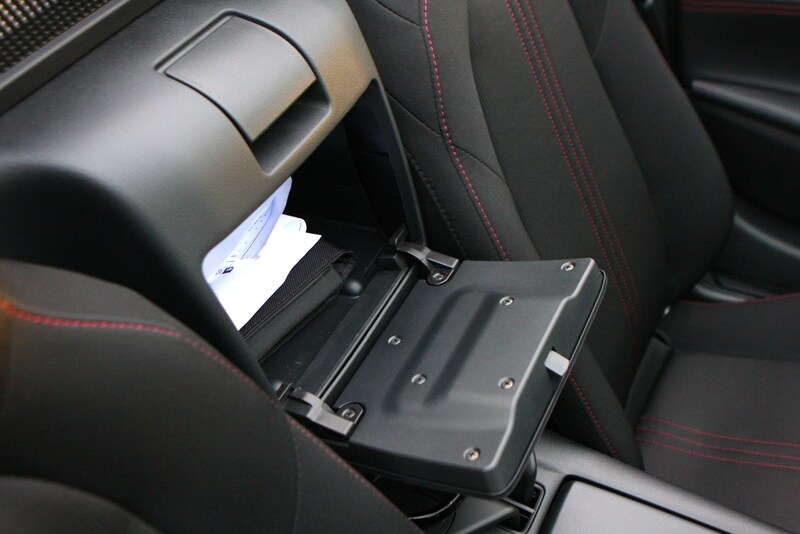 Folding back neatly behind the seats in one easy movement, it requires little more effort than a swing of your arm, and doesn’t eat into any available boot space either. 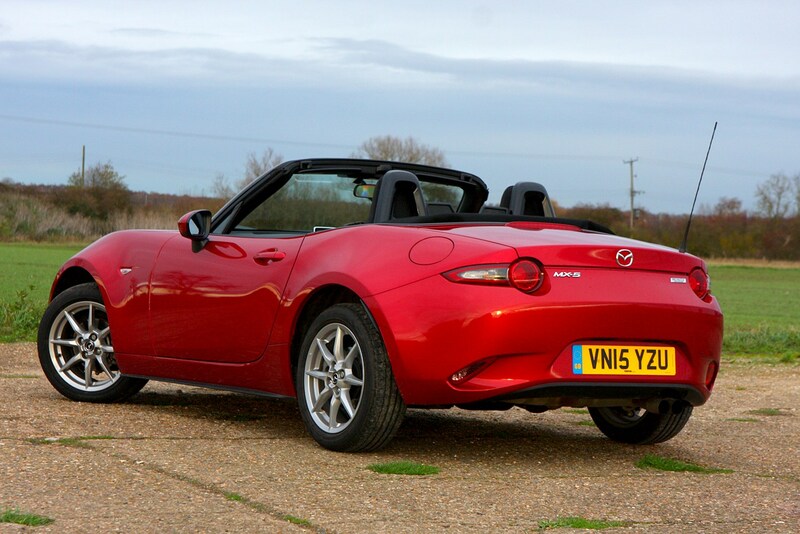 Closing it again is also a doddle - something that's not often the case with manual soft-tops of this kind. 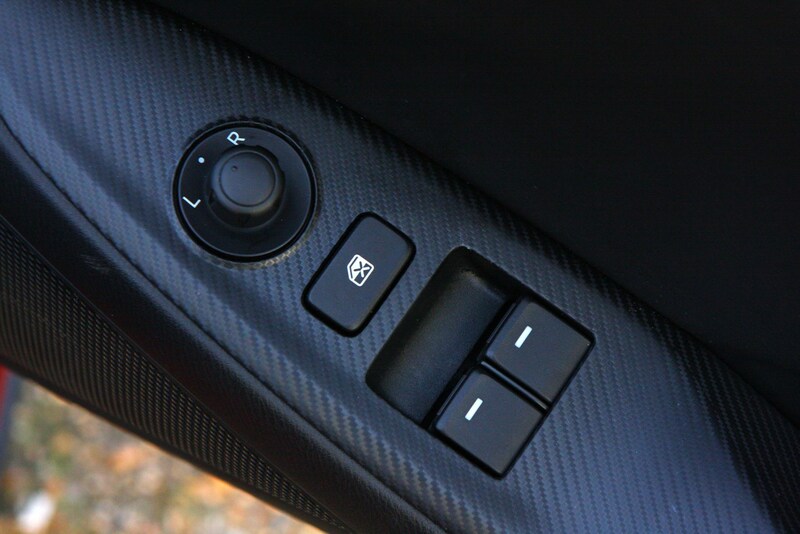 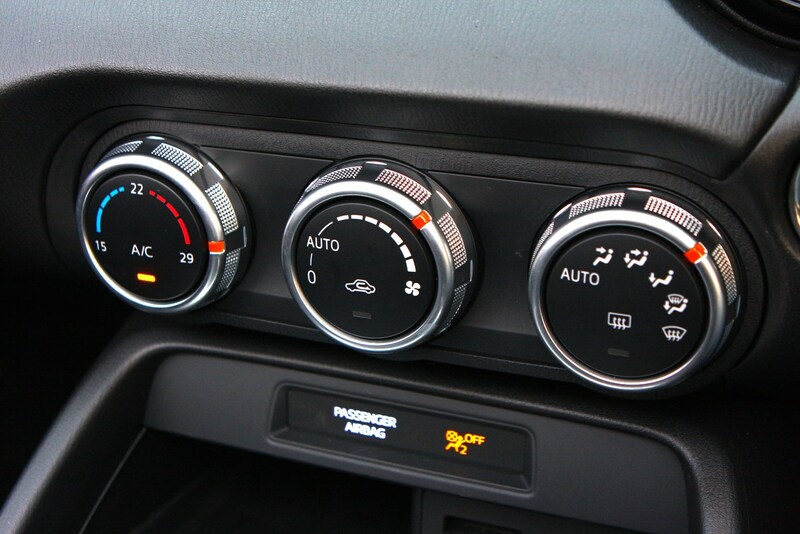 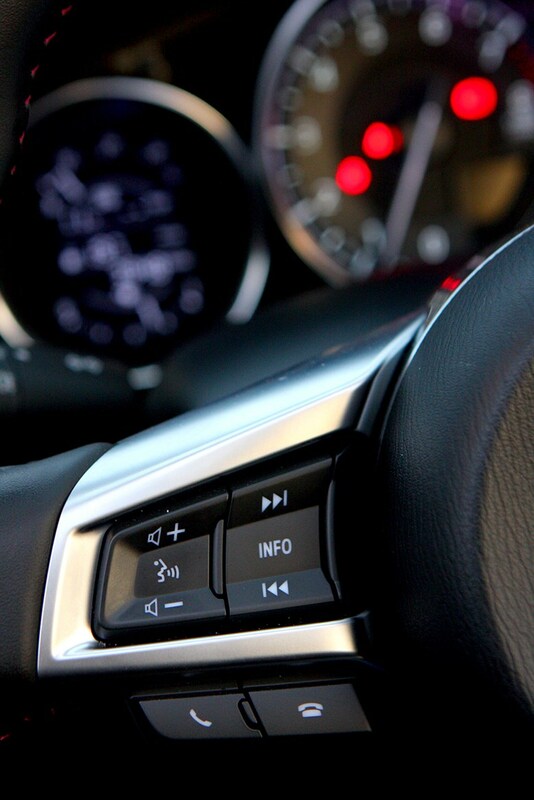 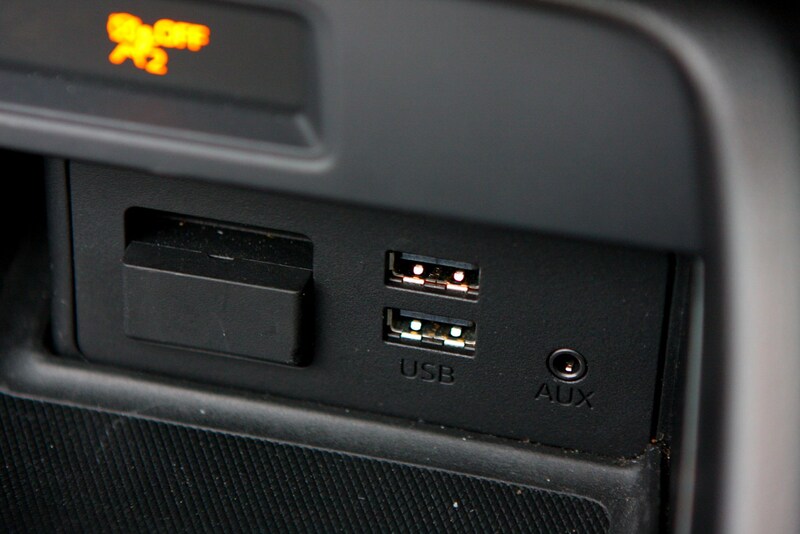 One of many small but significant engineering changes throughout the car. 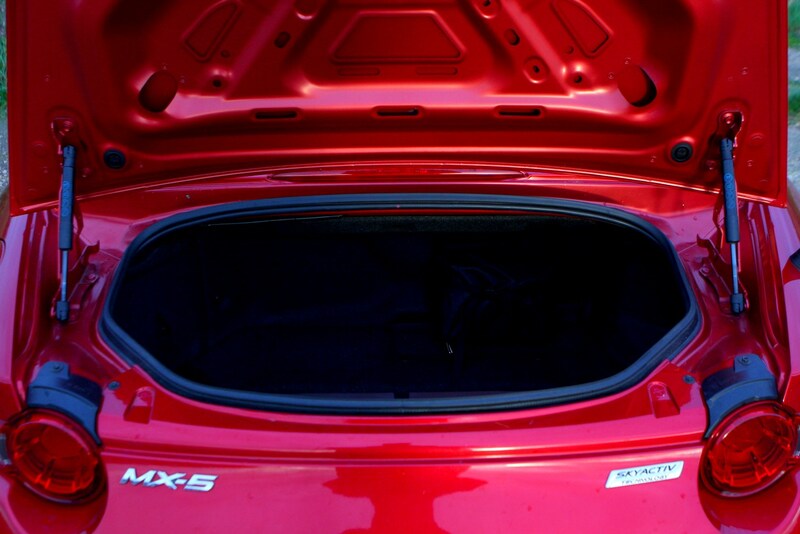 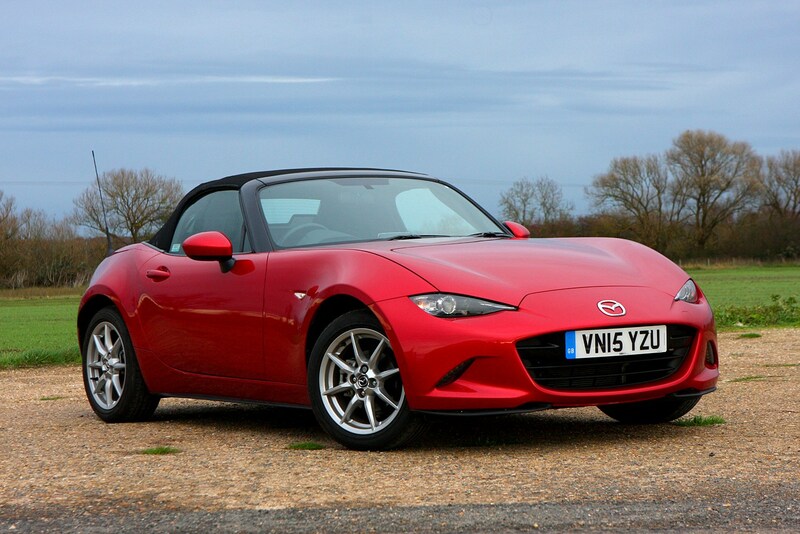 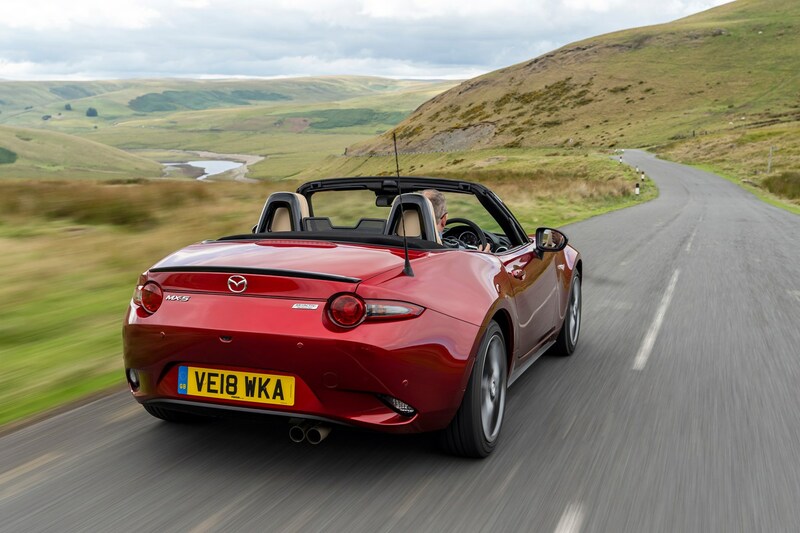 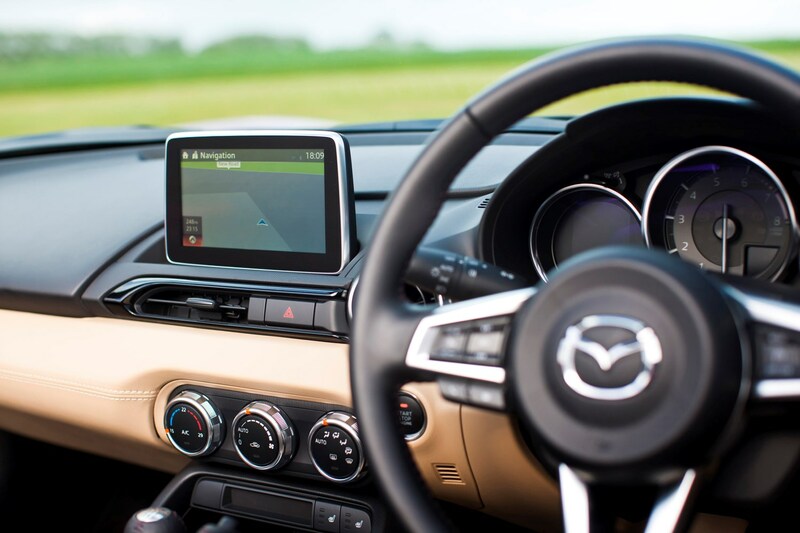 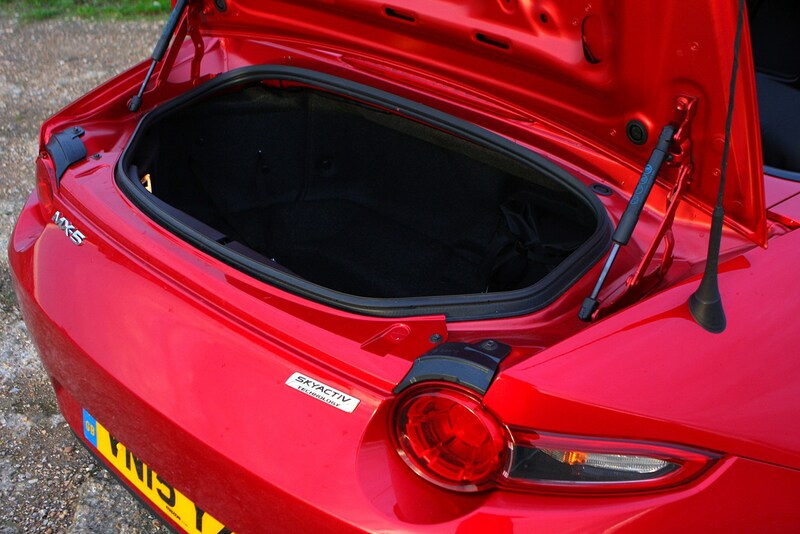 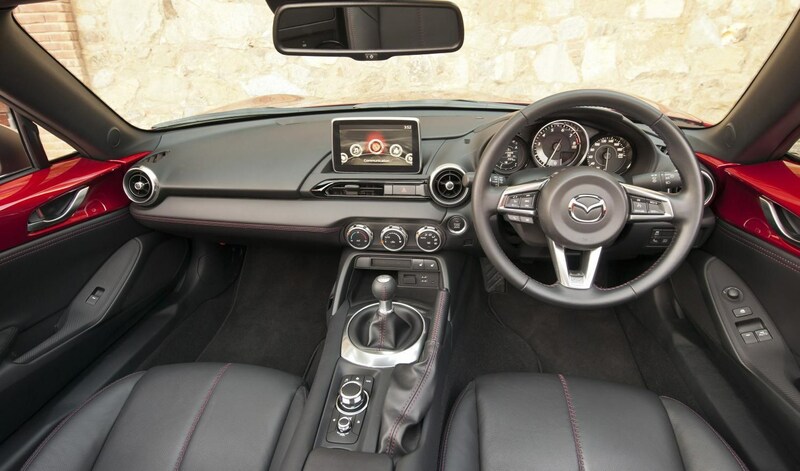 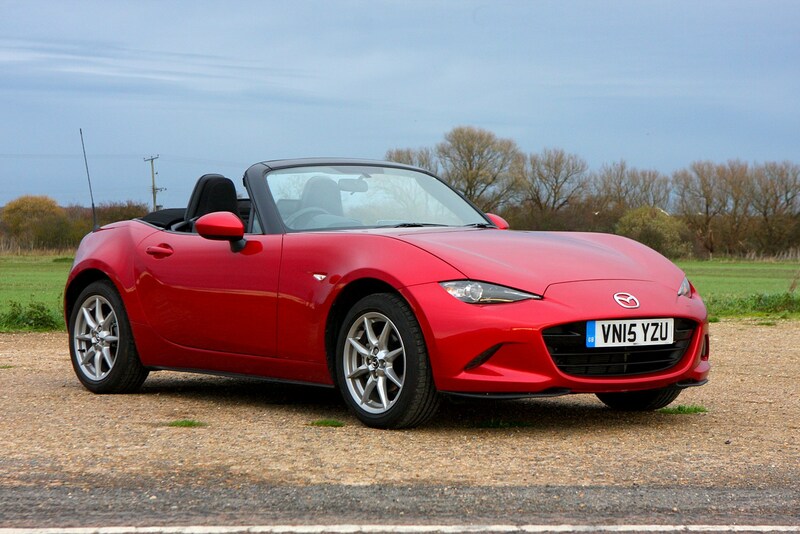 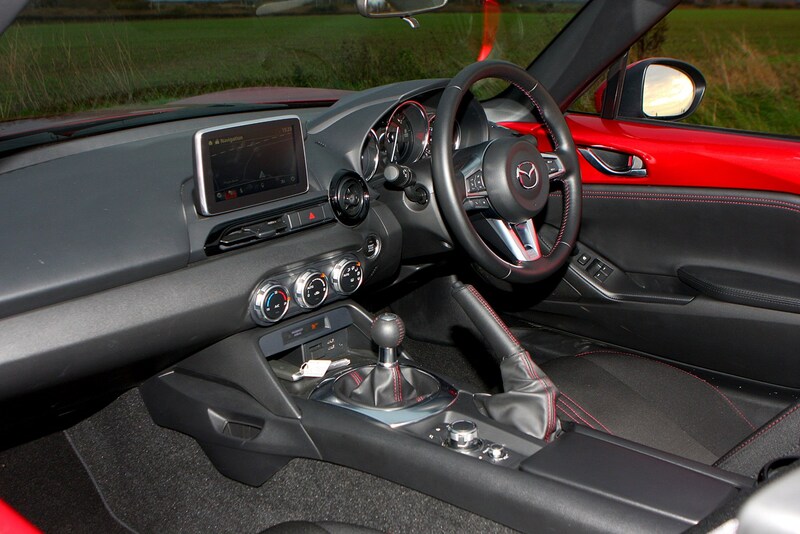 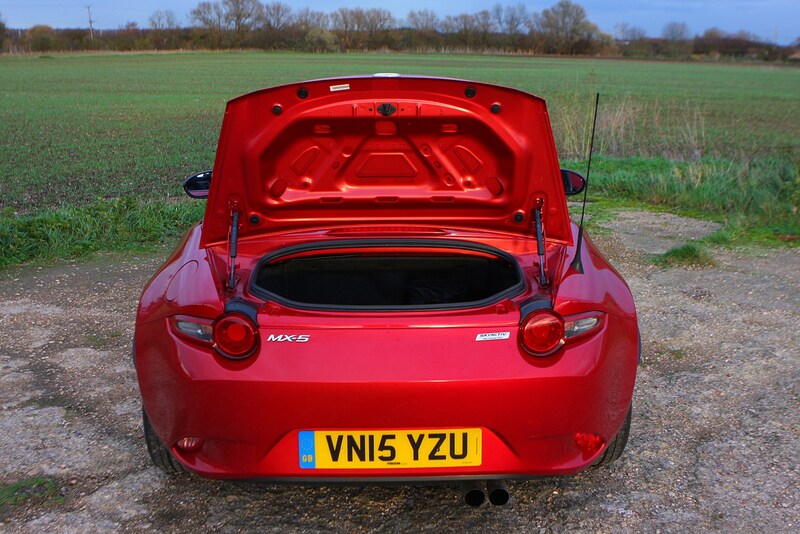 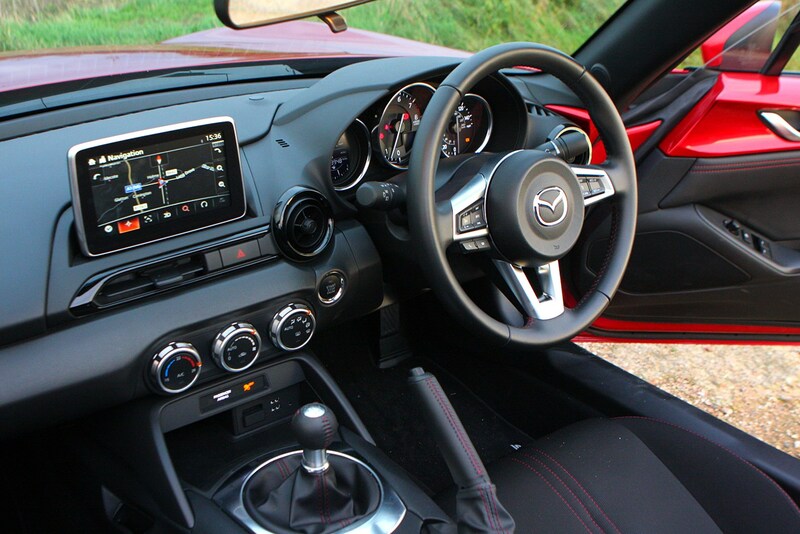 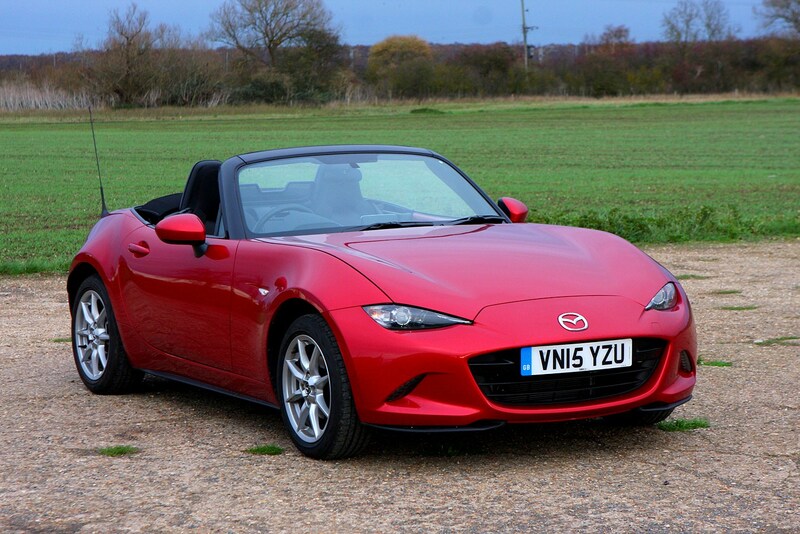 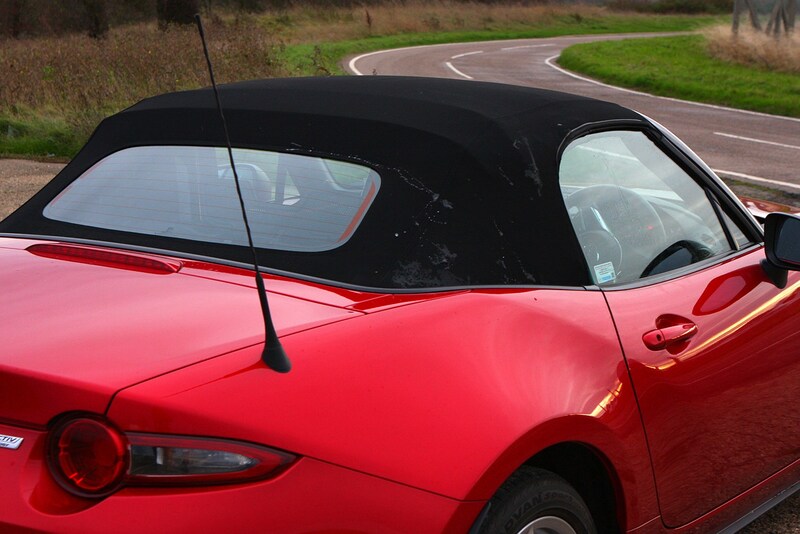 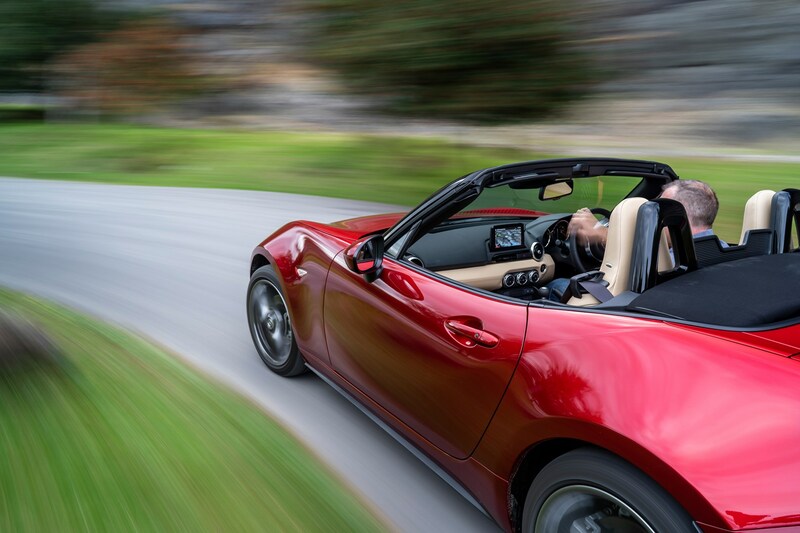 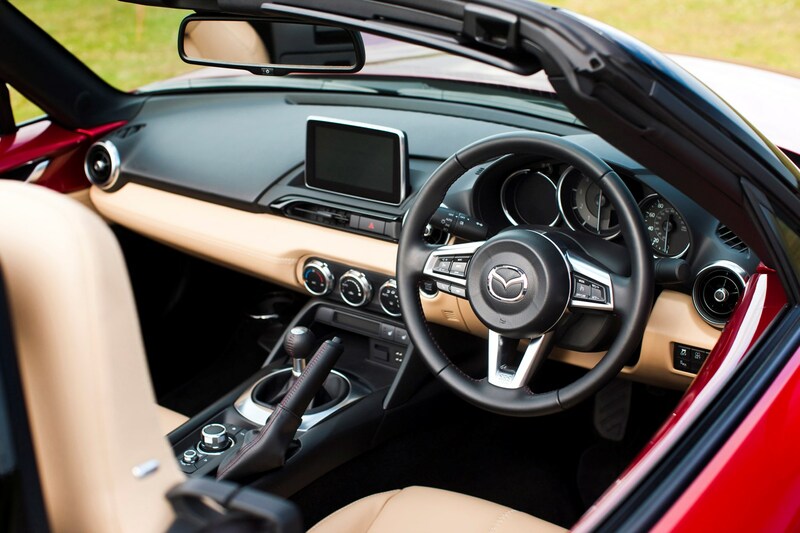 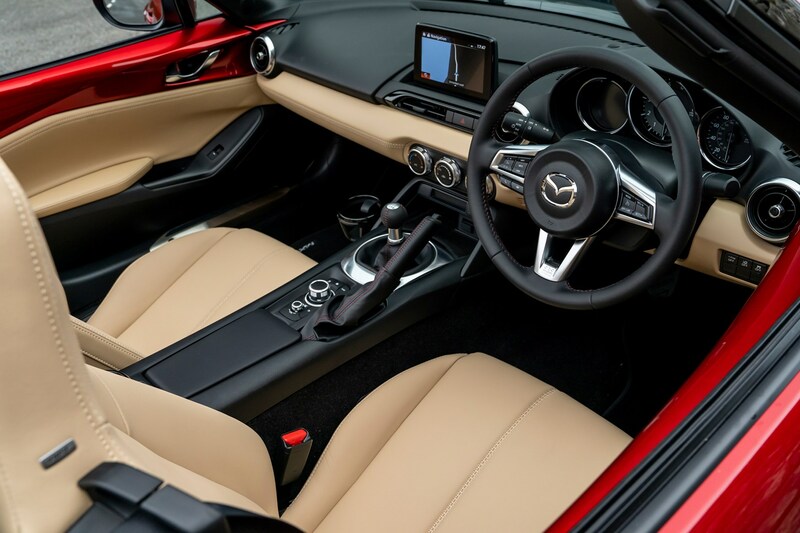 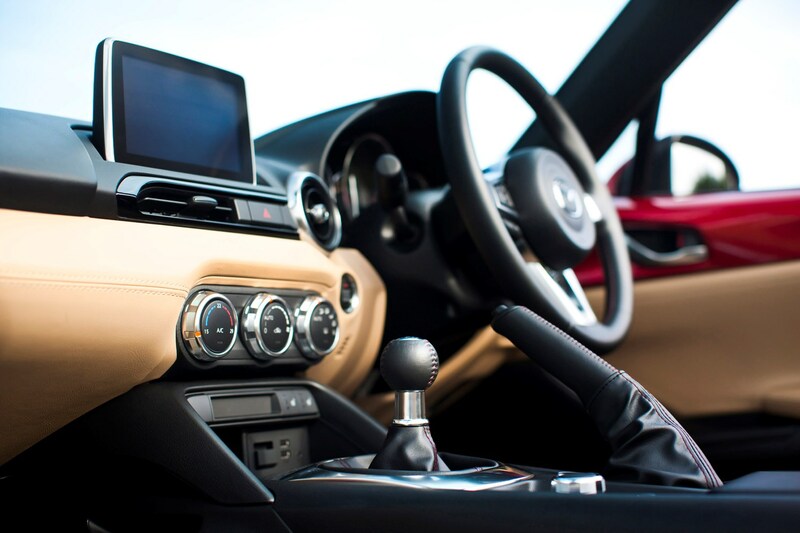 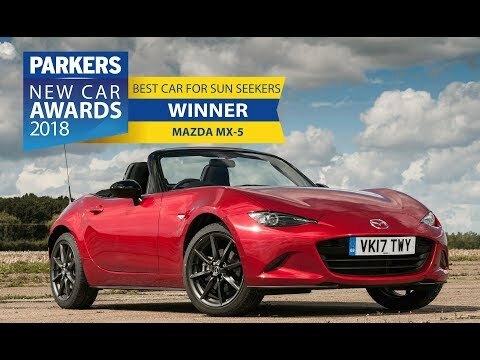 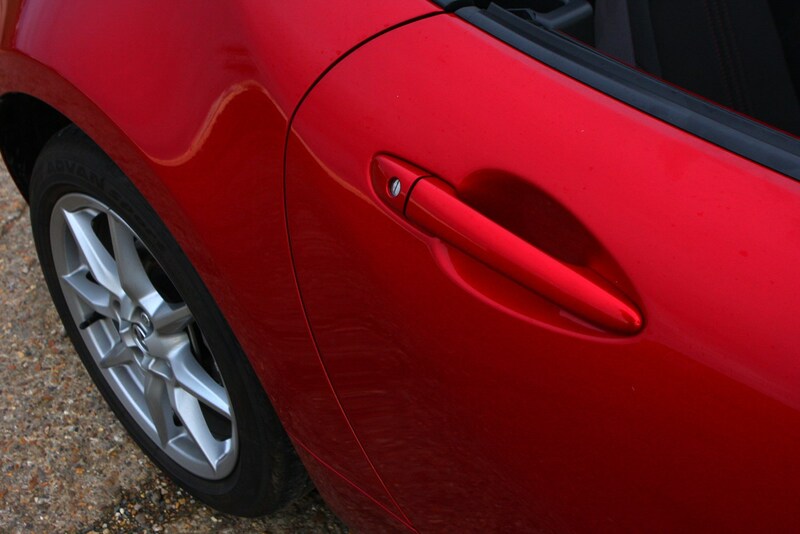 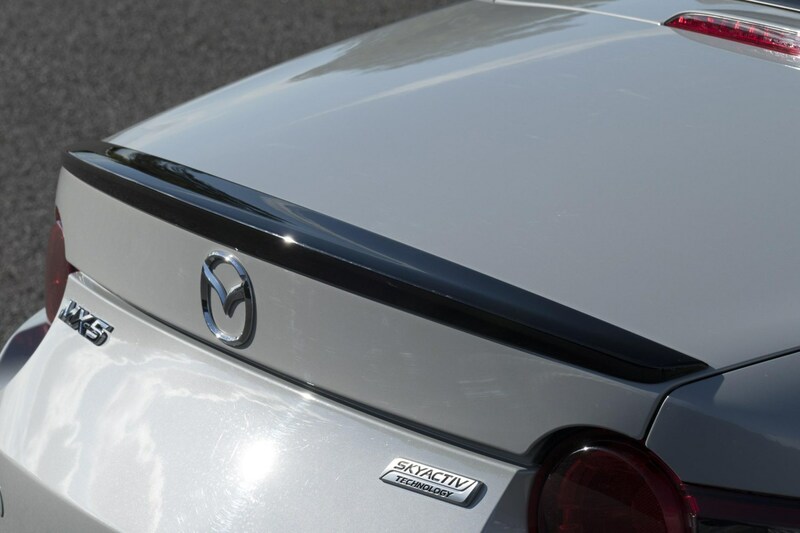 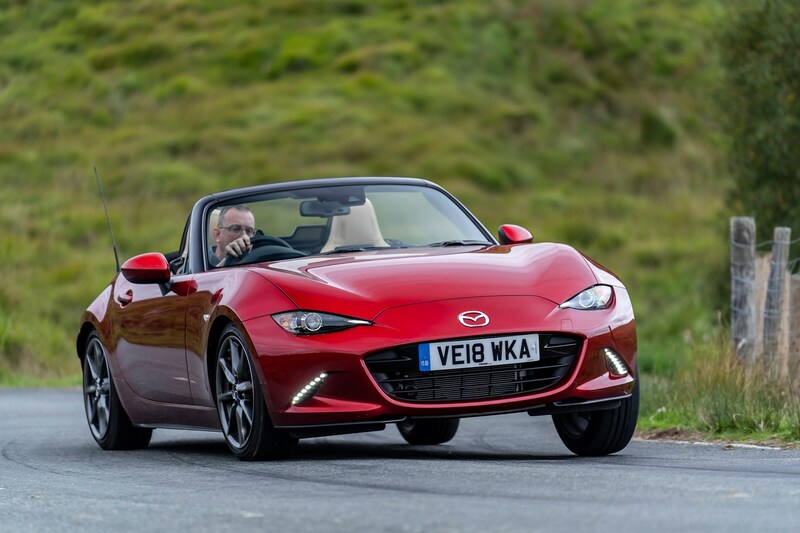 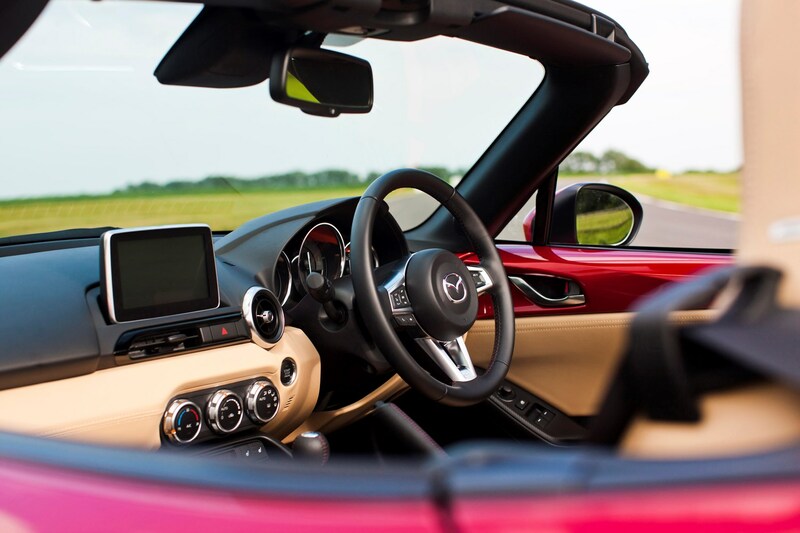 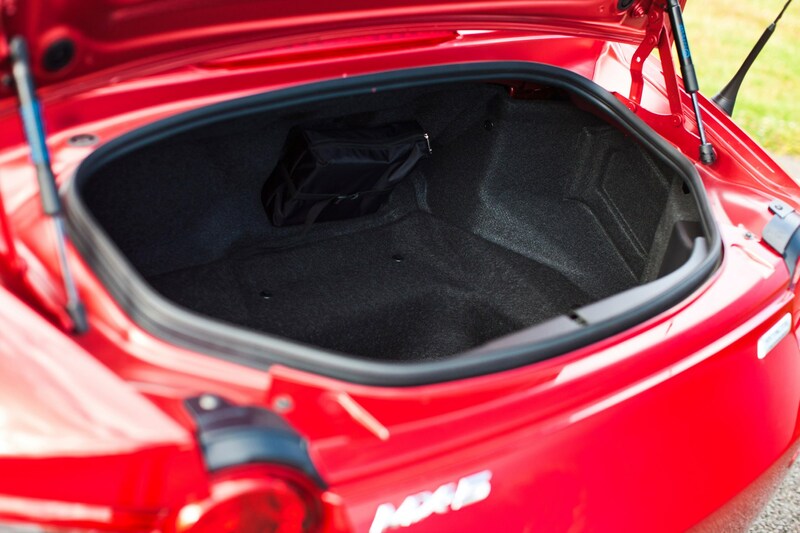 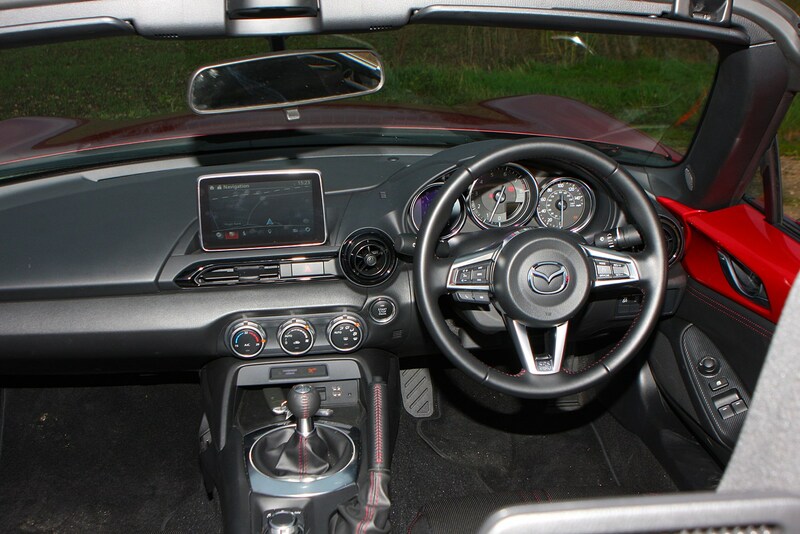 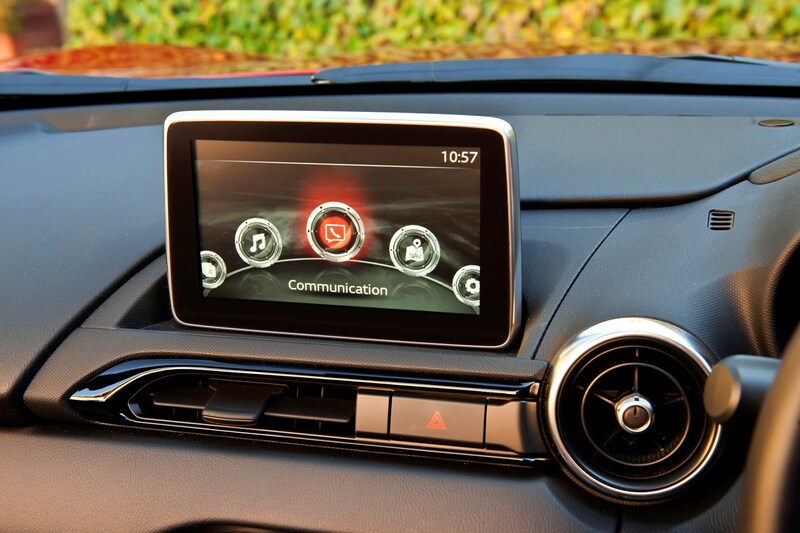 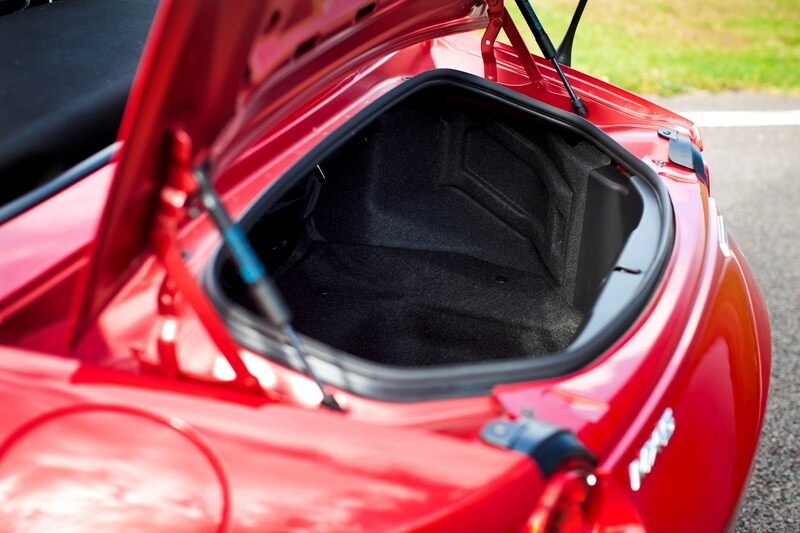 For those who prefer an automated – and more secure – approach, take a look at the electrically folding hardtop fitted to the Mazda MX-5 RF, which is covered by a separate Parkers review. 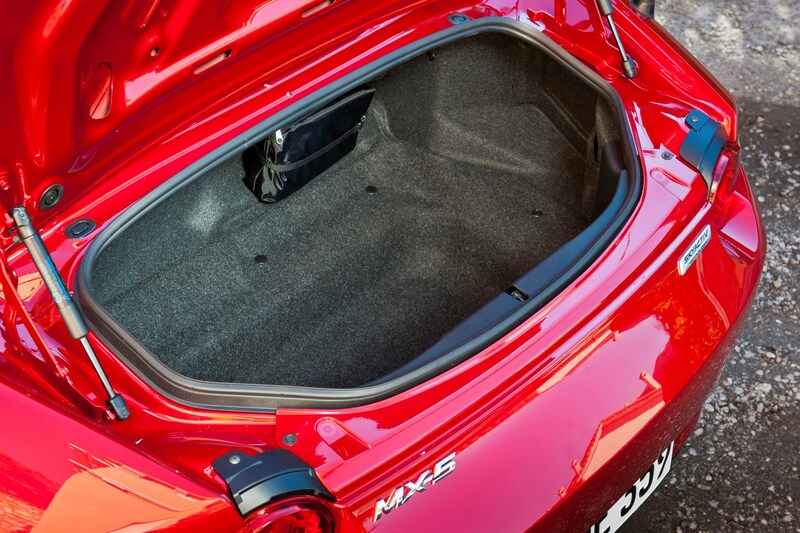 Mazda’s featherweight strategy, which sees the 1.5-litre car weighing-in at under 1,000kg (without a driver), is fanatical. 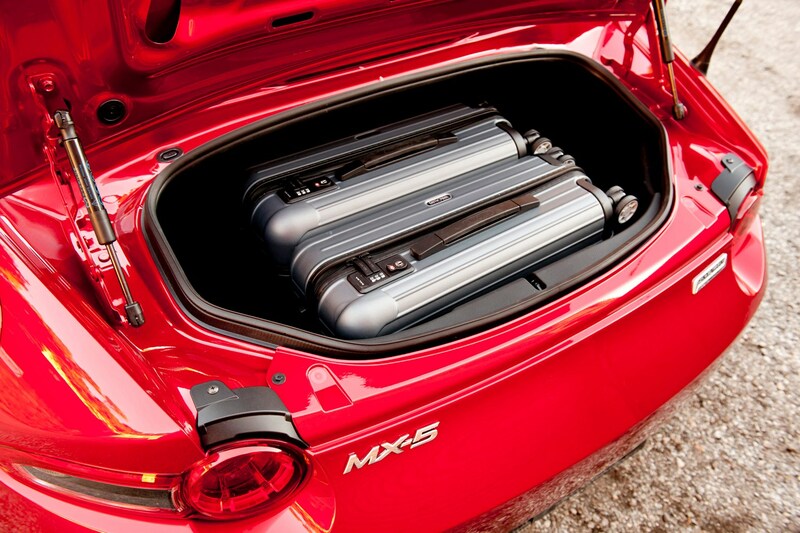 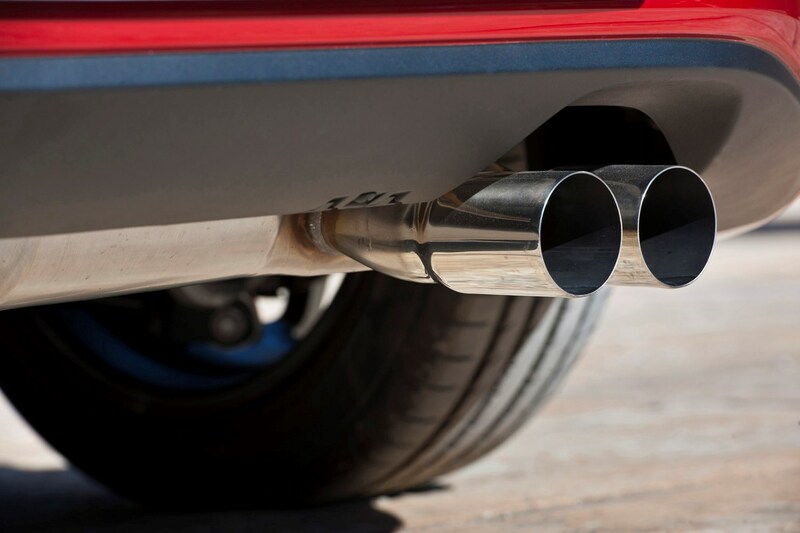 The 2.0-litre models weigh less than 100kg more. 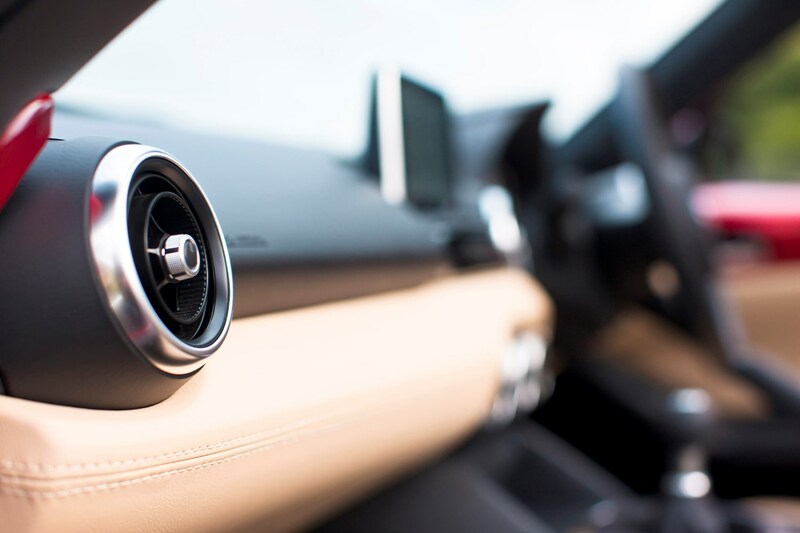 There’s extended use of aluminium to make the whole thing lighter, and components that won’t have their integrity or strength affected sport weight-saving holes with pride. 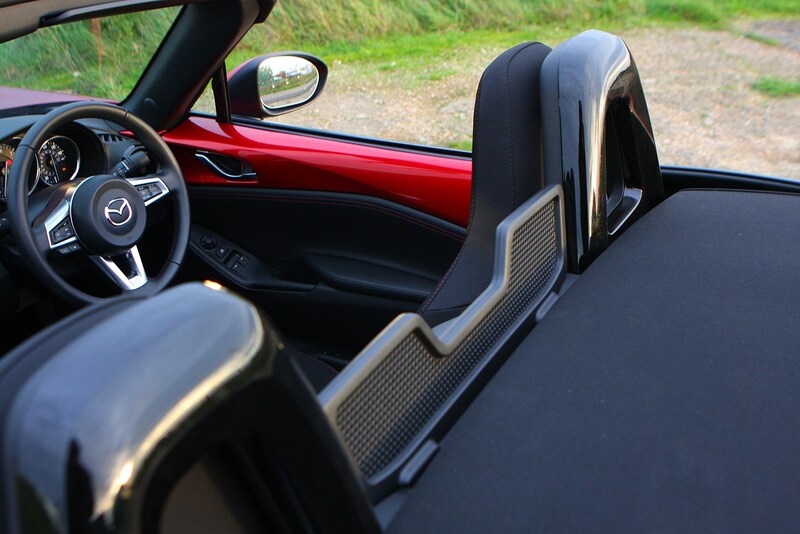 Even the welded and riveted parts are formed in a ‘wave’ shape to fractionally reduce materials used and lower the weight. 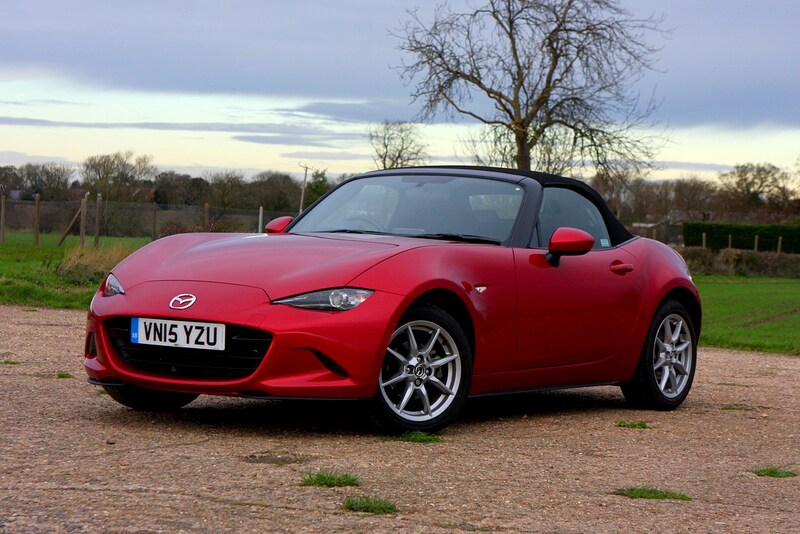 Being so light makes the MX-5 both fun to drive and efficient, meaning its affordable pricing is complemented by afforable running costs as well. 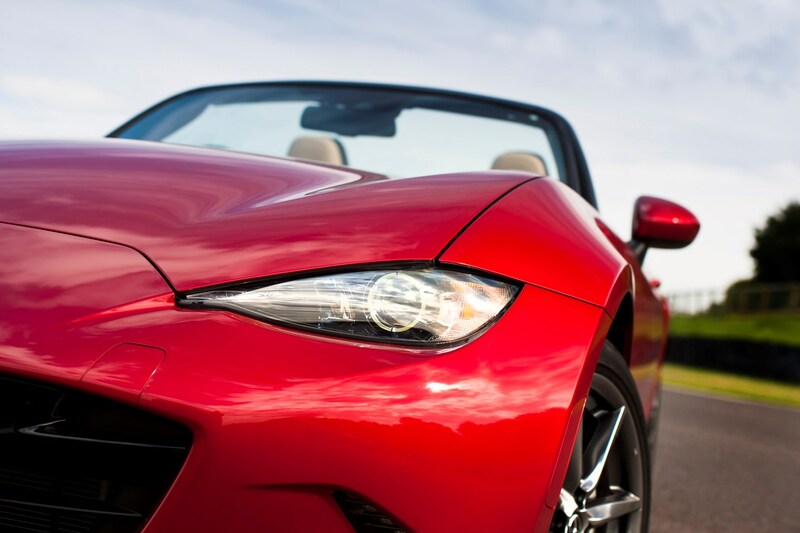 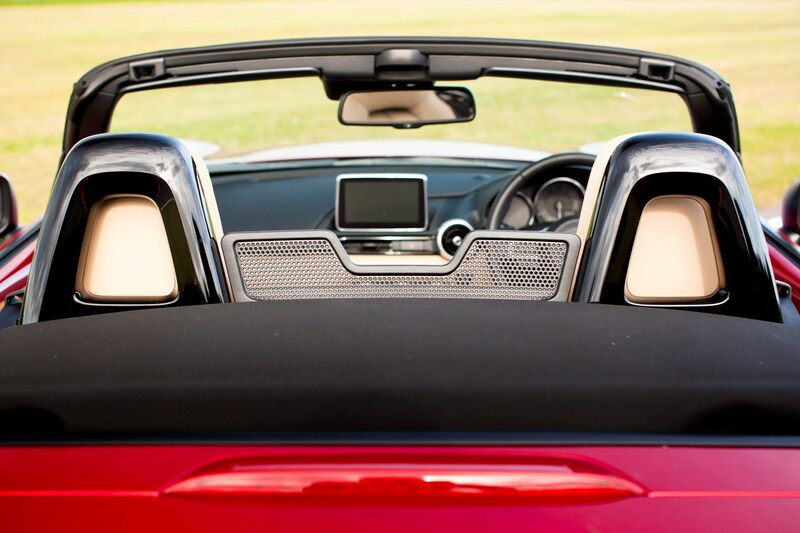 People buy roadsters with their hearts, and we can see plenty of people falling in love with this little convertible. 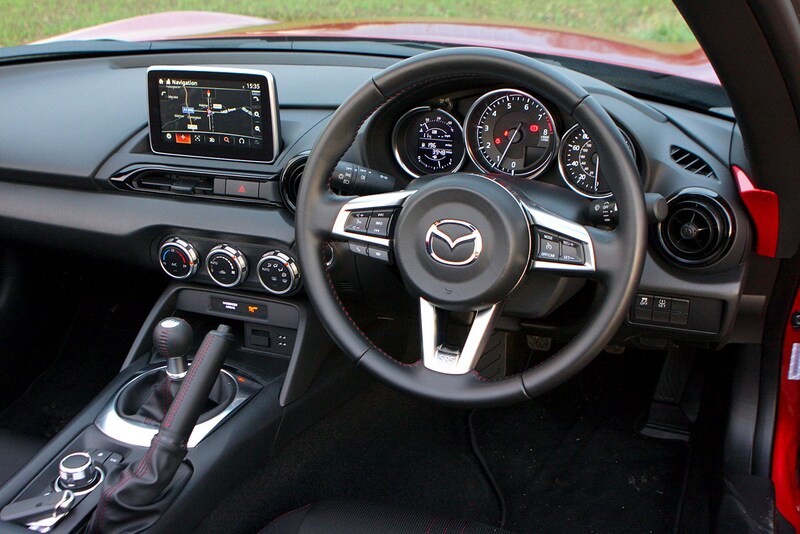 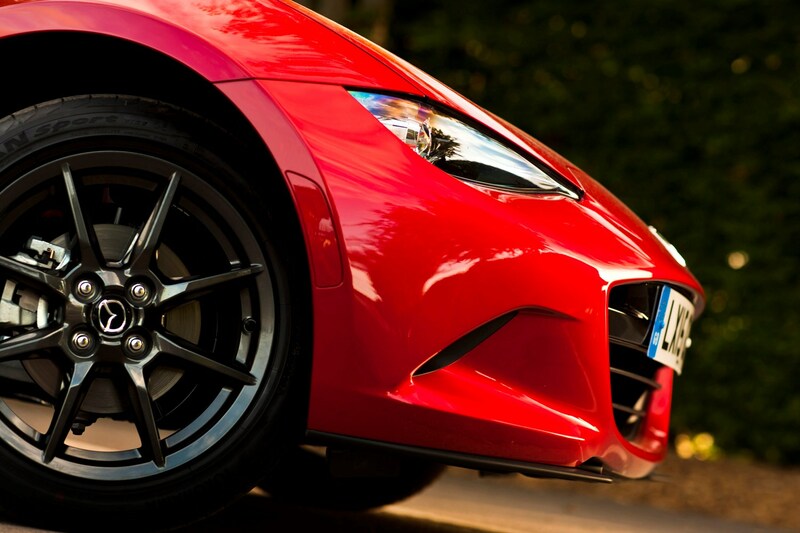 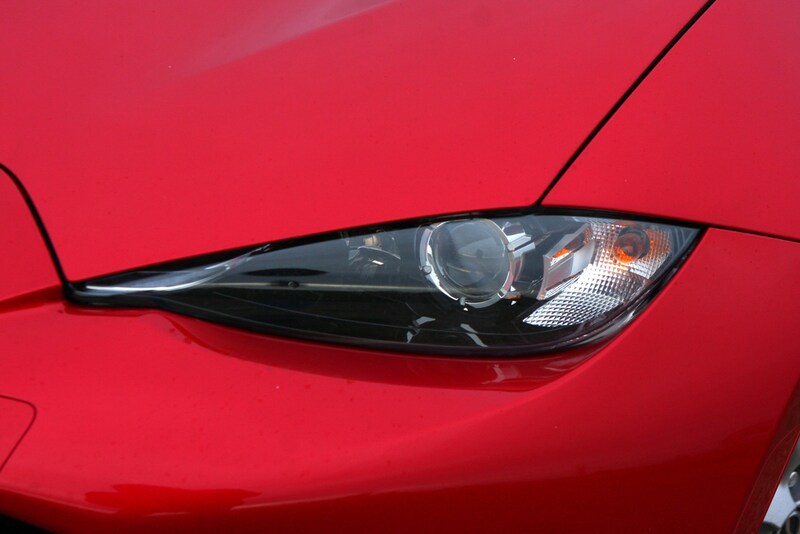 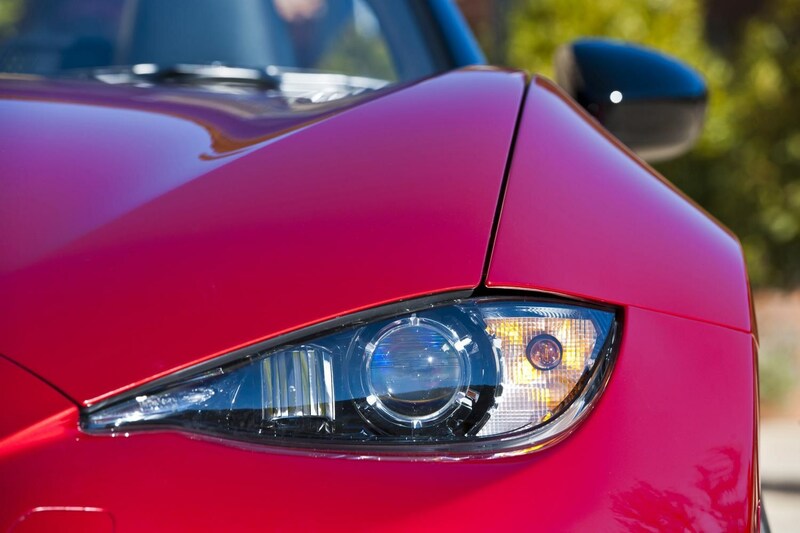 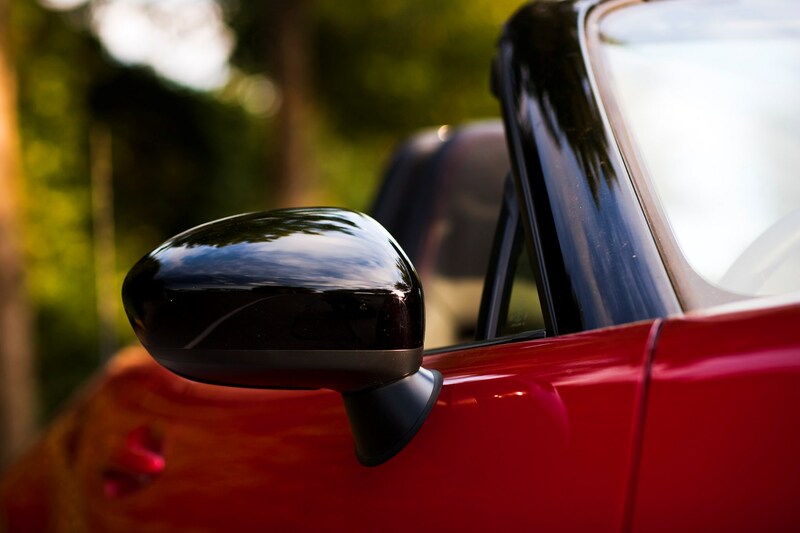 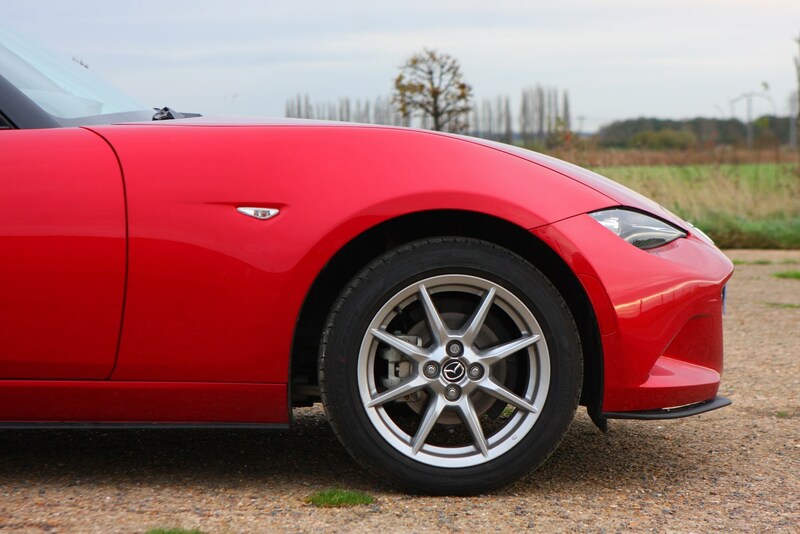 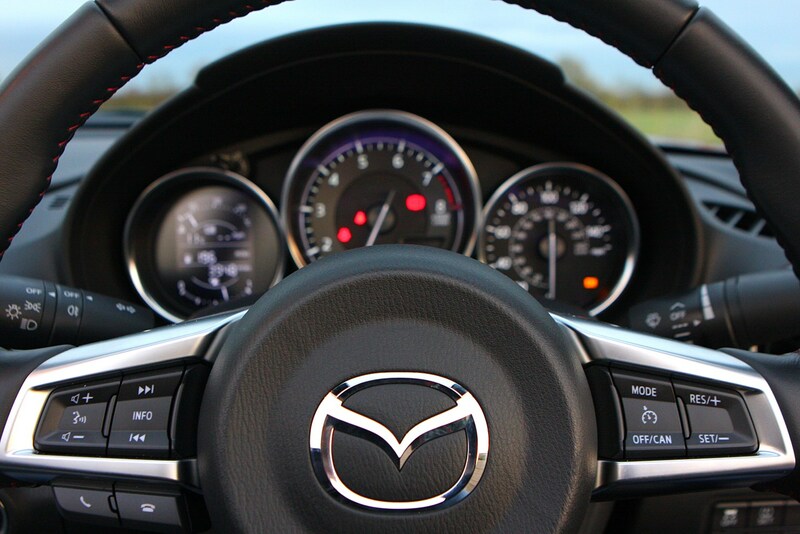 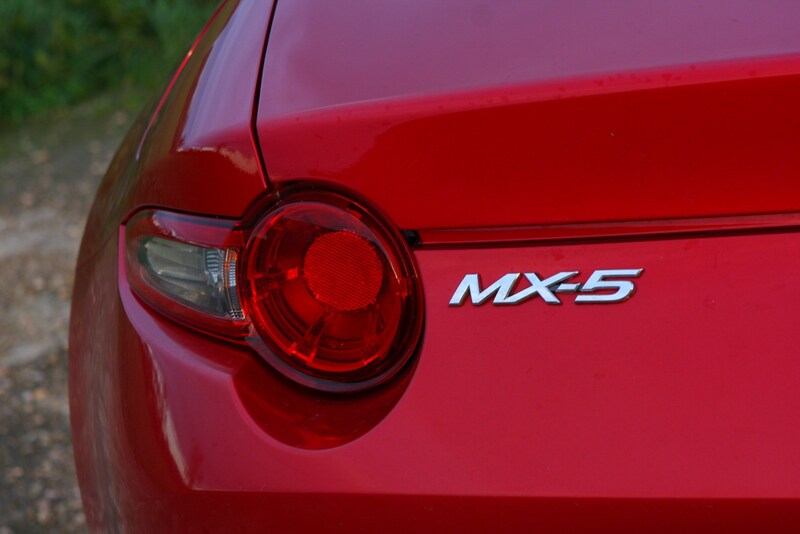 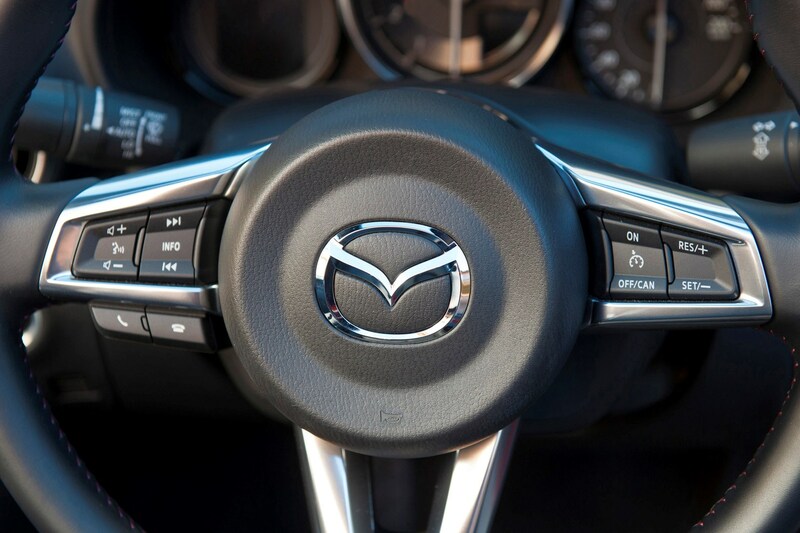 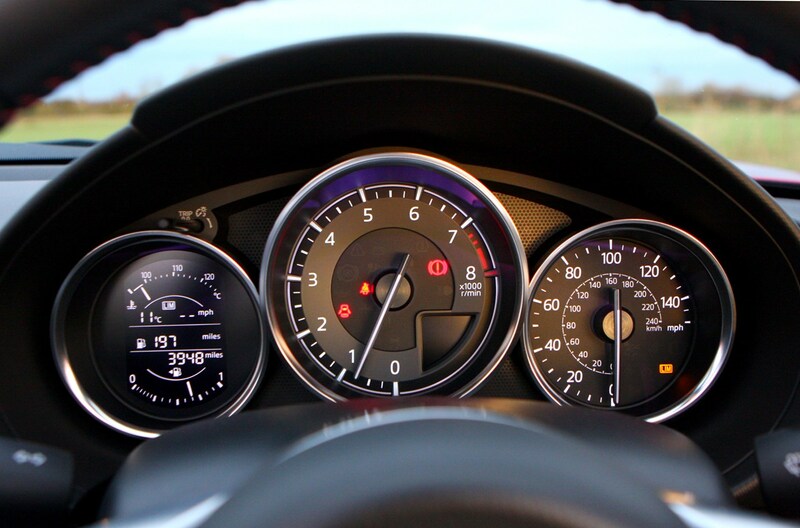 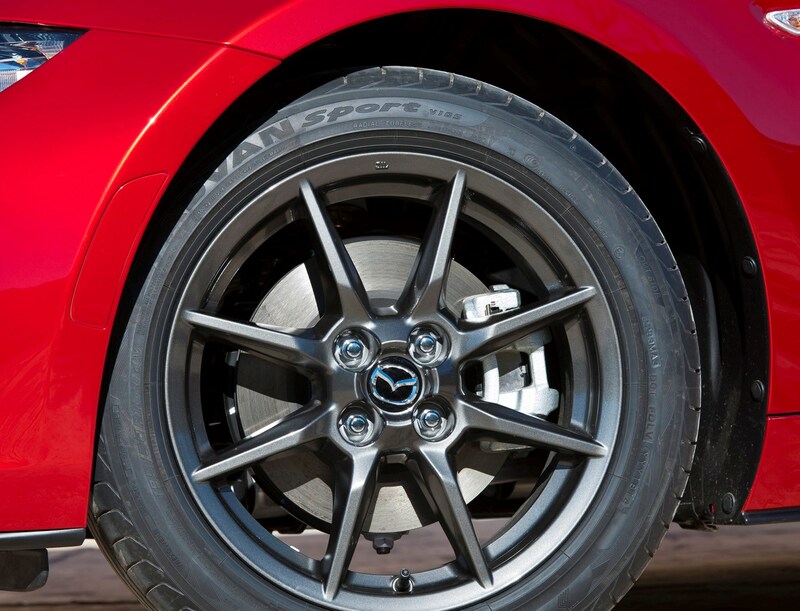 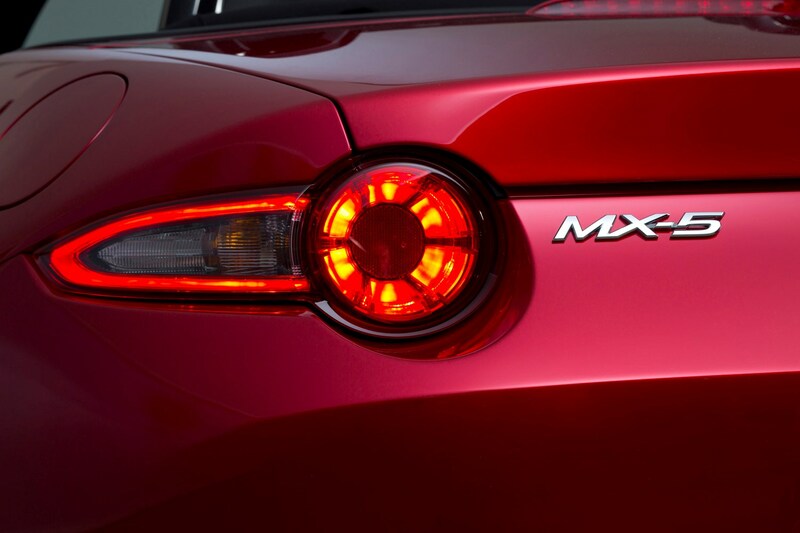 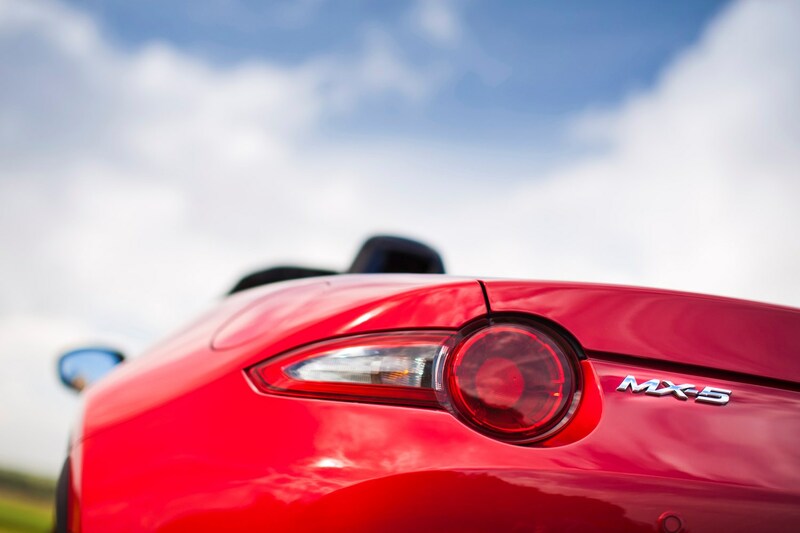 The design is expressive, and even standing still the MX-5 looks lithe, alert and ready to go. 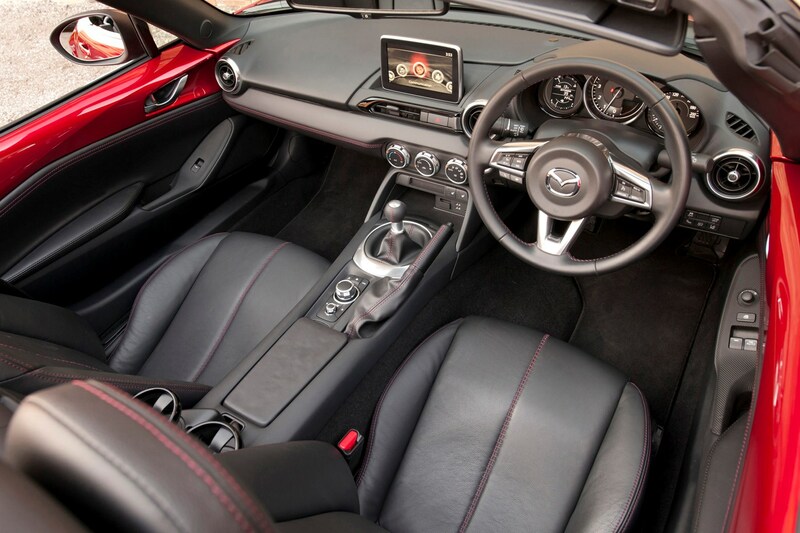 The cabin is the shortest in MX-5 history and though it can feel slightly snug at times, the simple detailing and layout reinforce this car’s fun focus, and it feels entirely robust. 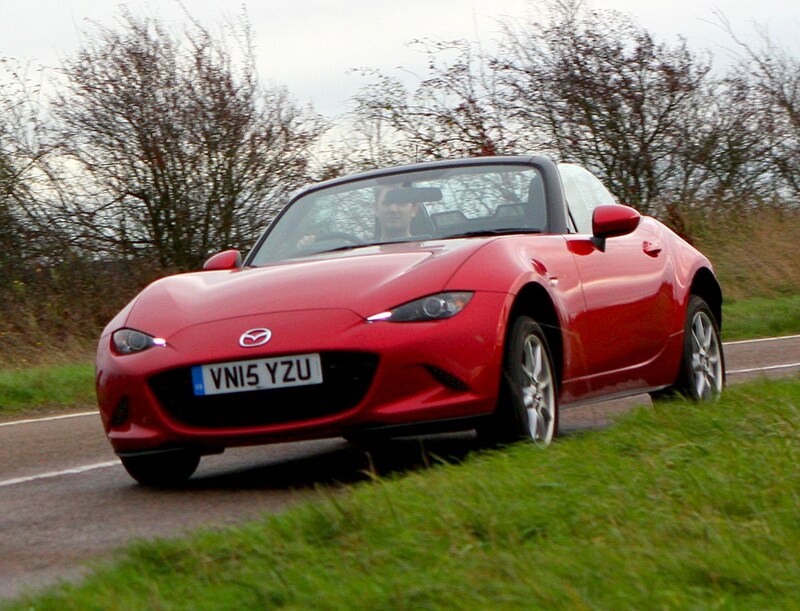 Should you buy a Mazda MX-5? 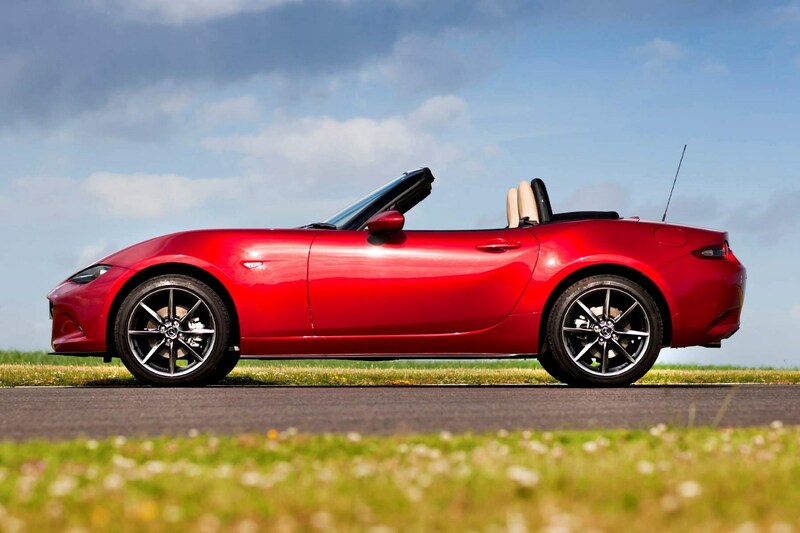 The MX-5 is an affordable way to own a fun, convertible sports car. 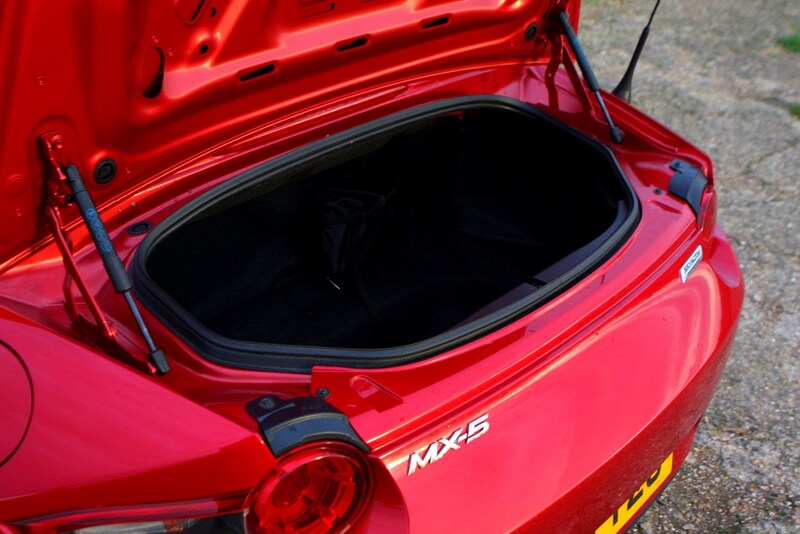 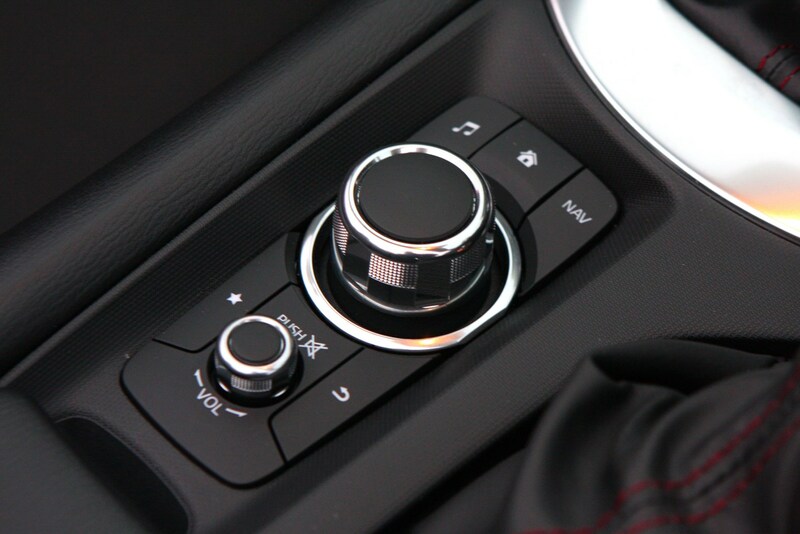 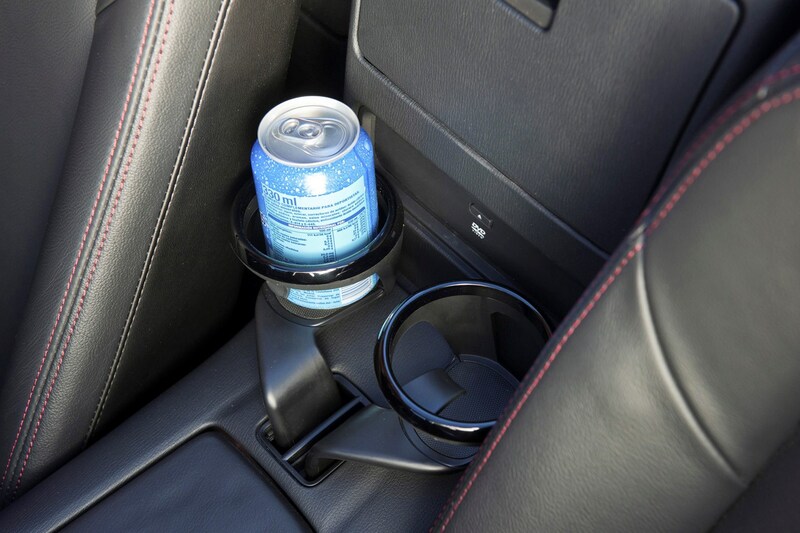 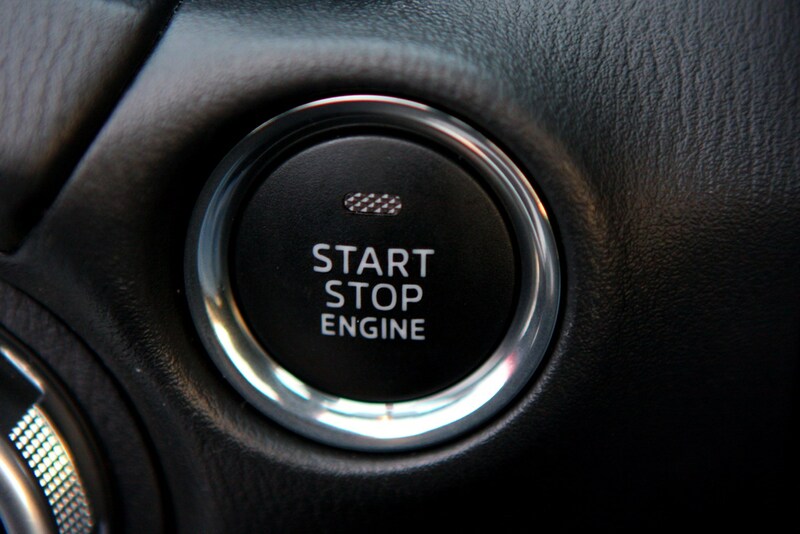 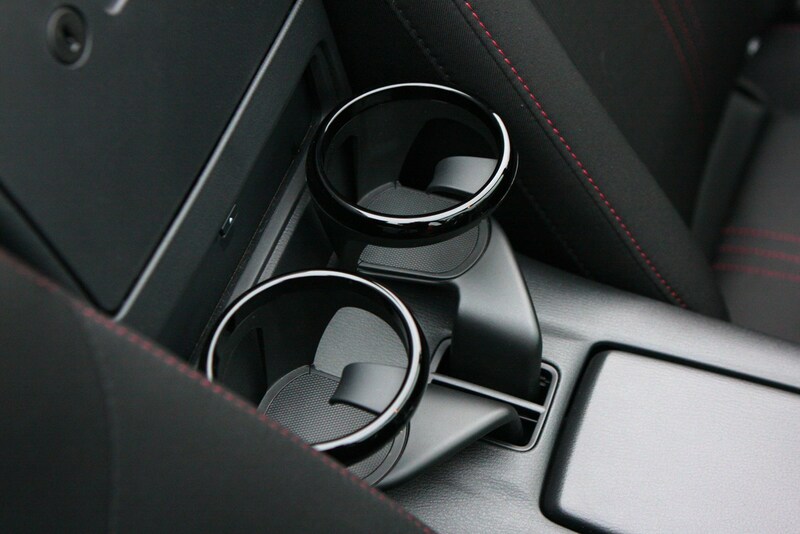 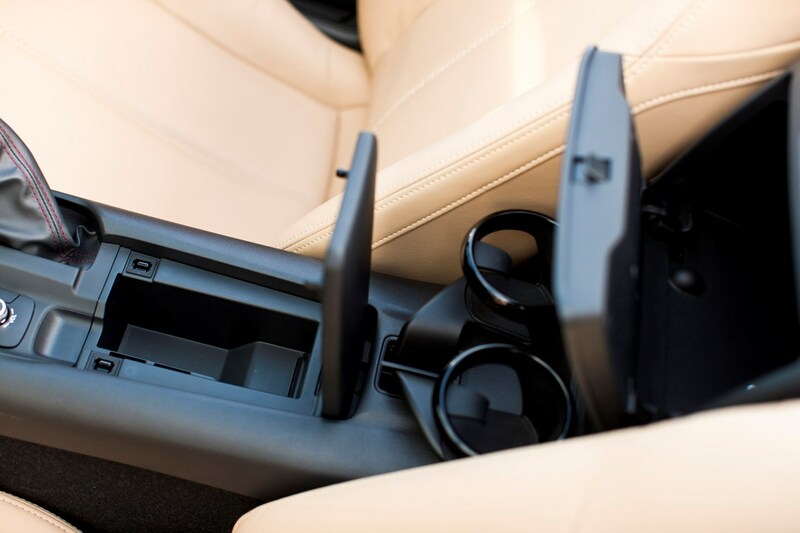 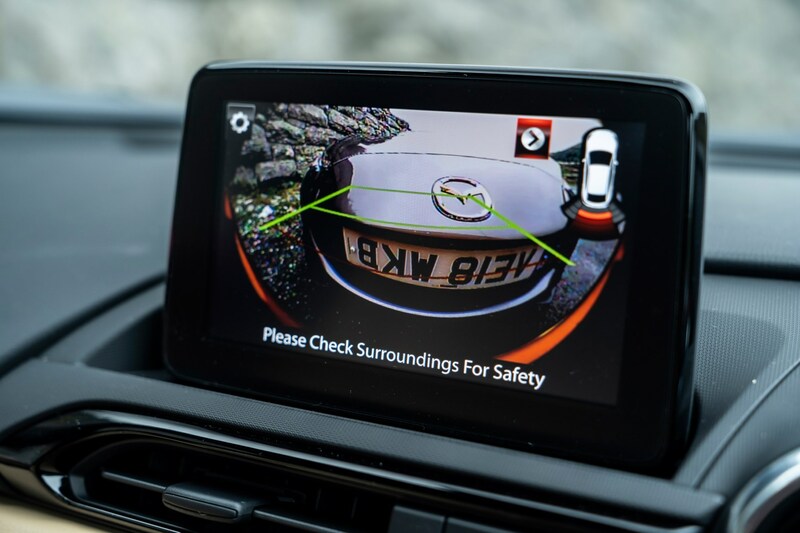 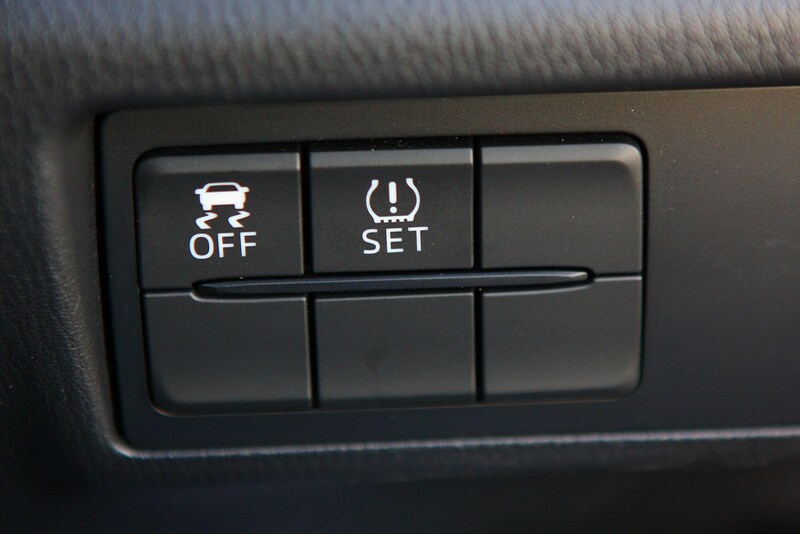 Using it as your main car might present issues, since it has such a compact cabin and small boot, but you quickly forget about this once you get behind the wheel. 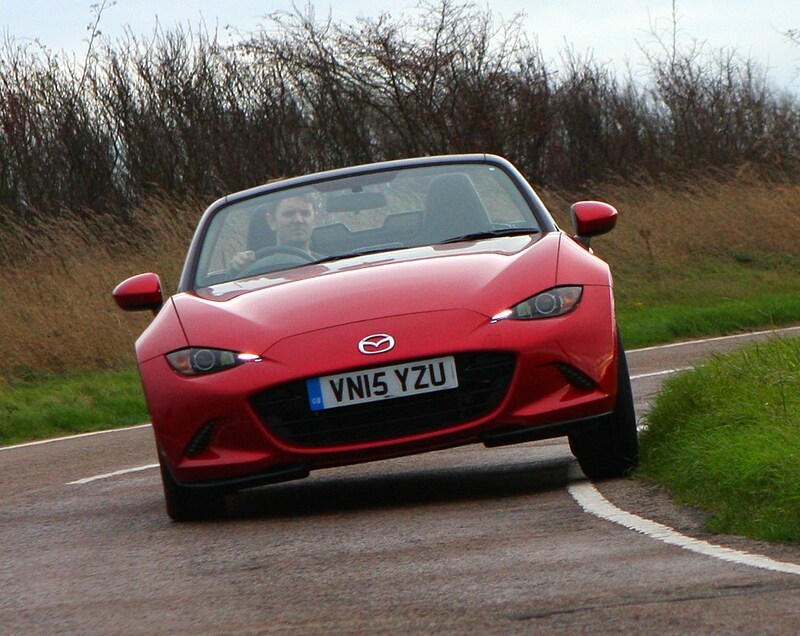 It’s really enjoyable to drive on any road. 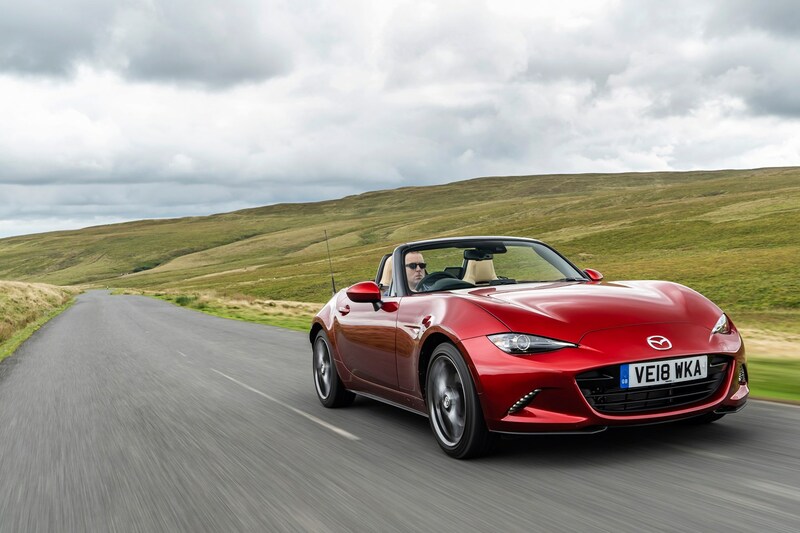 The new, more powerful 2.0-litre model introduced in late 2018 is now the top choice, but since you don’t have to drive the MX-5 quickly to enjoy it, slower and less expensive models remain enormously compelling. 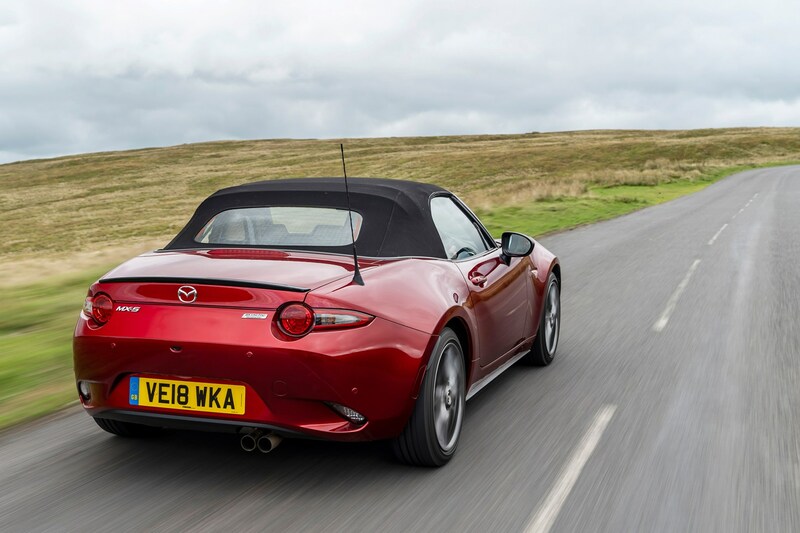 It's great value across the range, too.